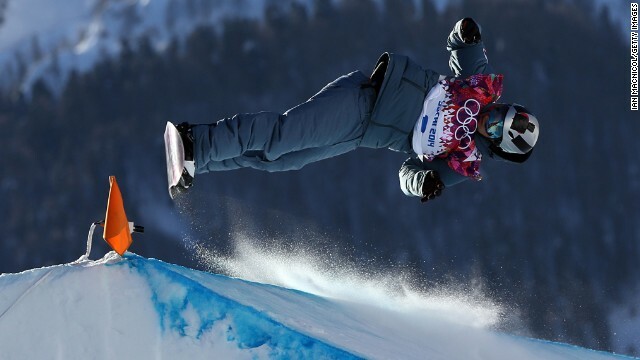 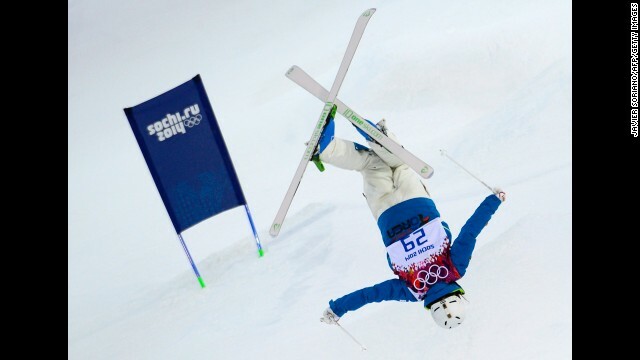 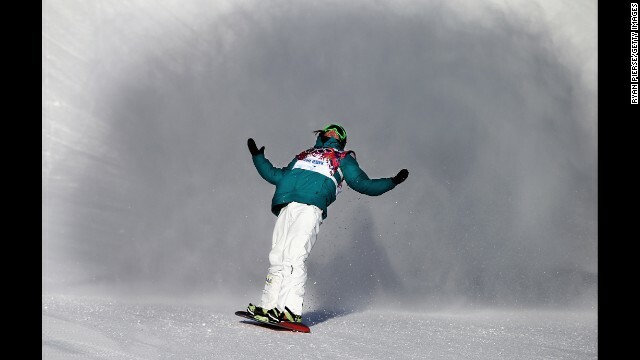 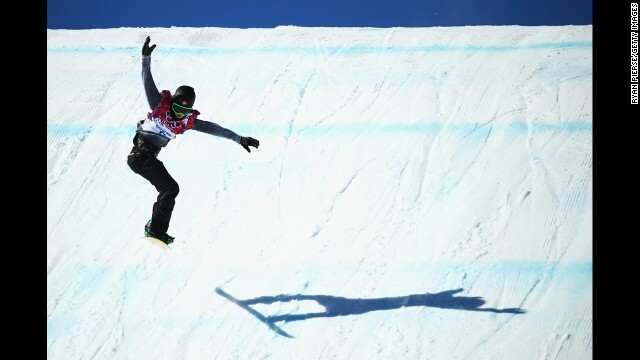 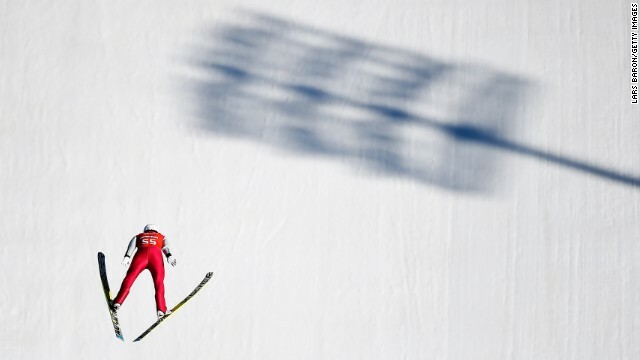 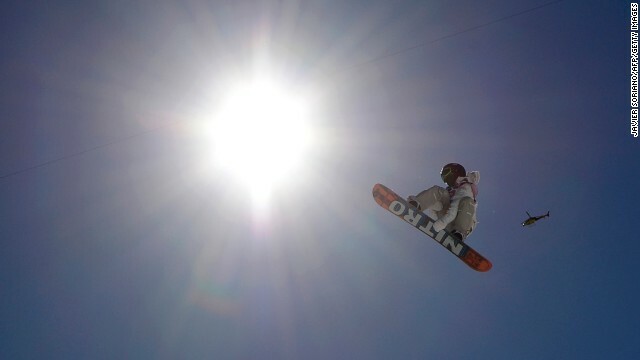 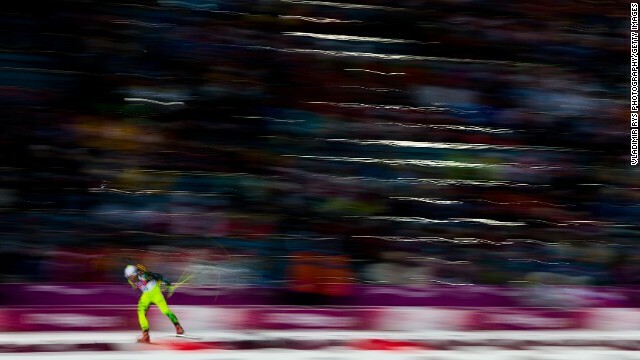 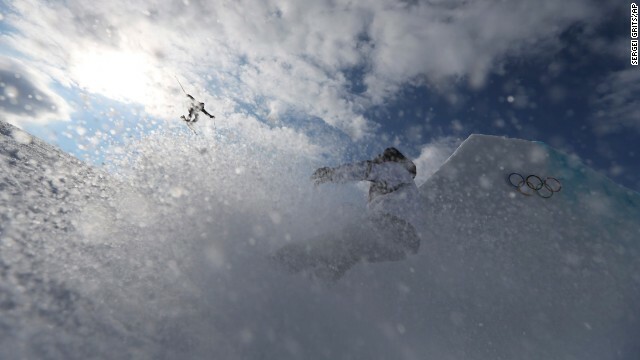 Sage Kotsenburg celebrates after completing his run during the final of the snowboard slopestyle in Sochi. 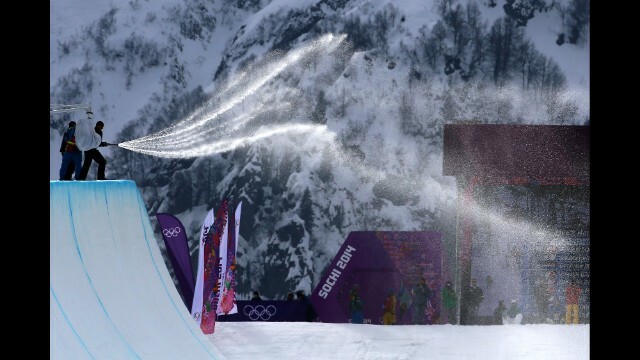 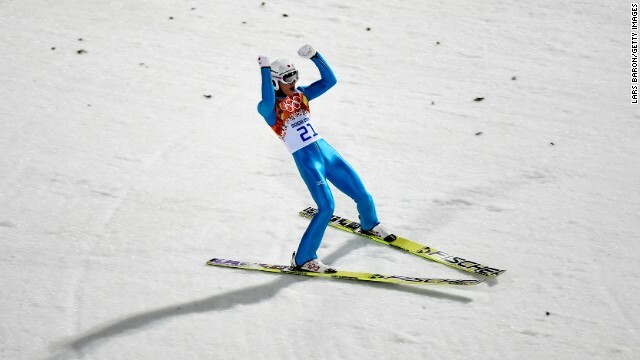 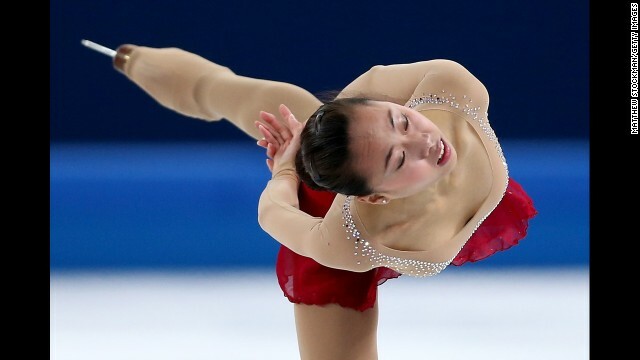 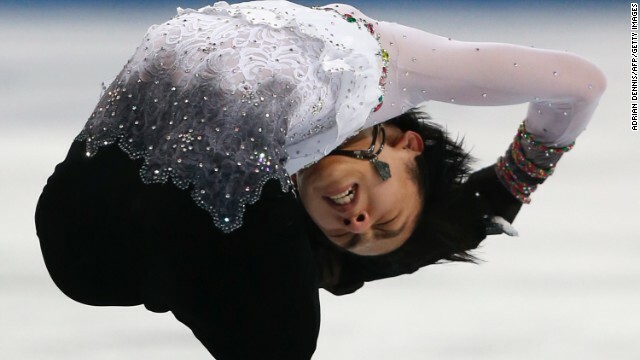 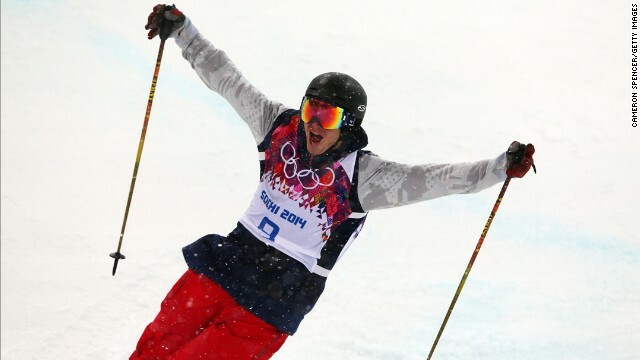 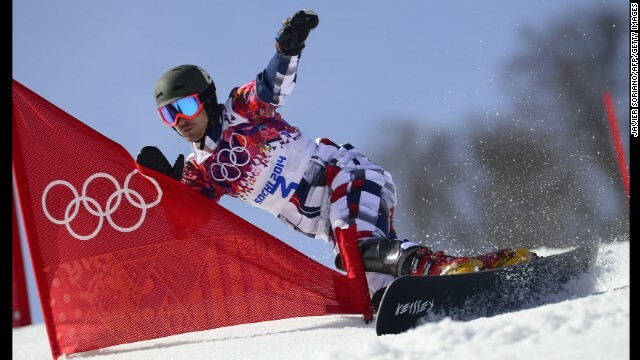 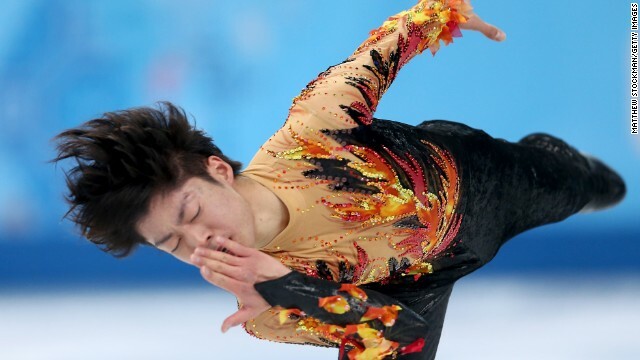 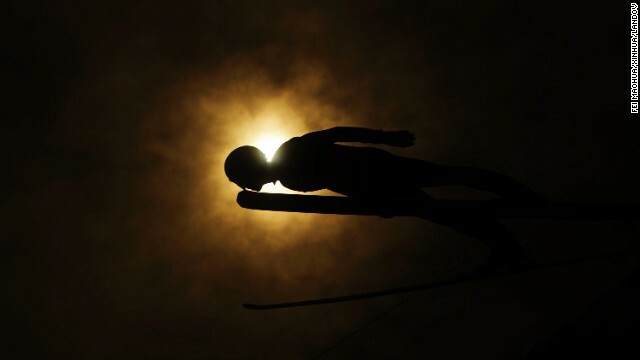 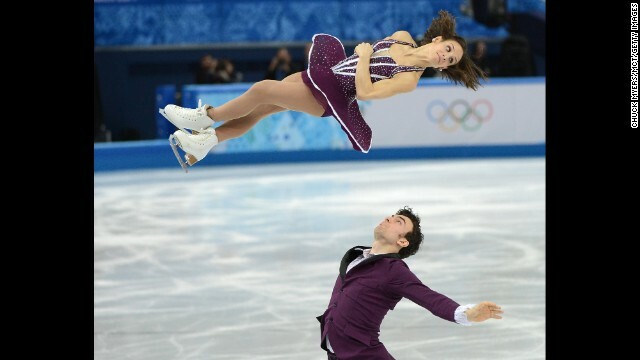 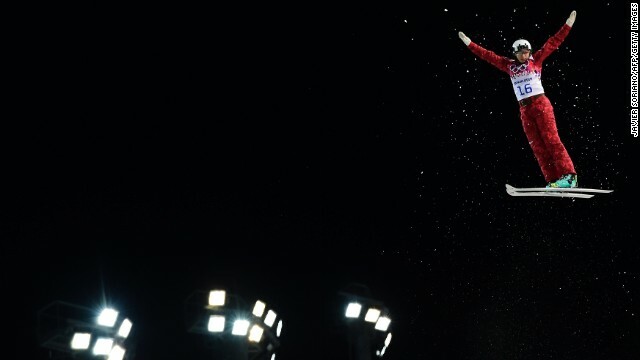 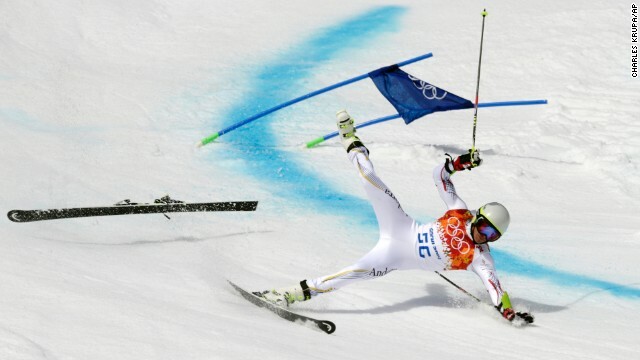 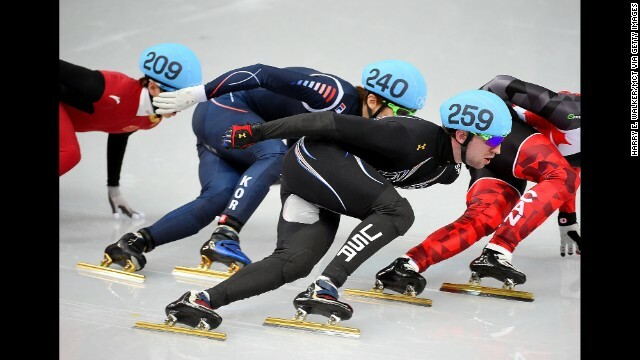 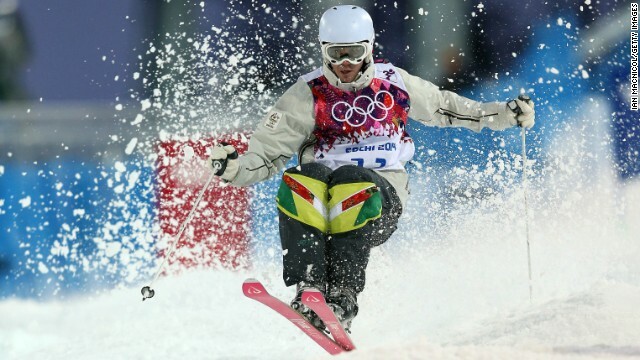 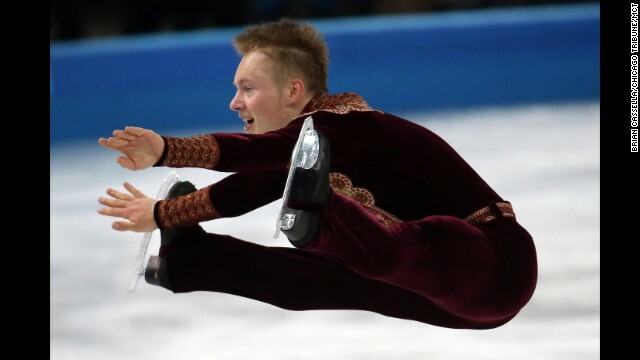 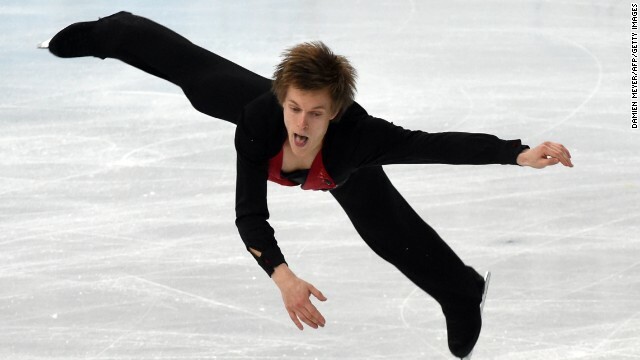 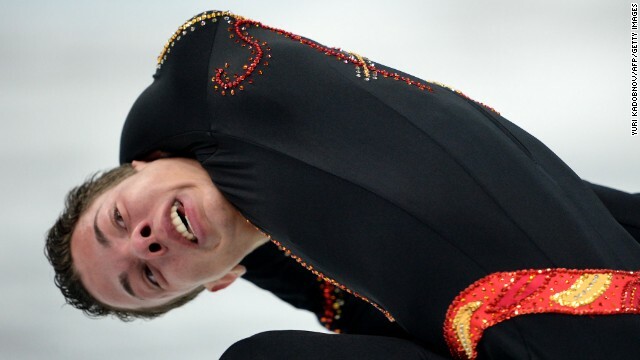 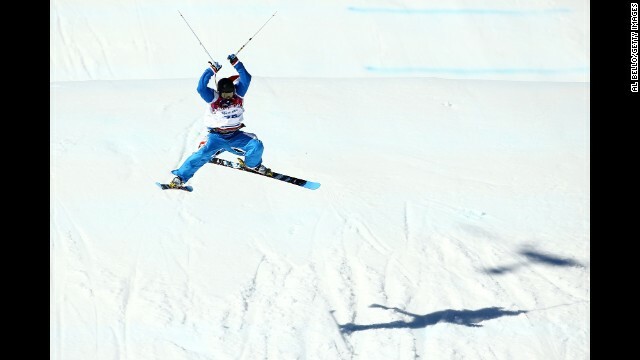 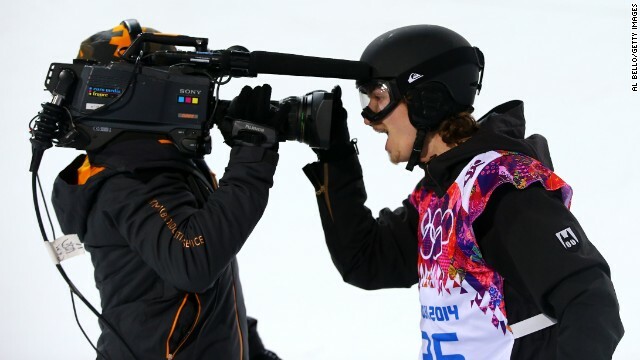 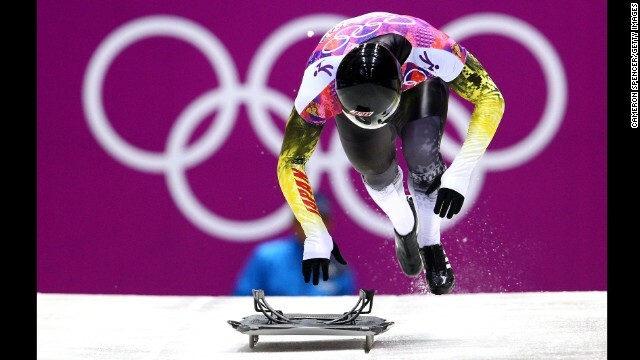 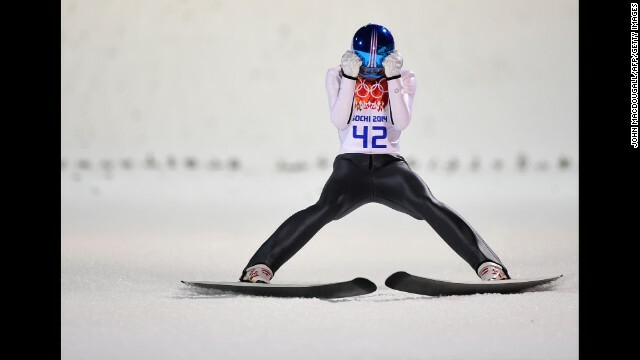 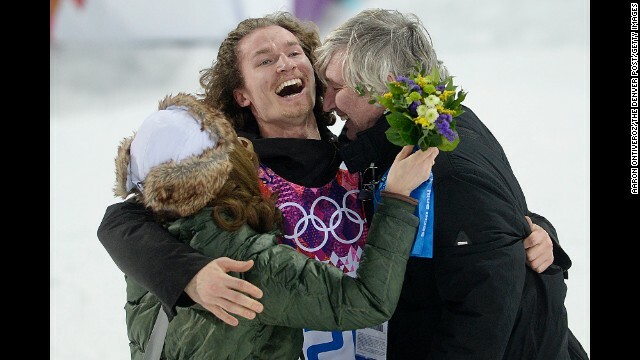 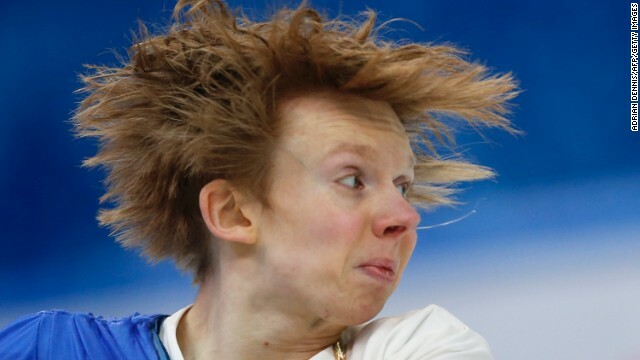 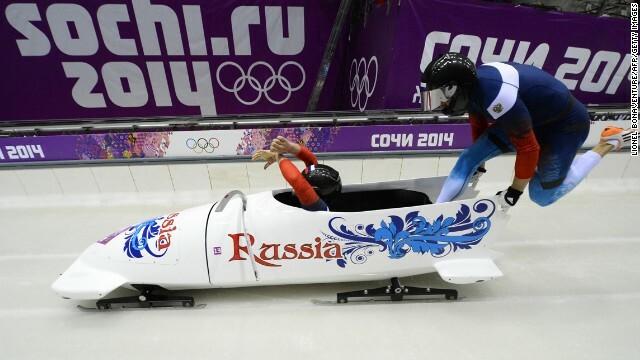 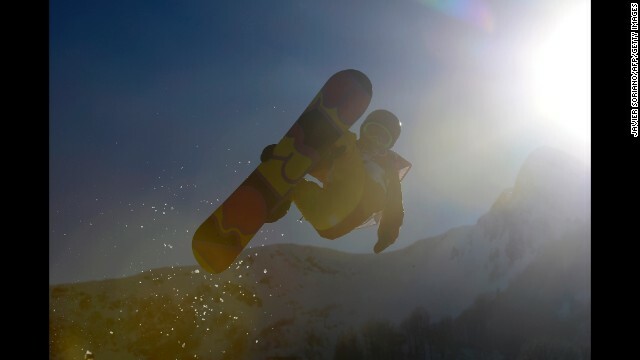 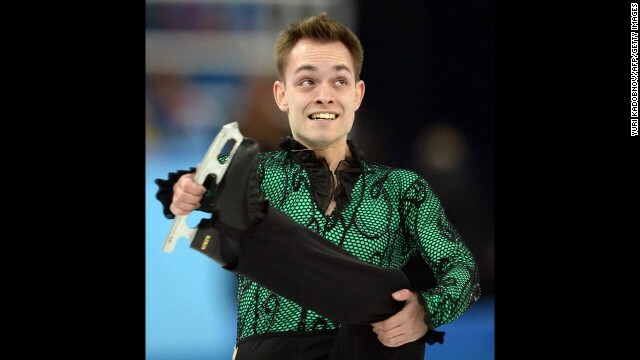 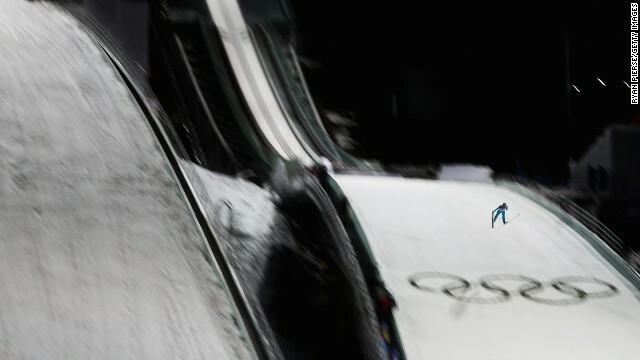 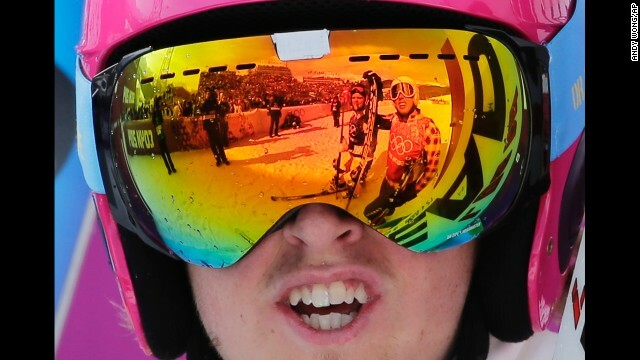 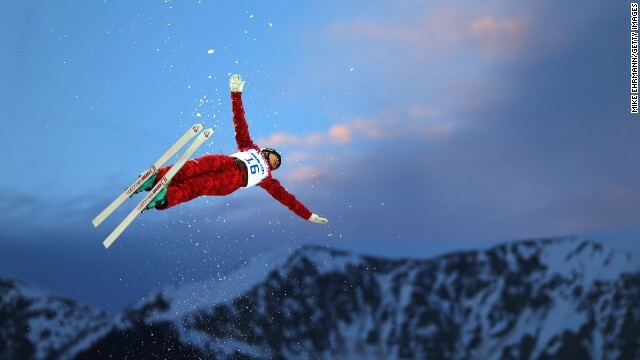 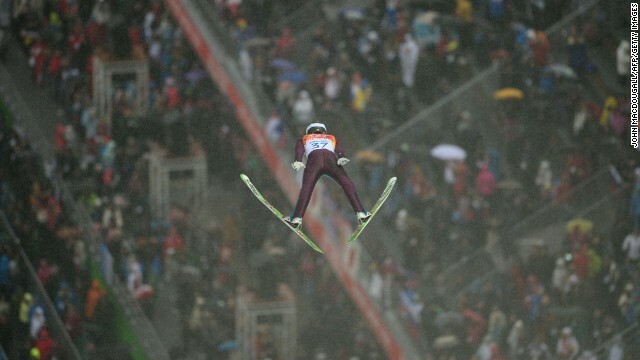 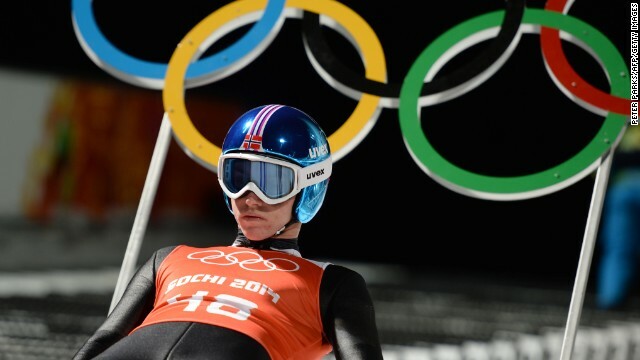 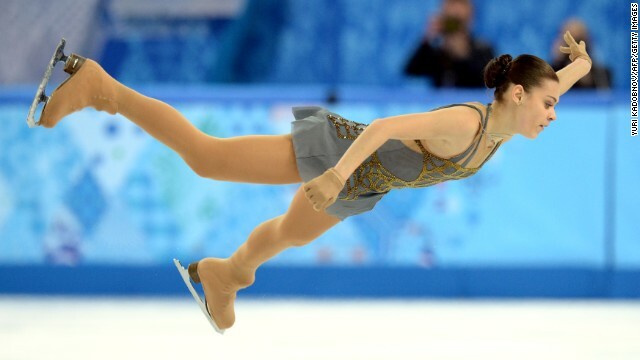 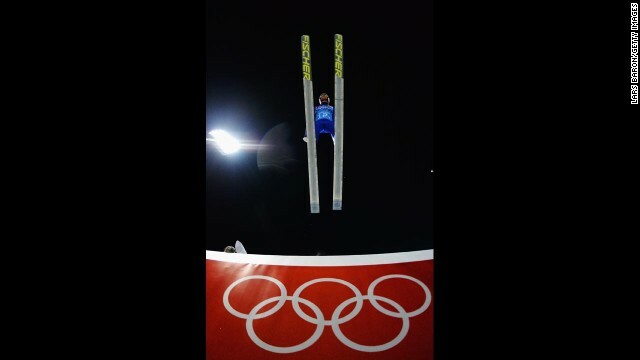 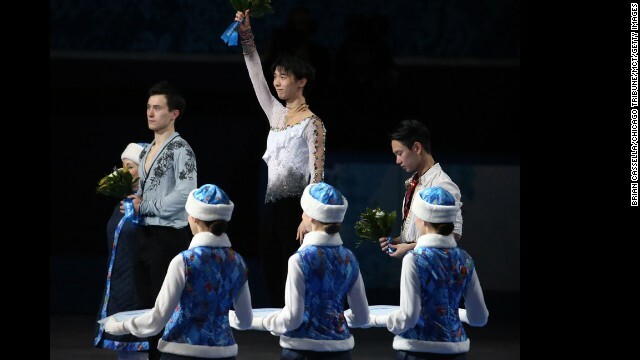 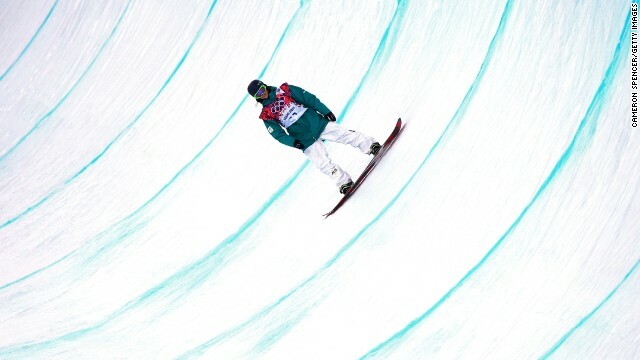 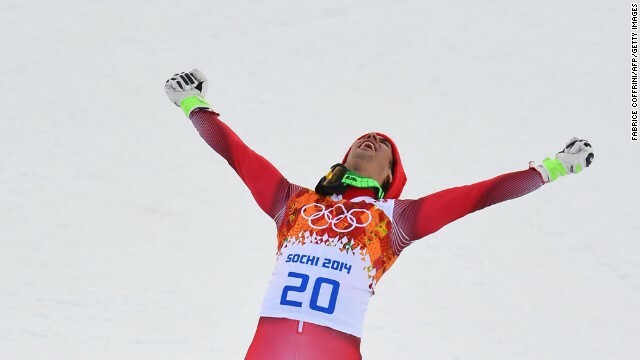 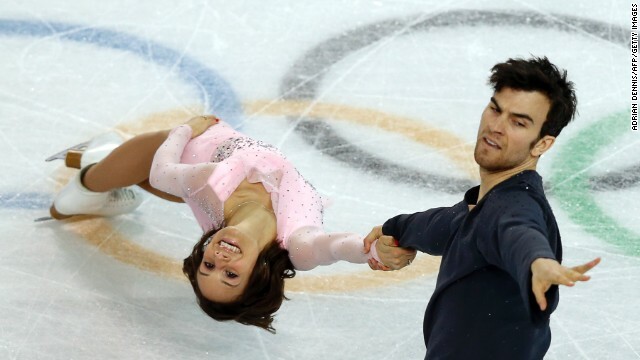 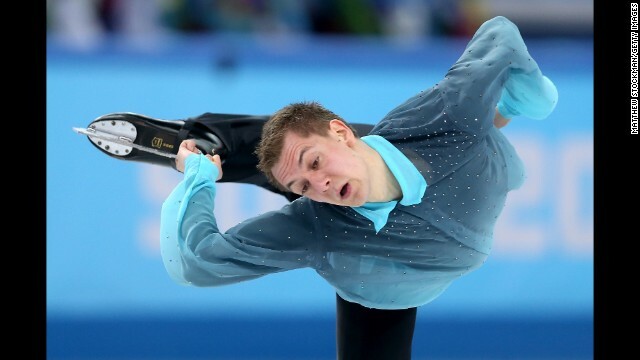 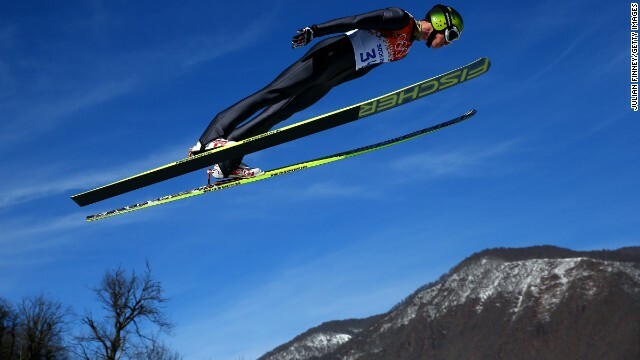 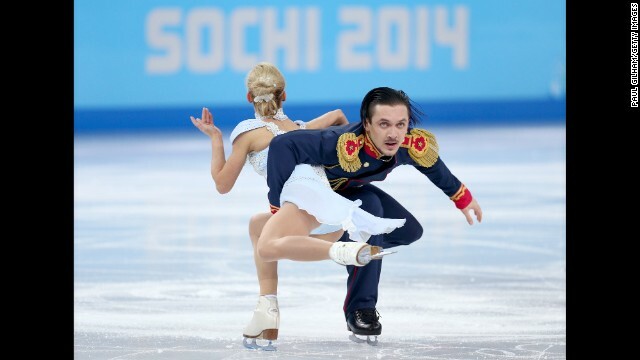 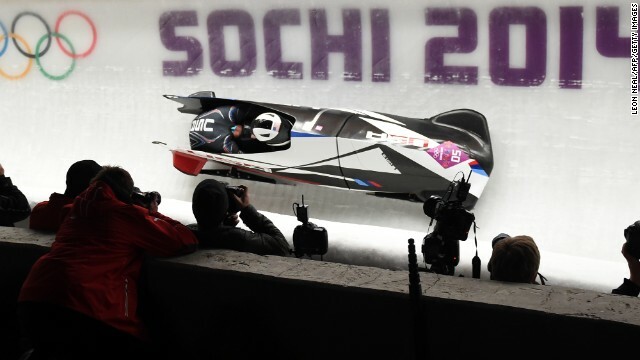 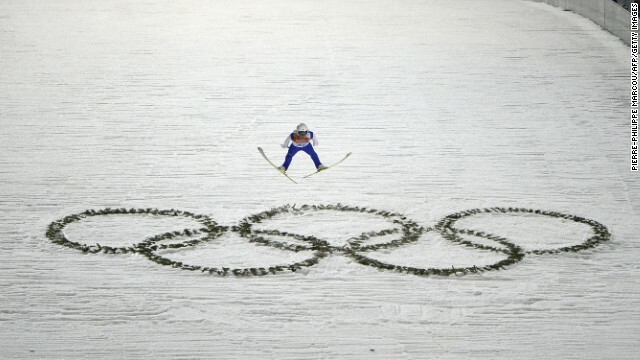 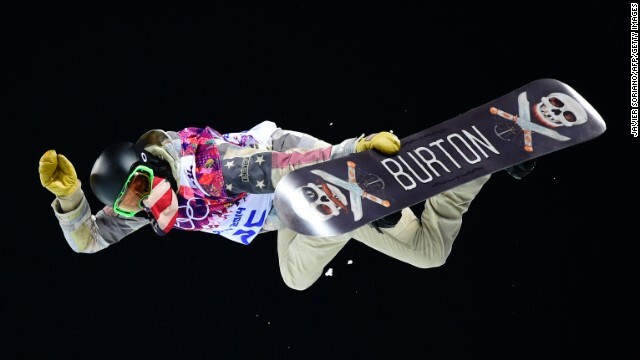 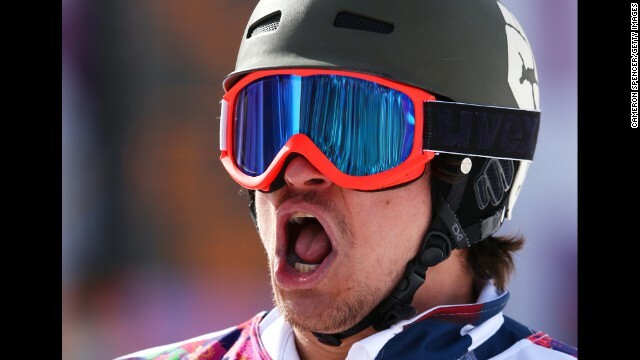 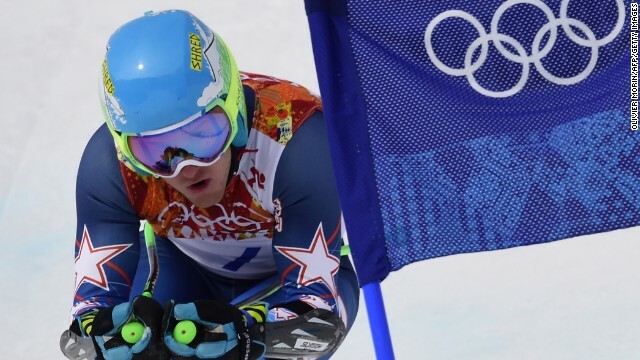 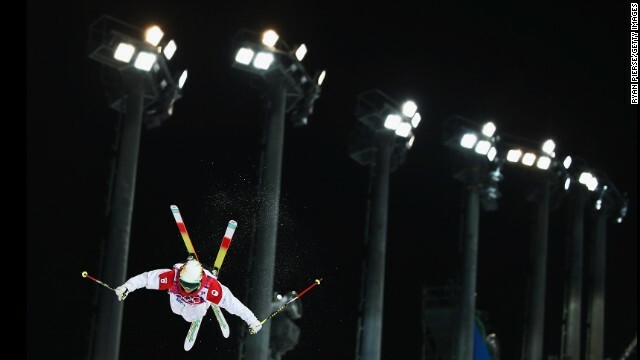 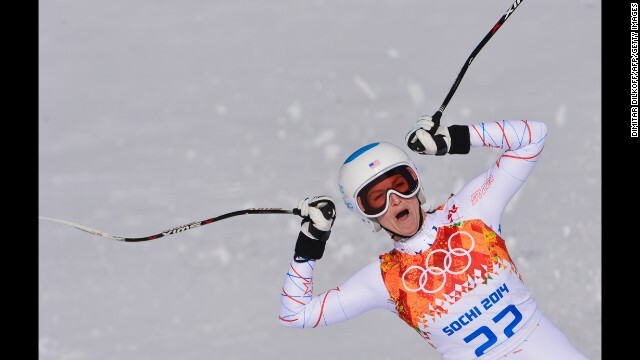 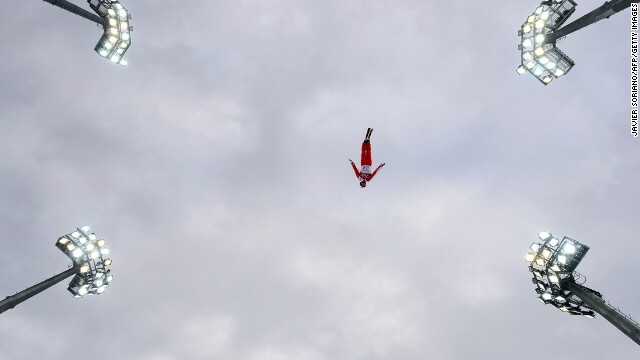 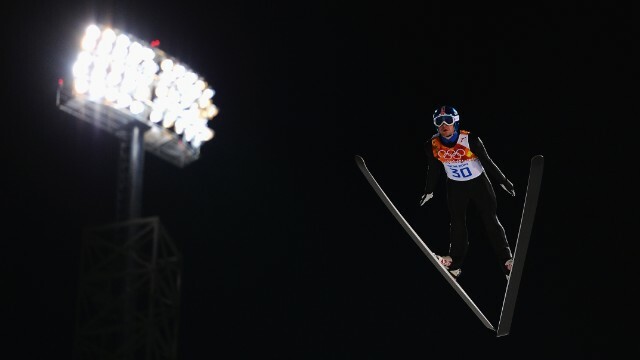 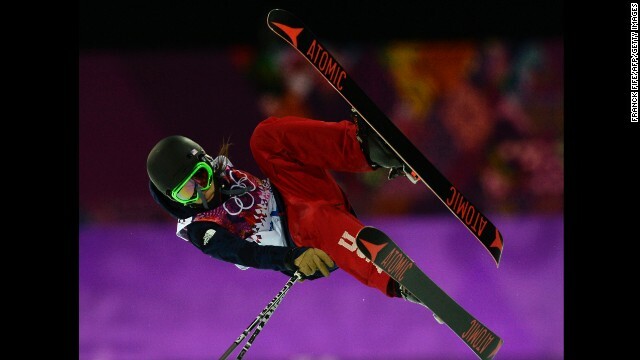 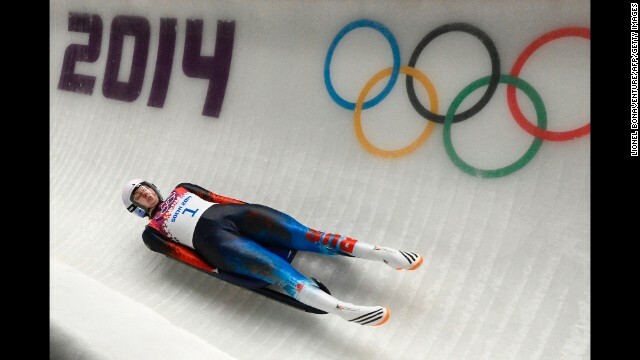 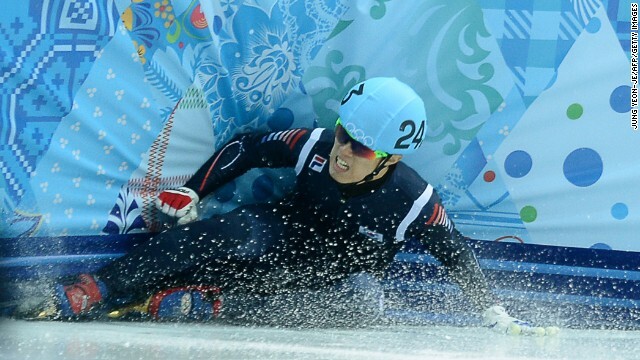 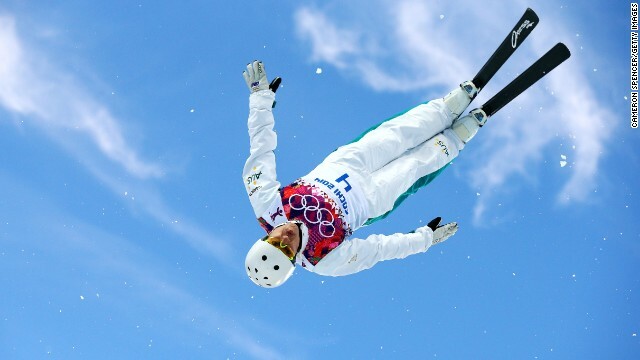 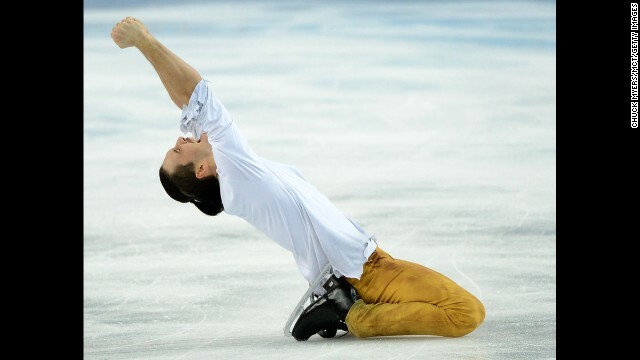 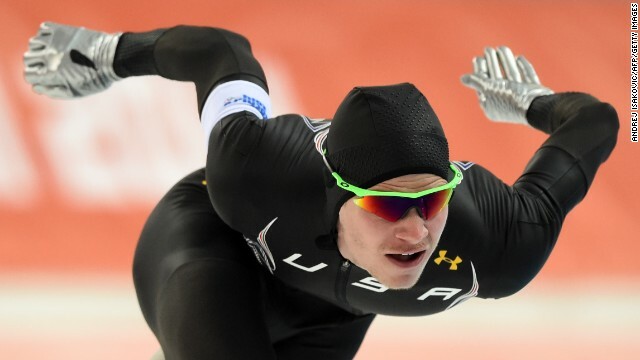 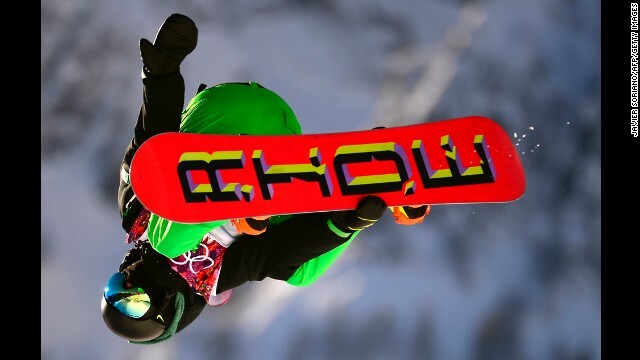 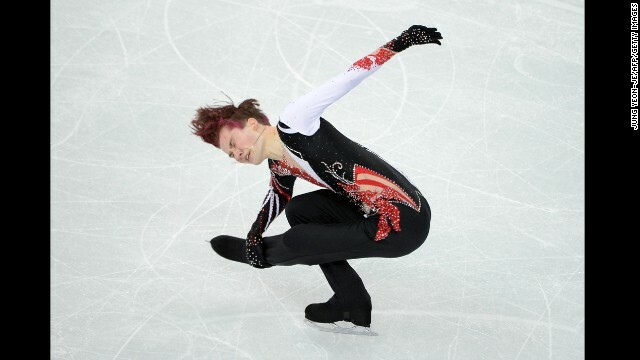 He liked it and so did the judges as the 20-year-old American clinched the first gold of the 2014 Winter Games. 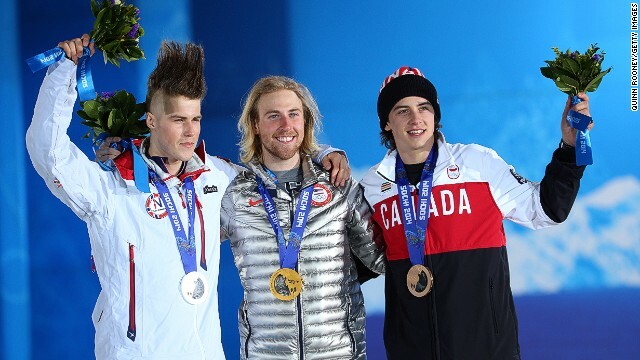 (From left to right) Silver medalist Staale Sandbech of Norway, gold medalist Sage Kotsenburg and bronze medalist Mark McMorris of Canada wave to the crowds from the podium following snowboard slopestyle medal ceremony. 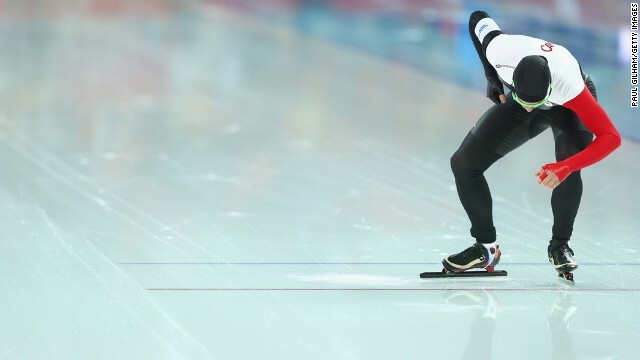 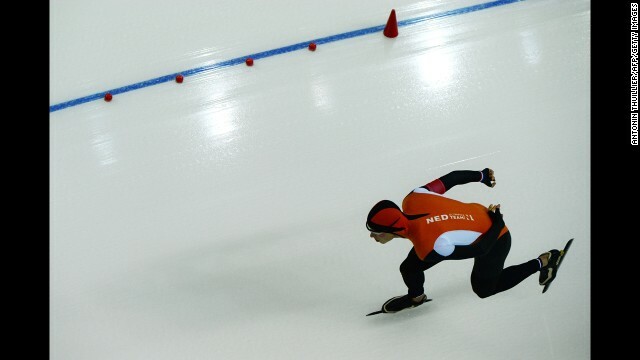 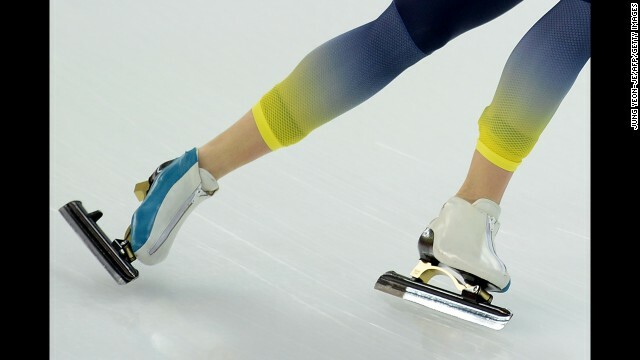 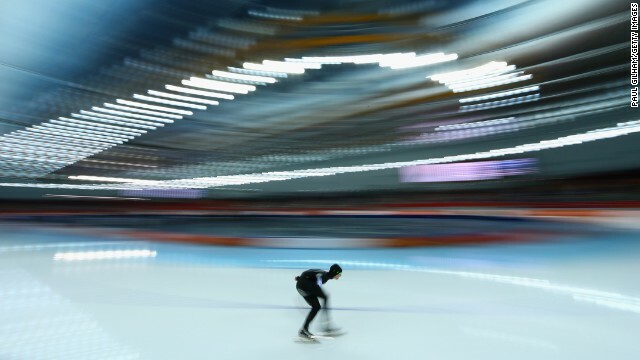 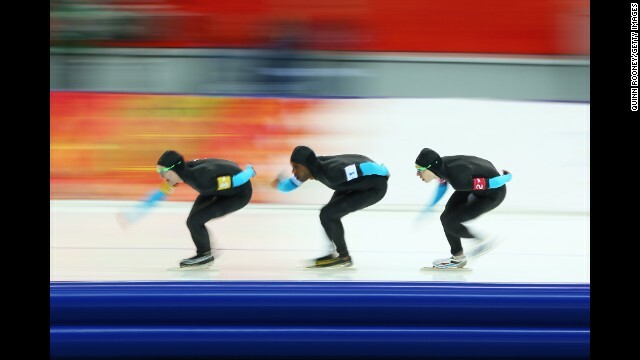 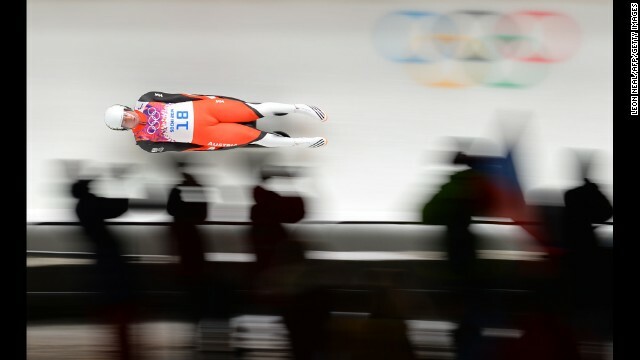 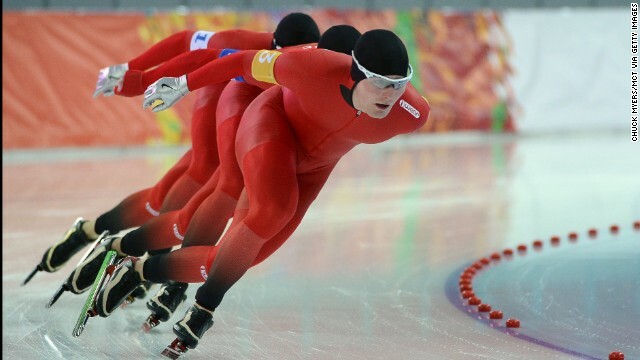 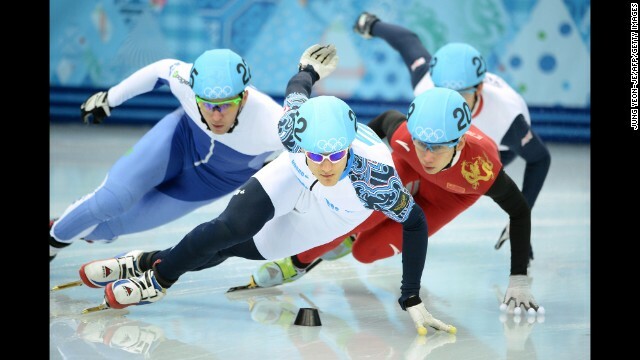 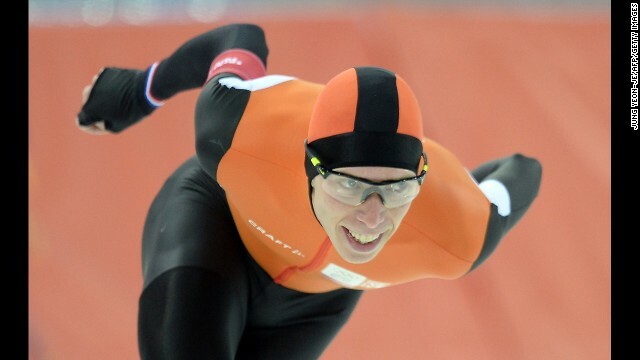 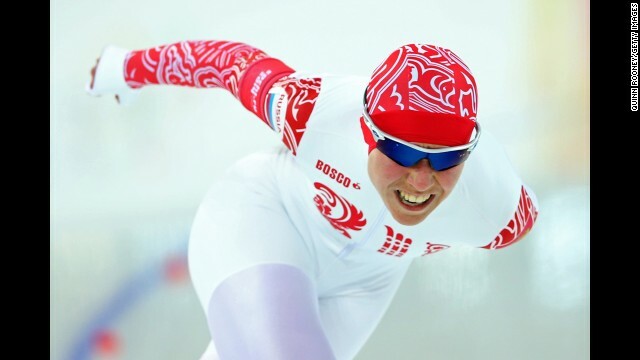 Netherlands' Sven Kramer skates his way to gold in the Men's Speed Skating 5000m at the Adler Arena in Sochi. 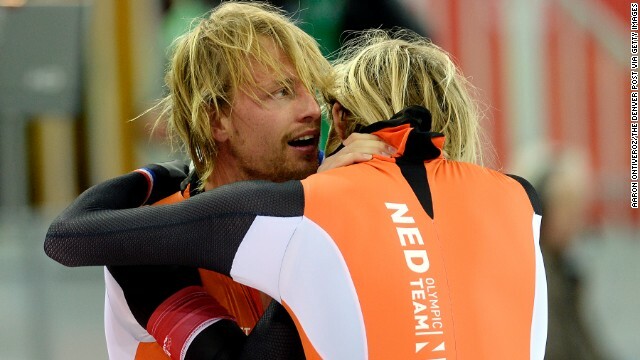 The Dutch completed a clean sweep of the medals in the 5000m. 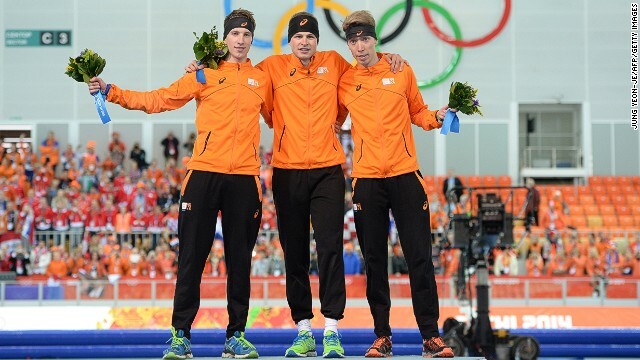 (From left to right) silver medalist Jan Blokhuijsen, Olympic champion Sven Kramer and bronze medalist Jorrit Bergsma. 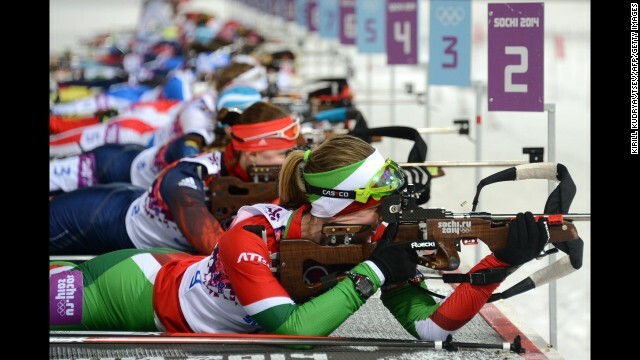 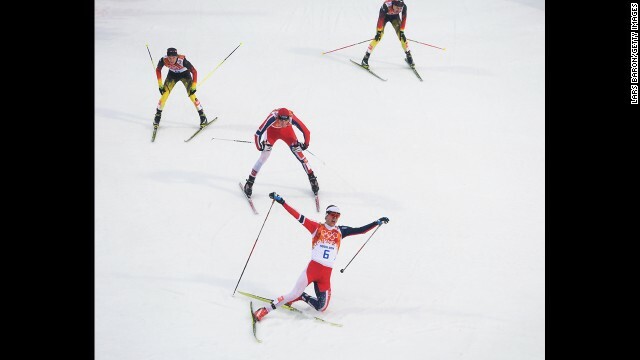 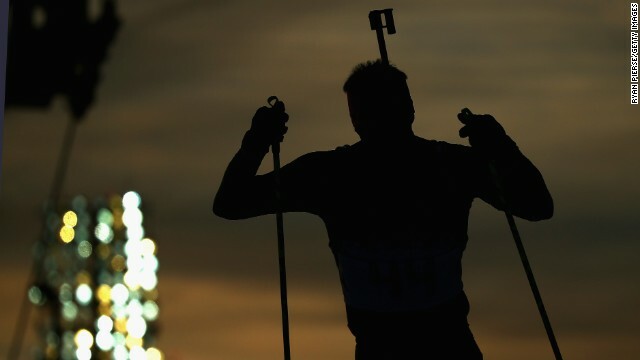 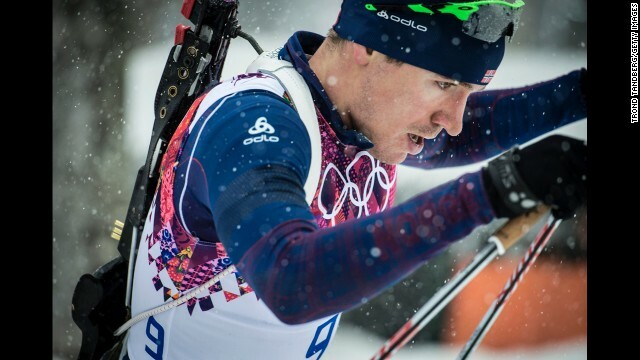 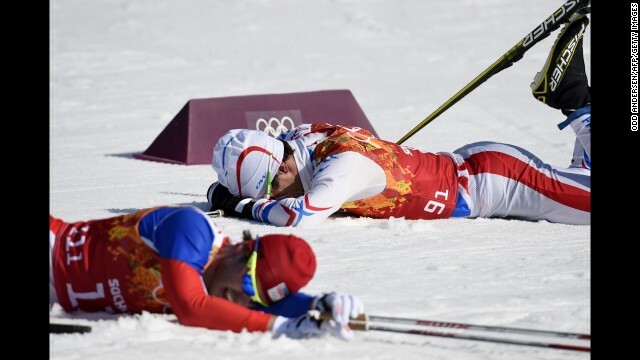 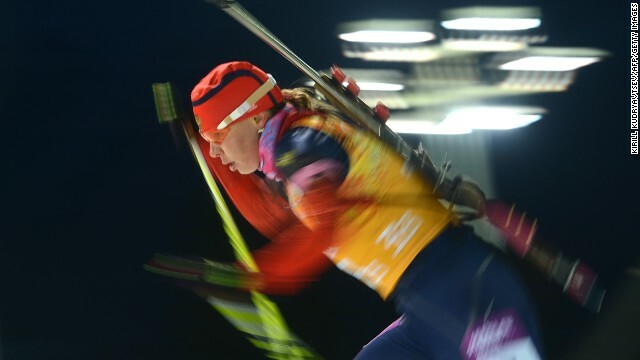 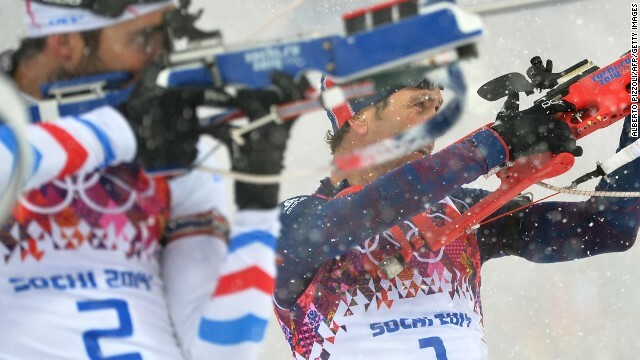 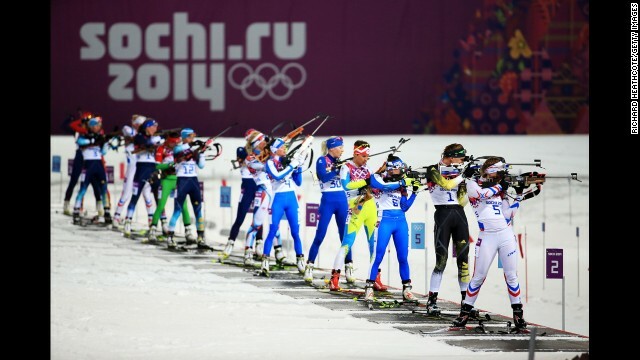 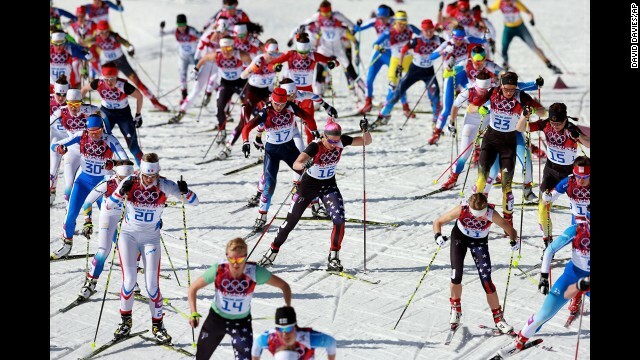 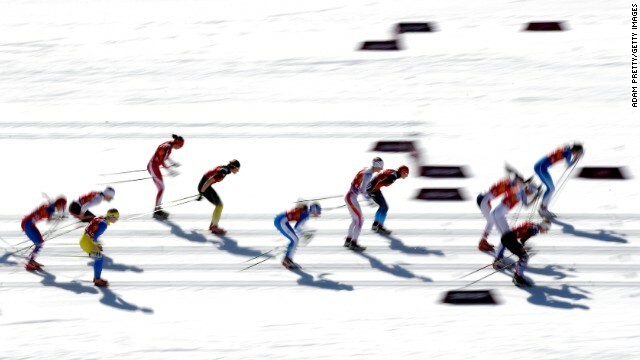 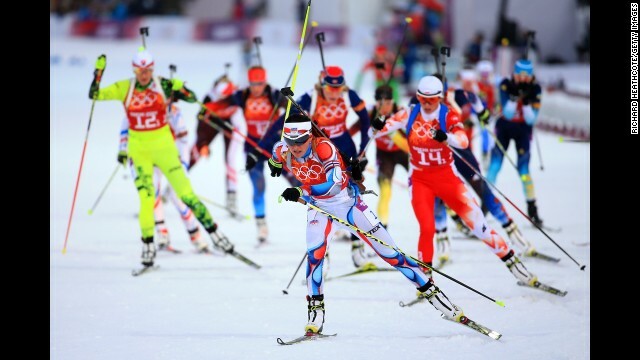 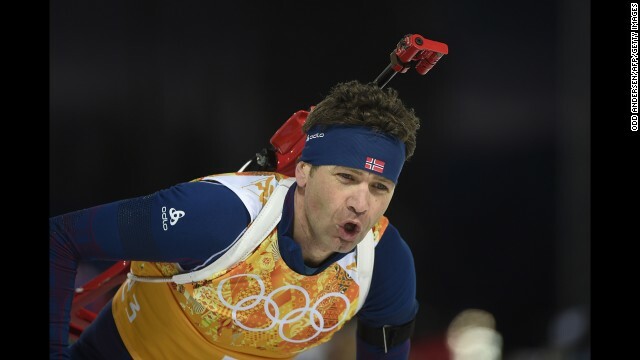 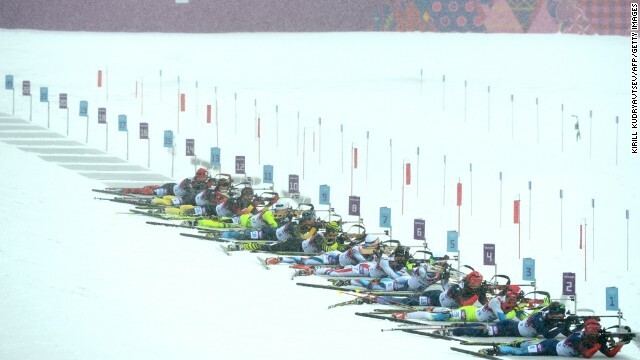 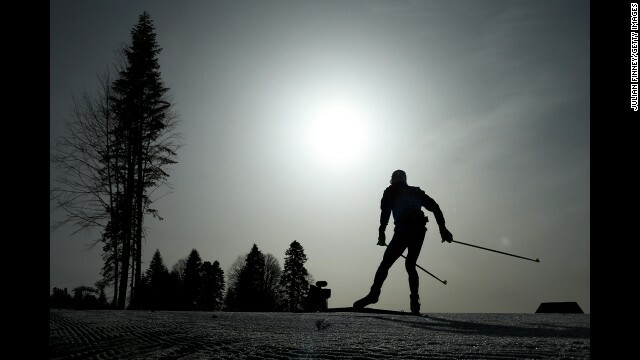 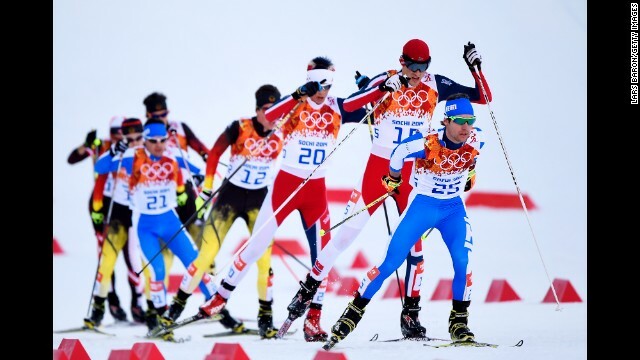 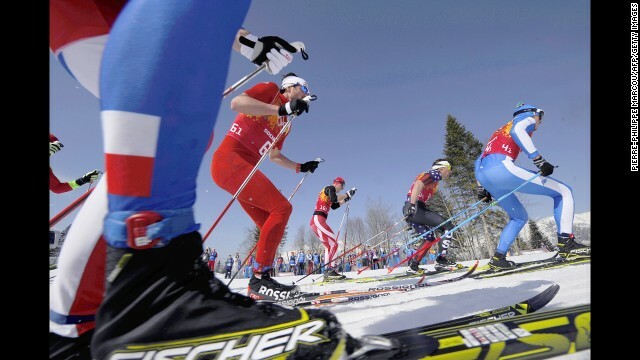 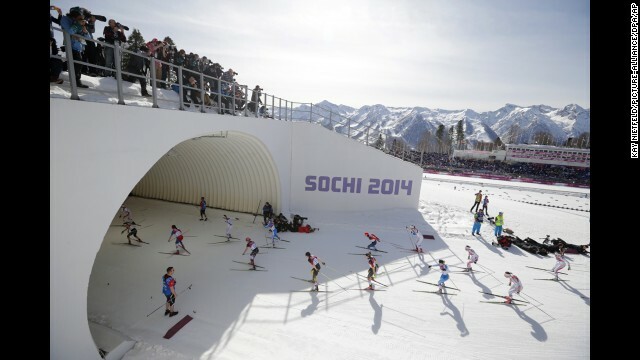 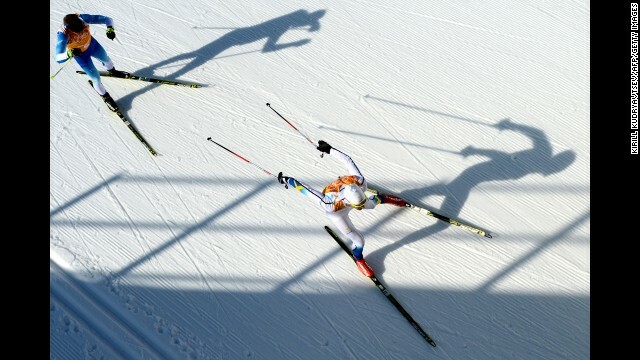 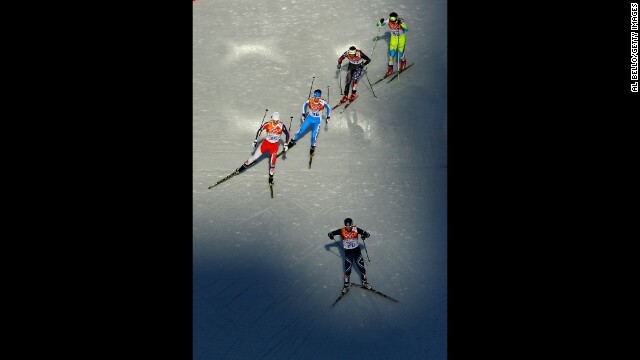 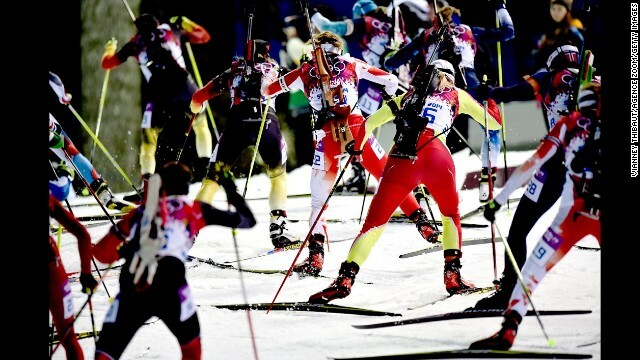 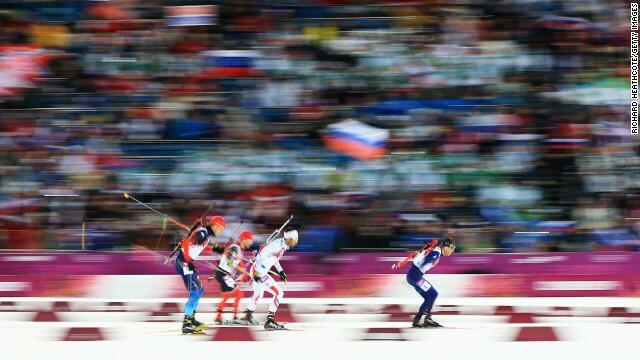 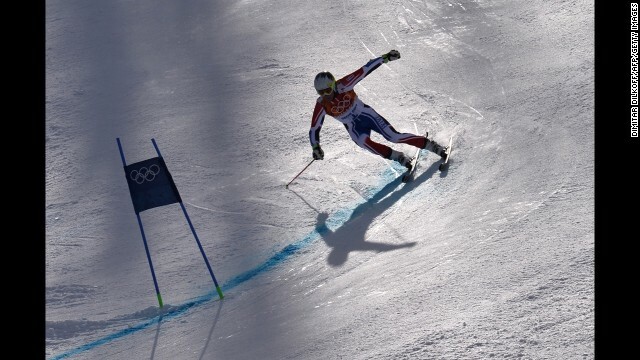 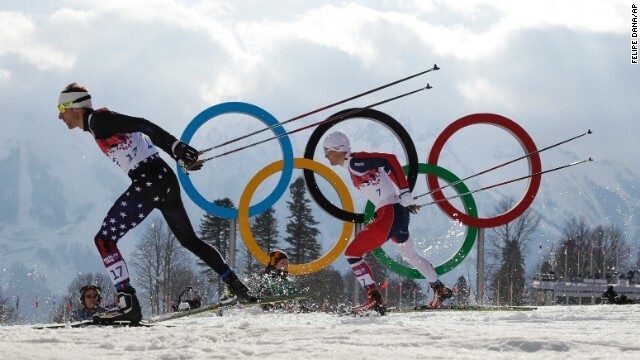 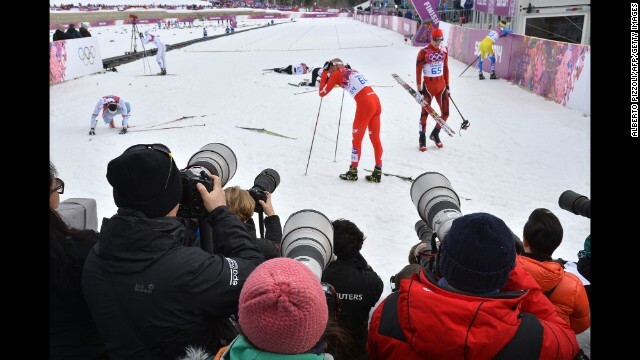 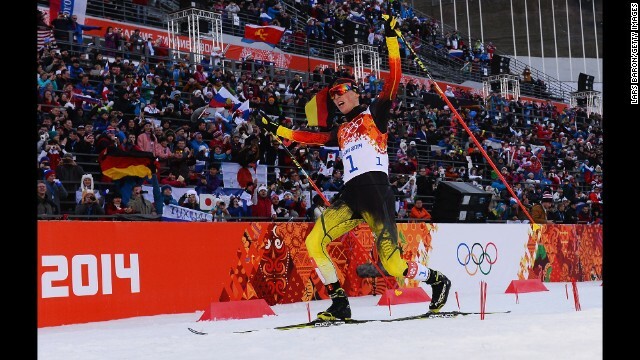 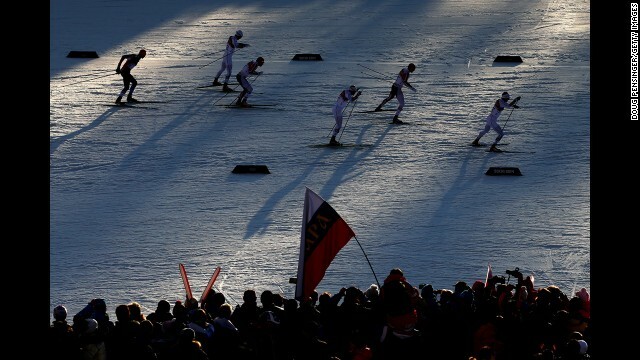 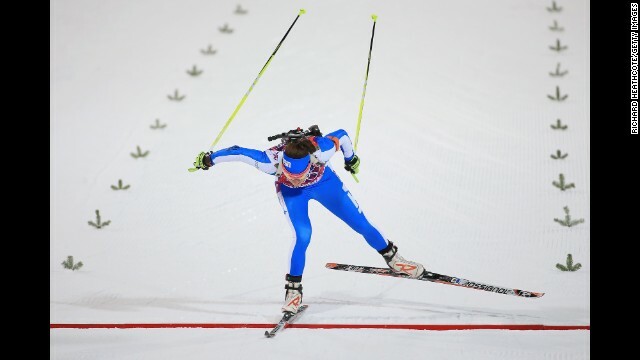 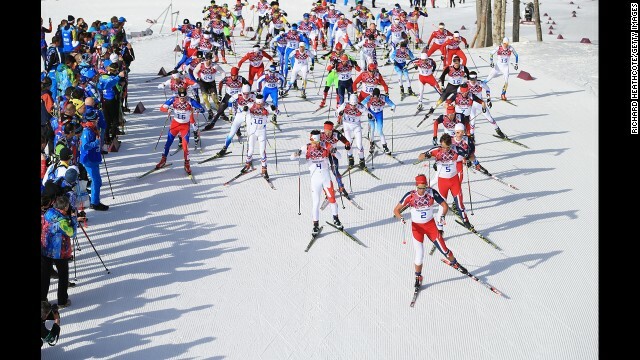 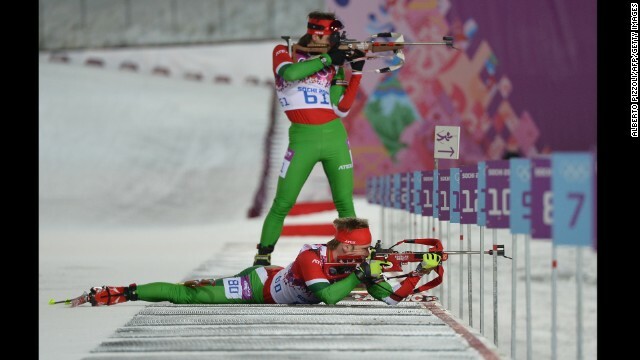 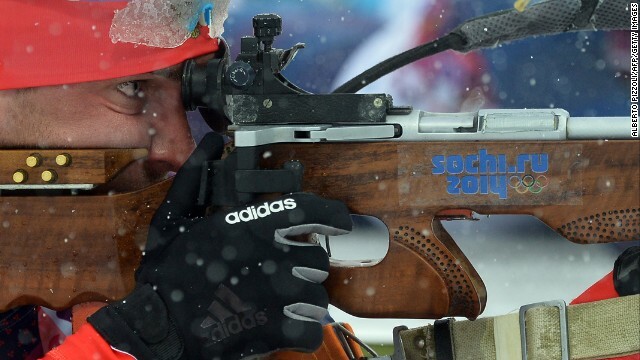 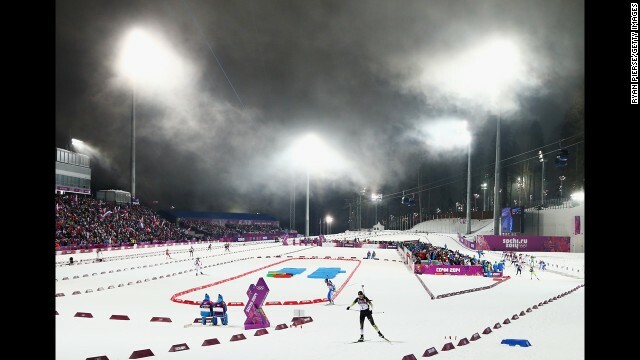 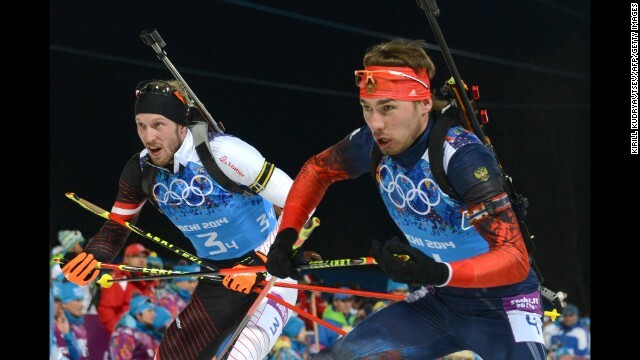 Norway's Ole Einar Bjoerndalen shoots and skis his way to gold in the Men's Biathlon 10 km Sprint. 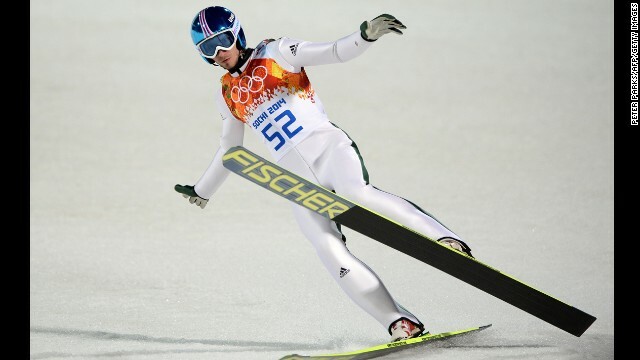 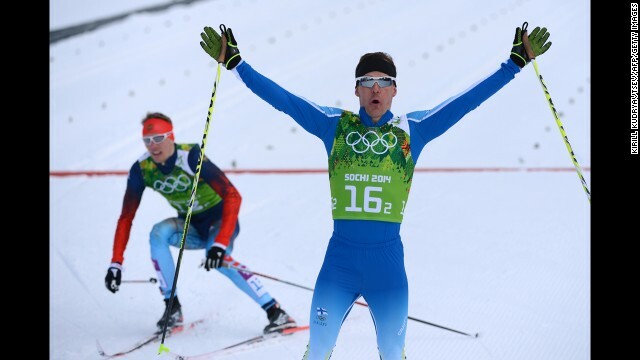 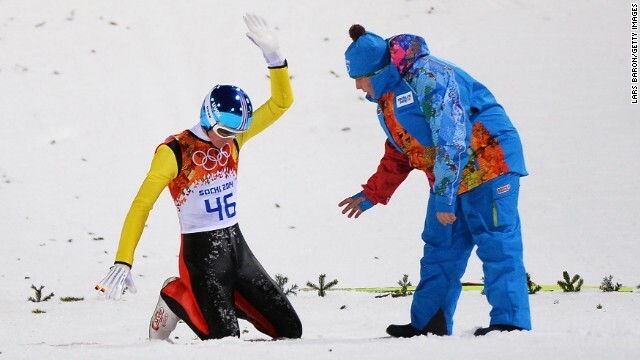 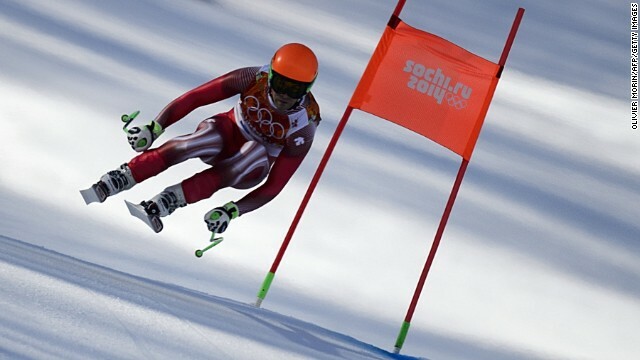 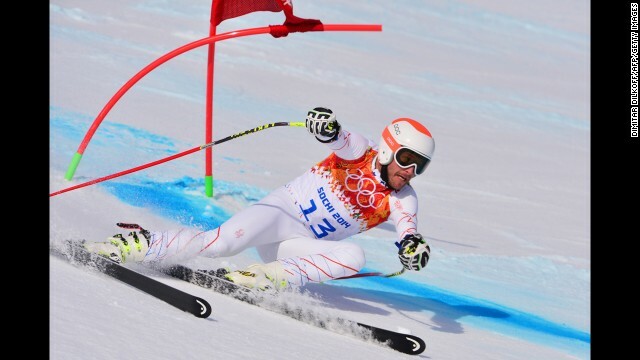 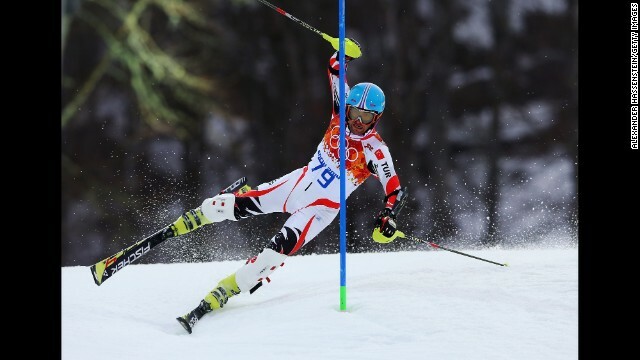 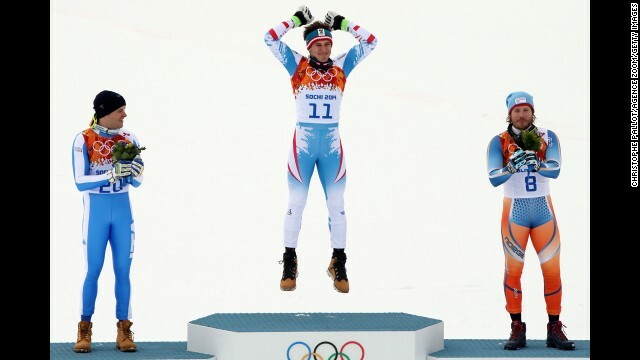 The 40-year-old's victory make him the joint most decorated Winter Olympian of all time alongside compatriot Bjorn Dahlie. 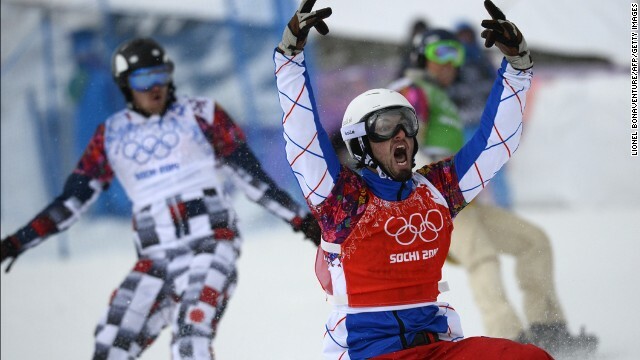 Both men have won an incredible 12 medals. 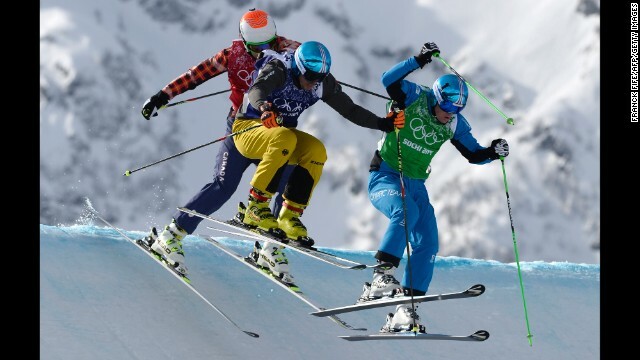 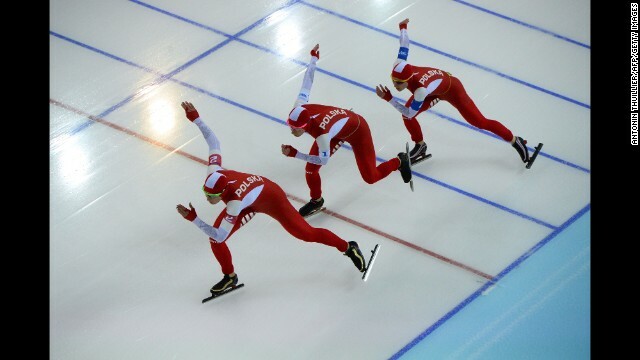 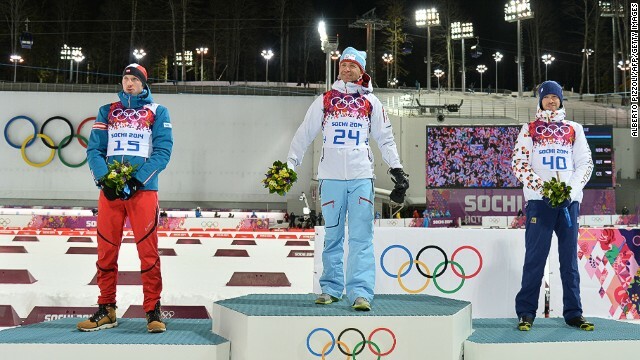 (From left to right) Silver medalist Austria's Dominik Landertinger, Gold medalist Norway's Ole Einar Bjoerndalen, and Bronze medalist Czech Republic's Jaroslav Soukup. 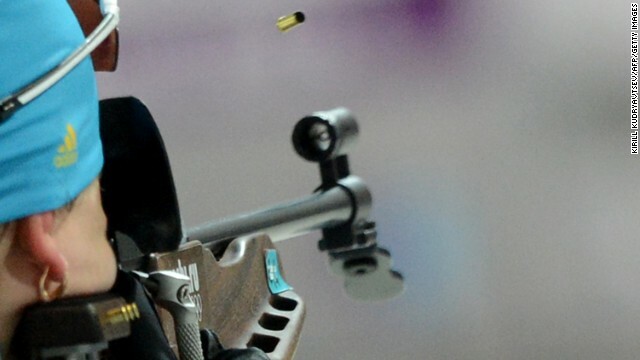 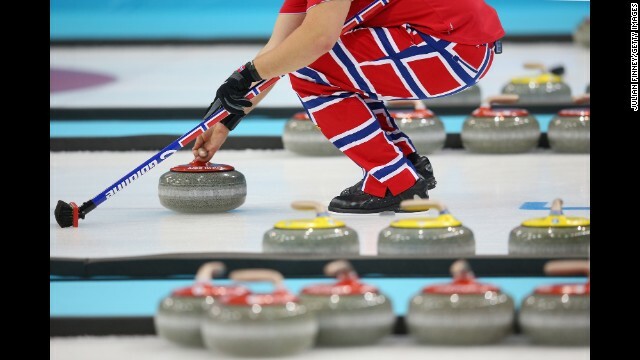 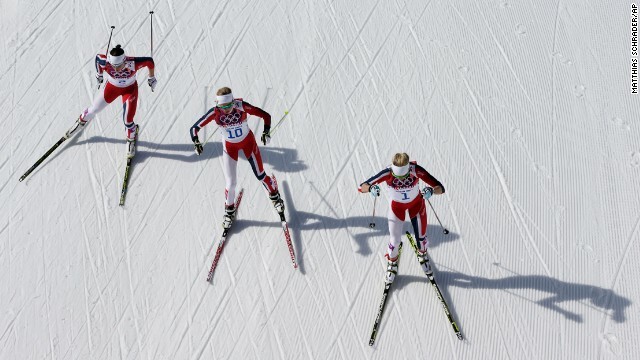 Norway are top of the medal table after day one with two golds, one silver and one bronze. 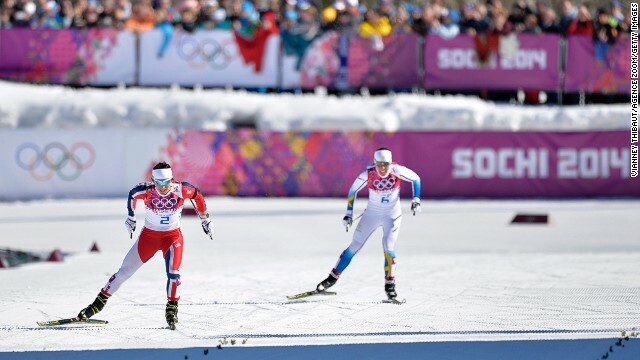 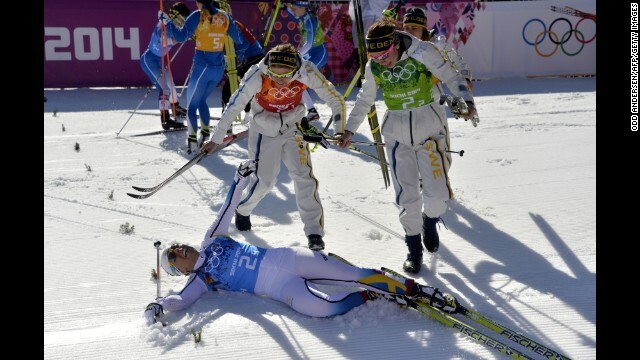 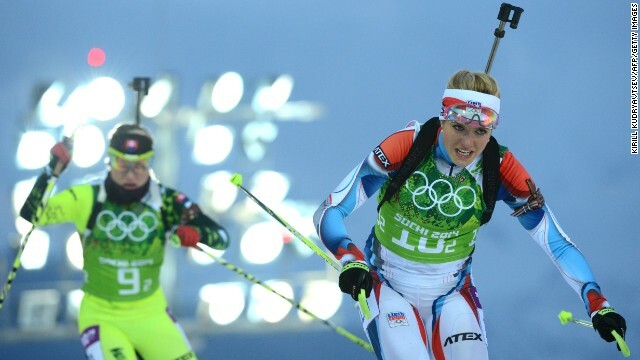 Norway's Marit Bjoergen (left) skis her way to gold in the women's skiathlon ahead of Charlotte Kalla of Sweden. 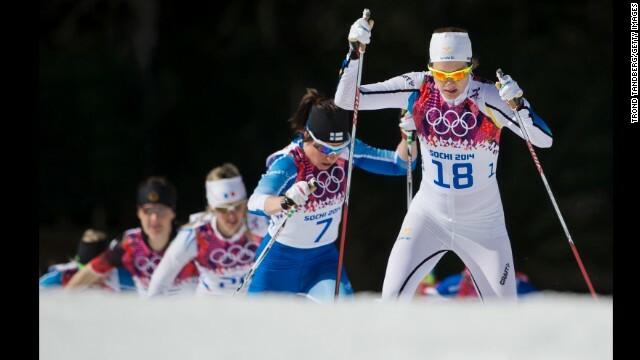 (From left to right) Silver medalist Charlotte Kalla of Sweden, Marit Bjoergen and bronze medalist Heidi Weng also from Norway. 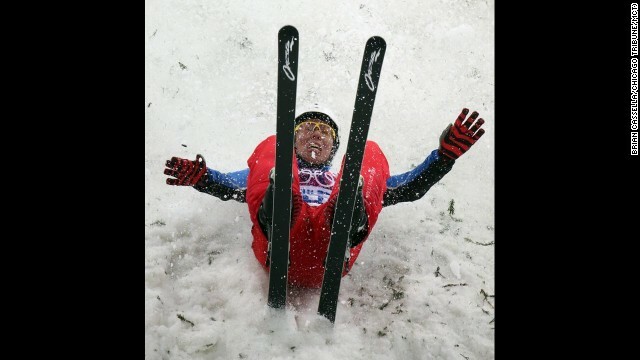 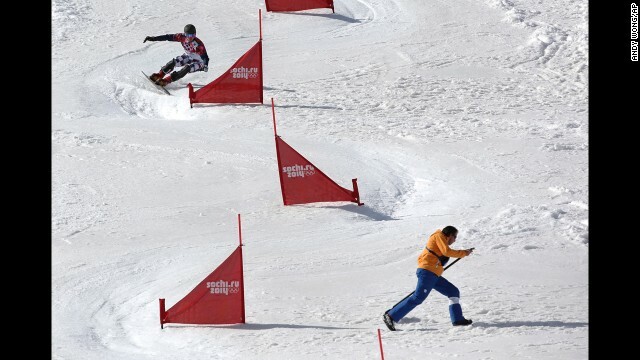 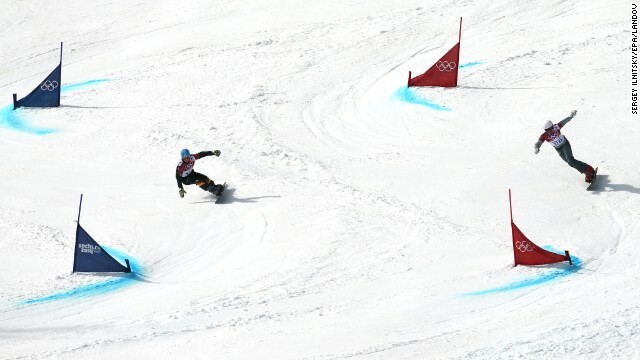 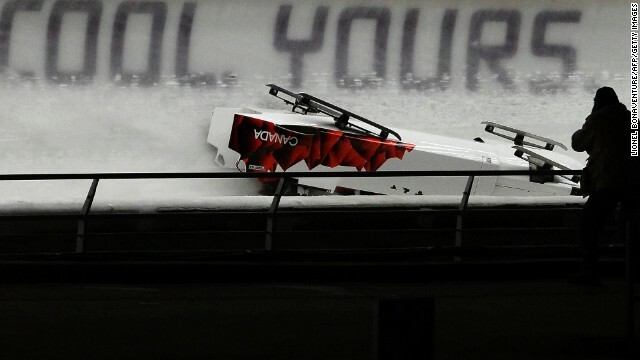 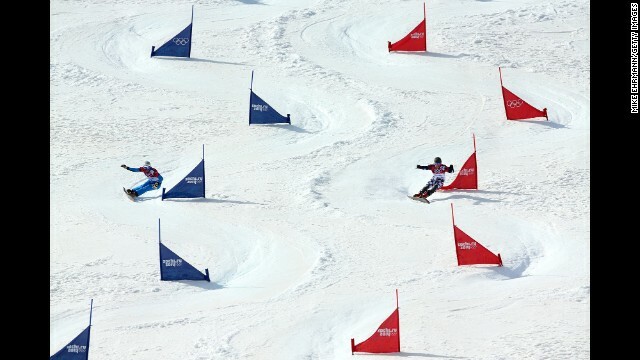 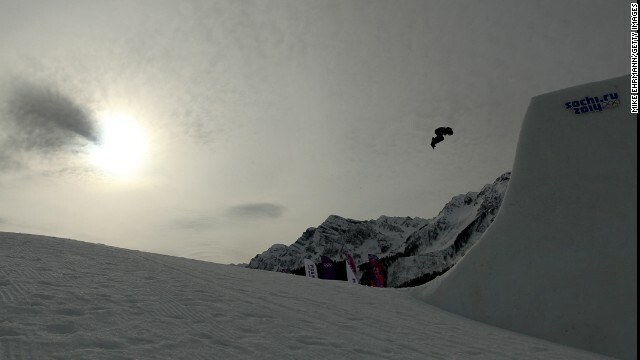 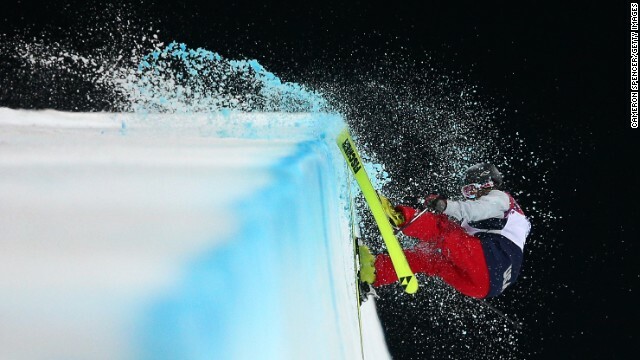 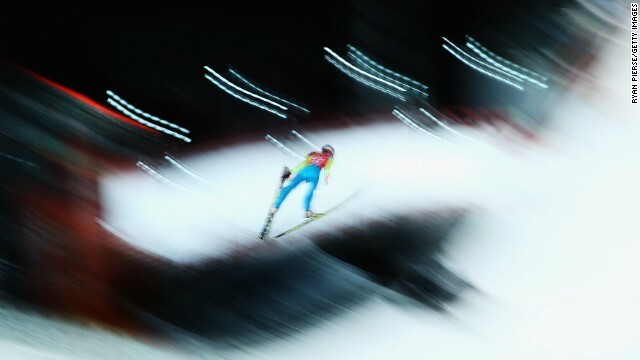 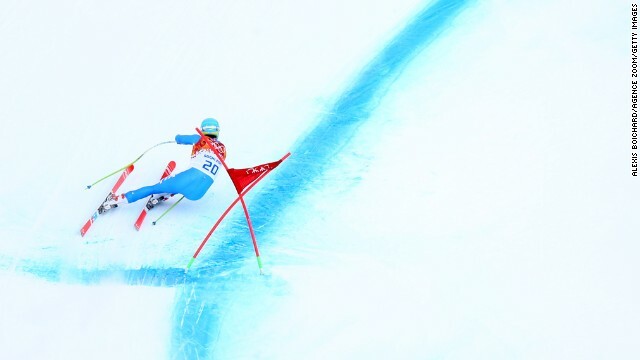 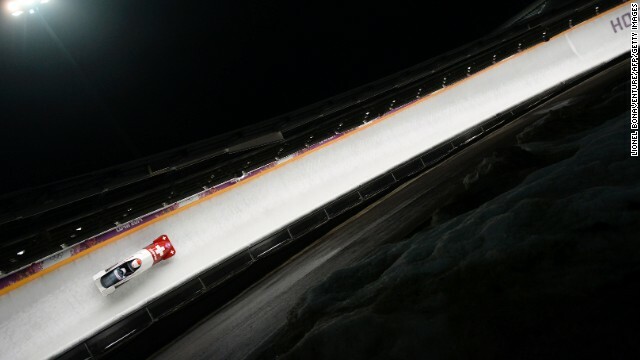 Canada's Justine Dufour-Lapointe rides the bumps on the mogul course at Sochi's Rosa Khutor Extreme Park. 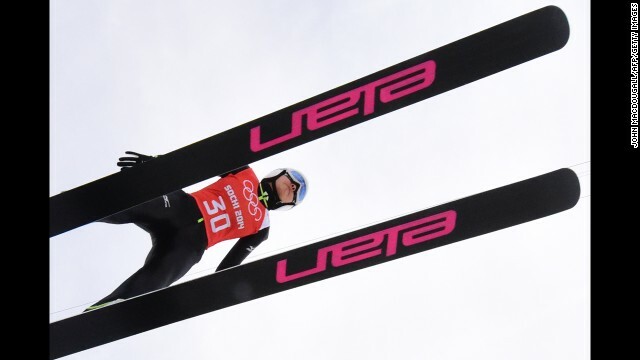 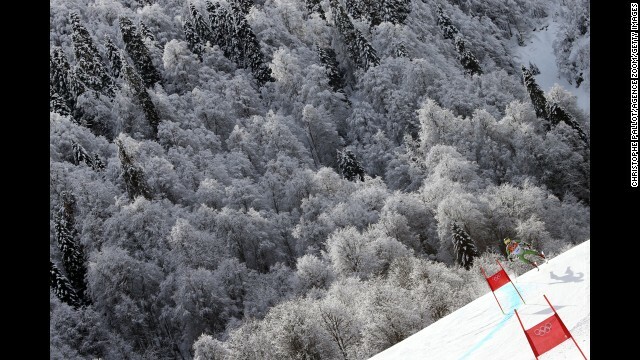 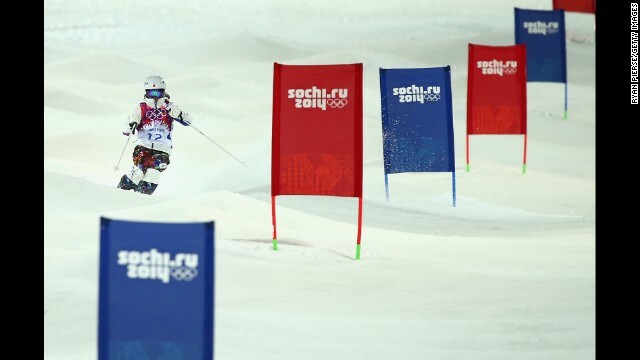 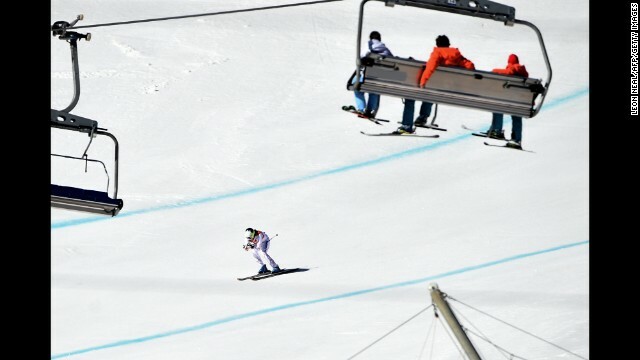 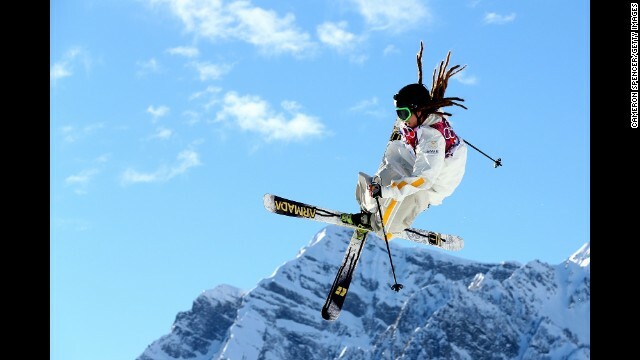 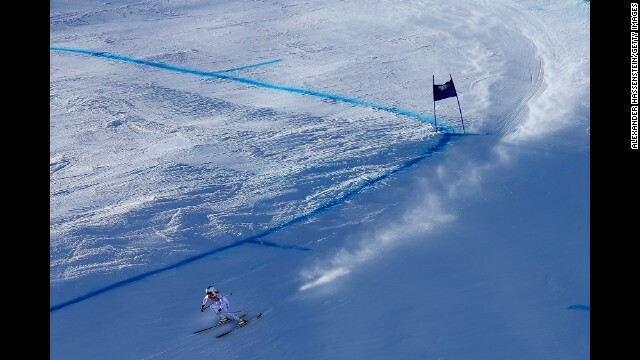 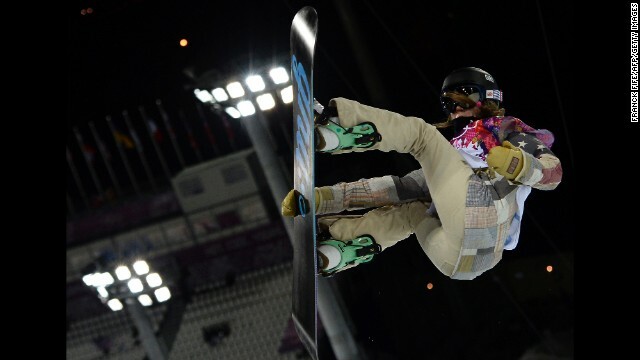 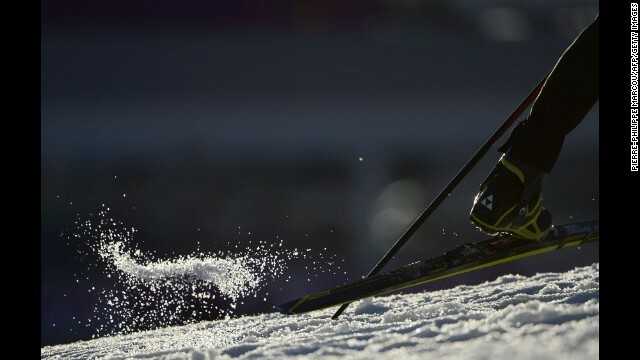 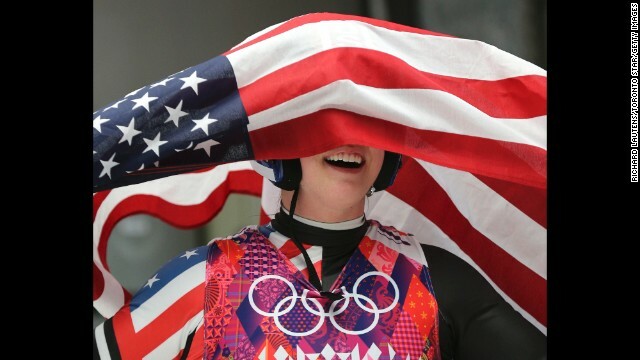 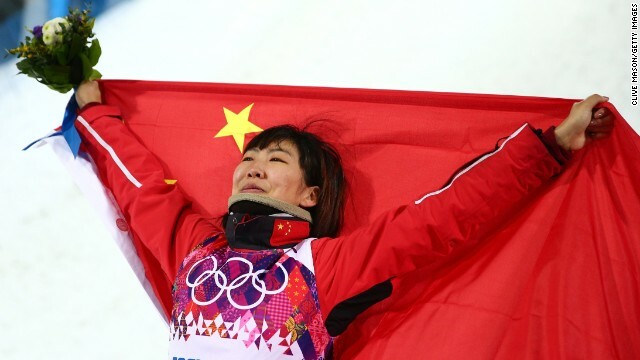 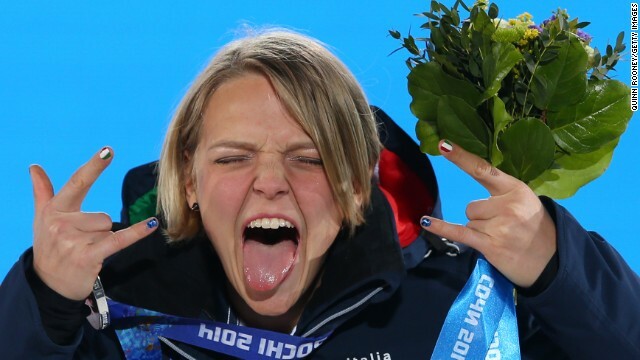 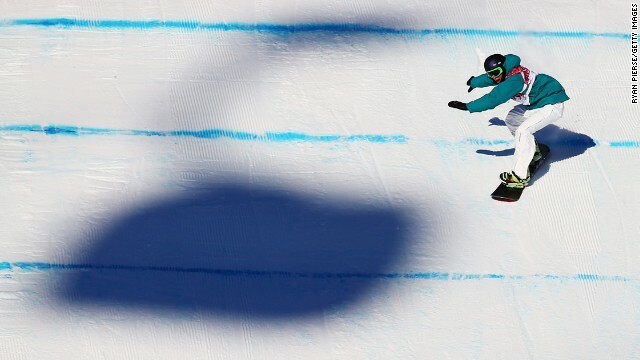 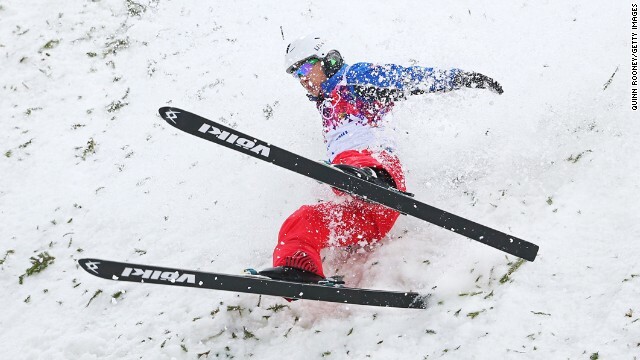 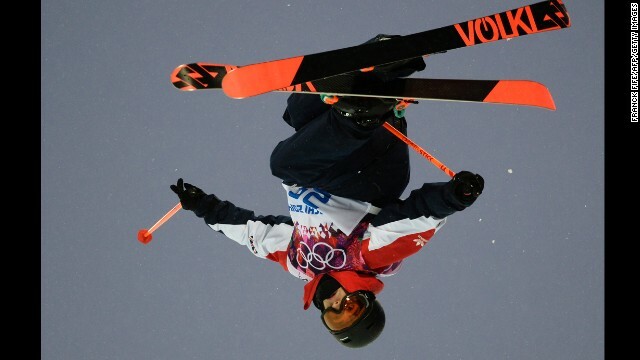 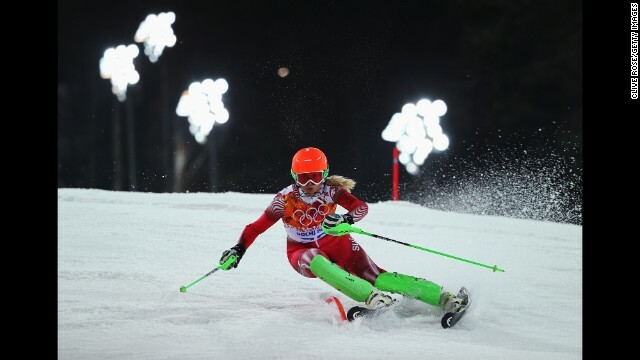 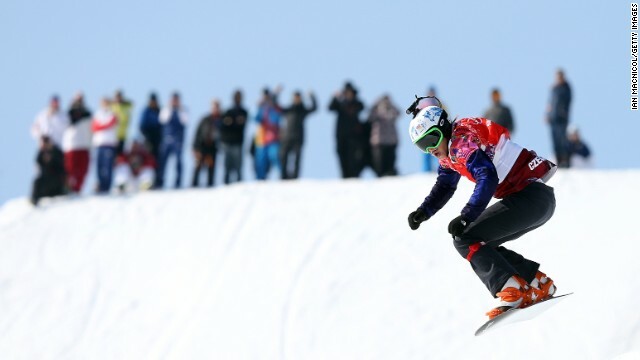 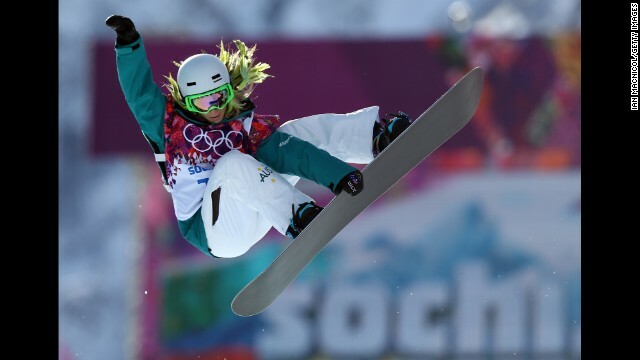 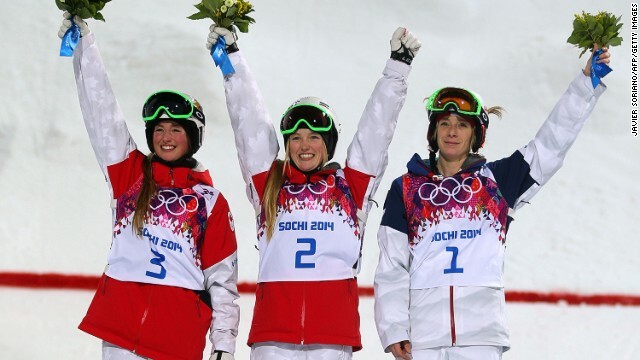 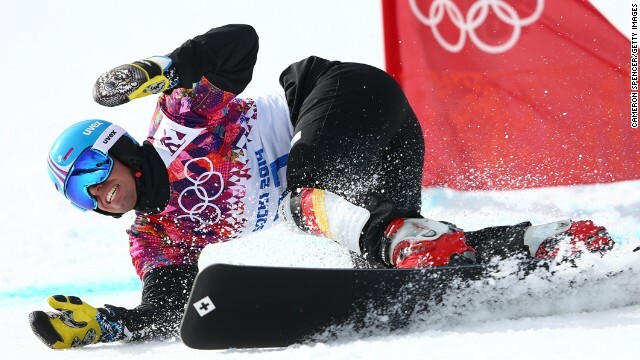 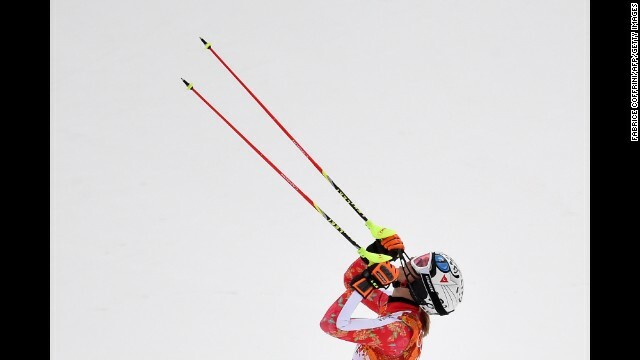 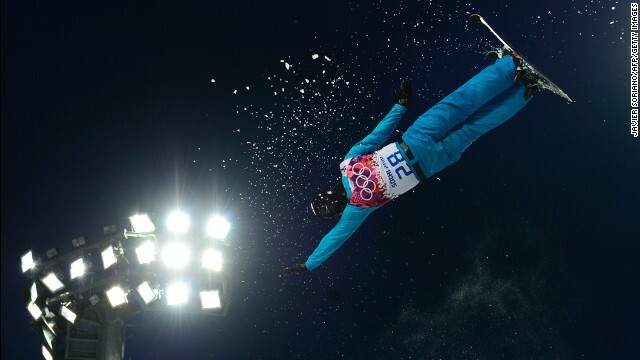 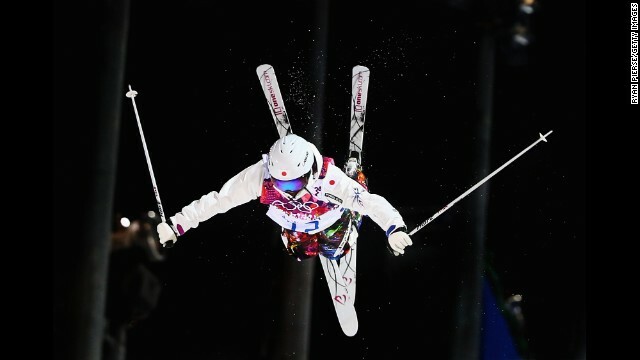 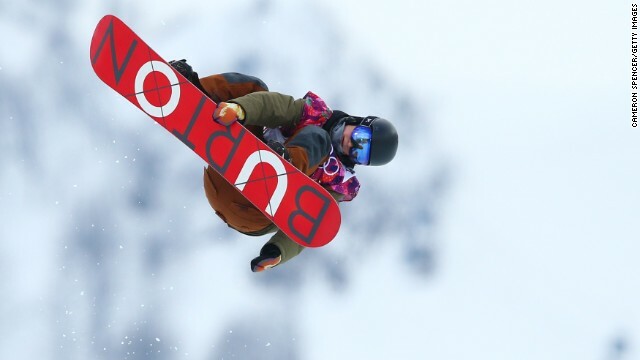 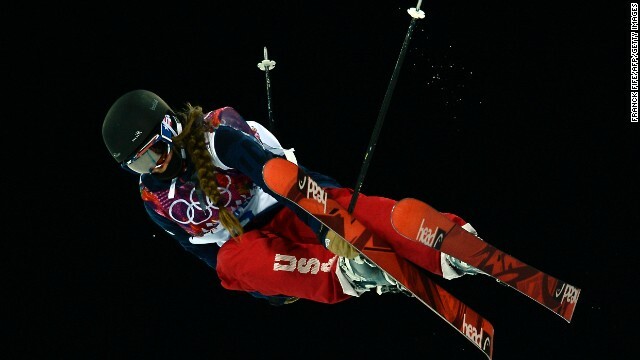 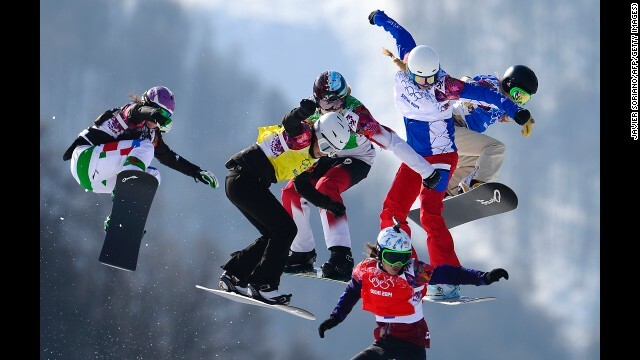 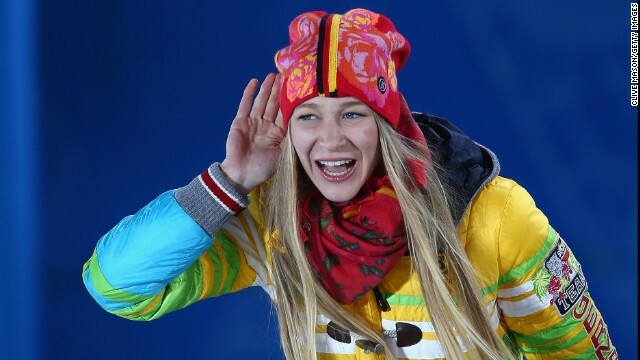 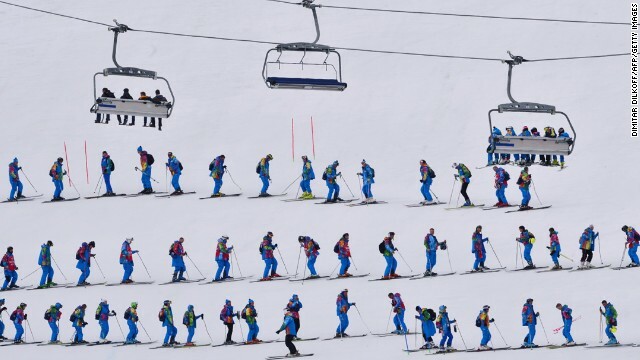 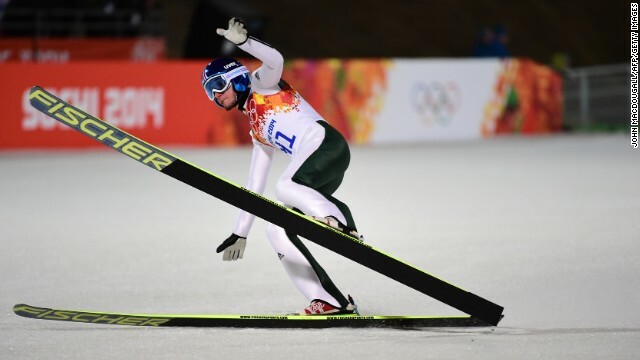 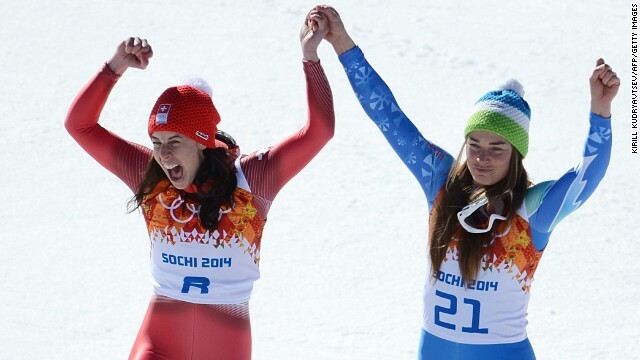 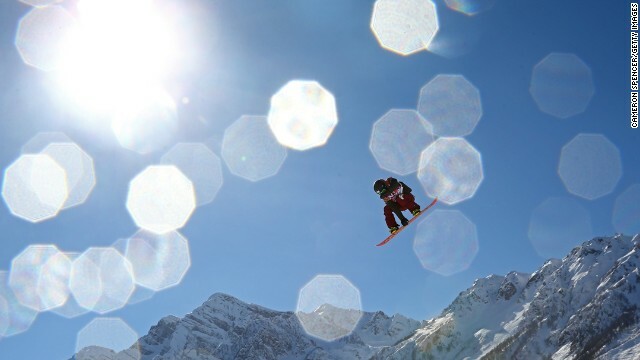 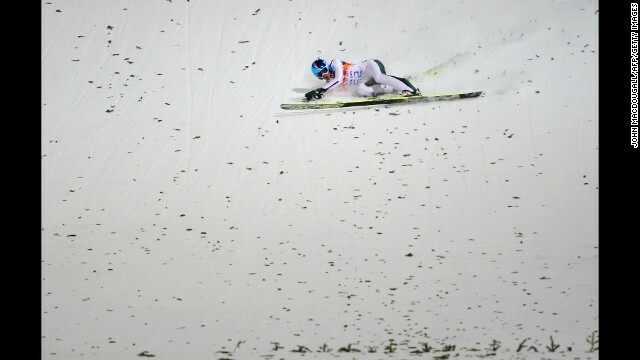 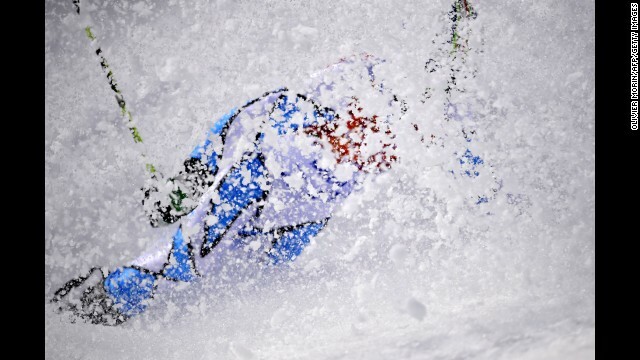 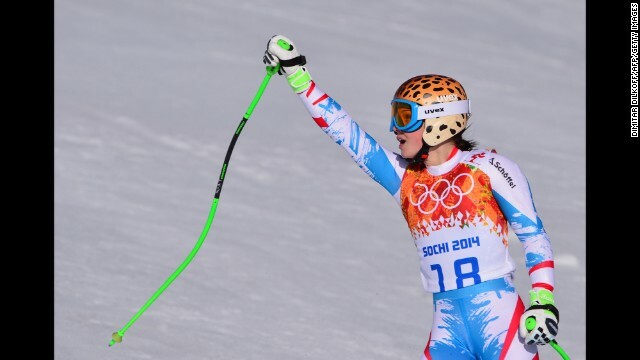 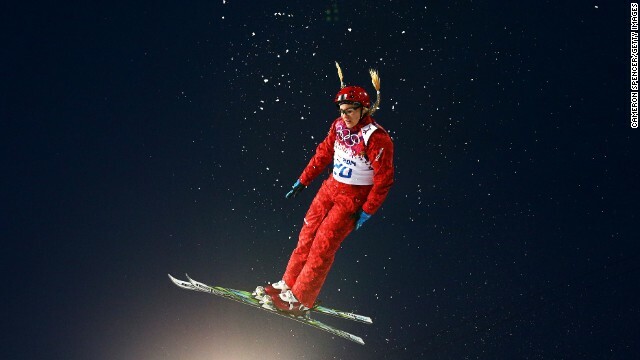 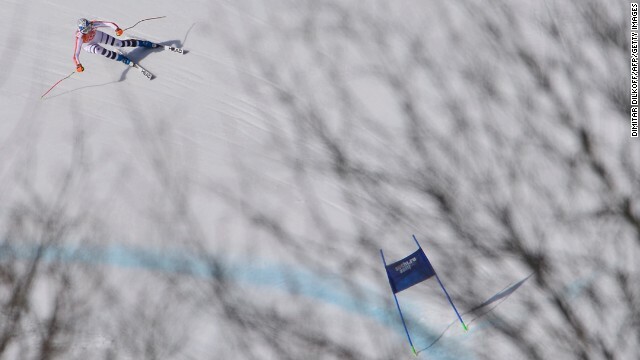 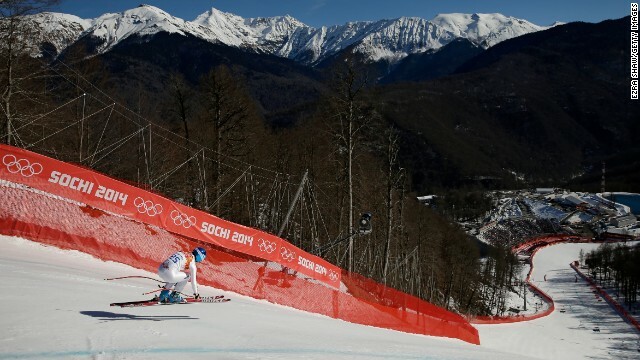 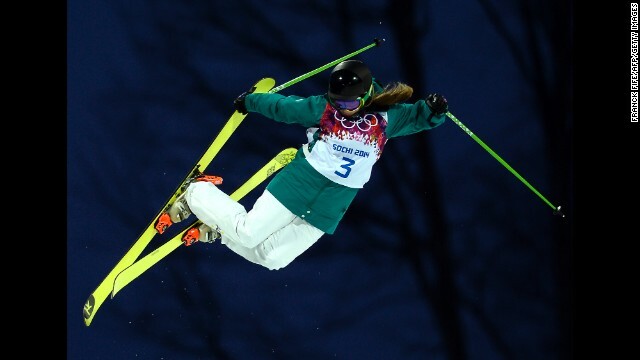 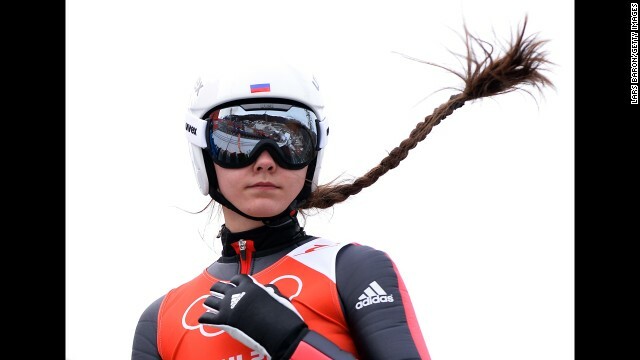 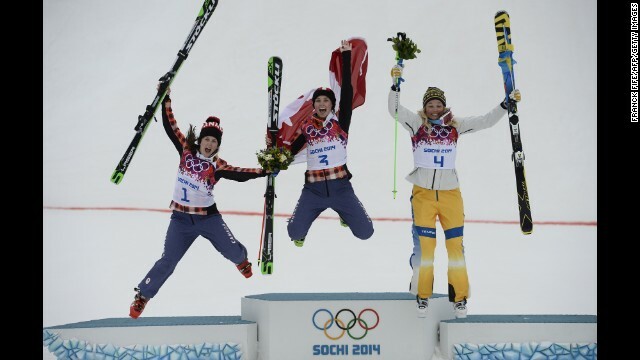 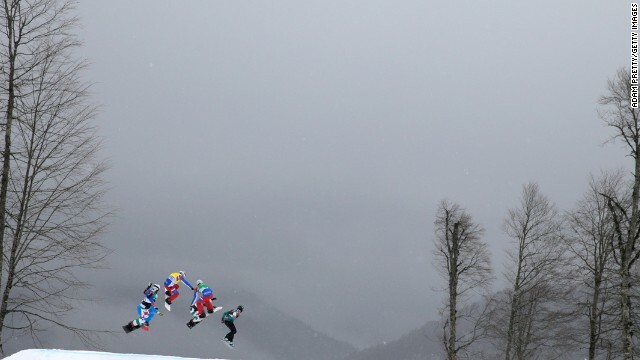 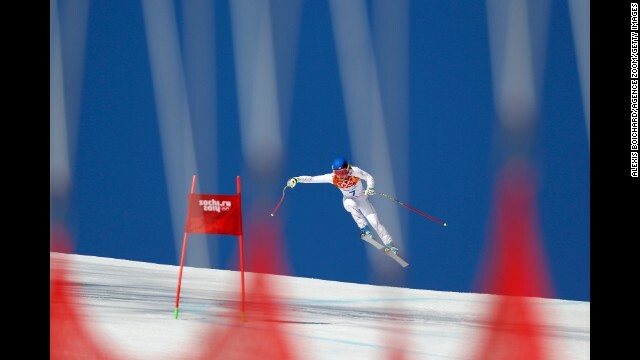 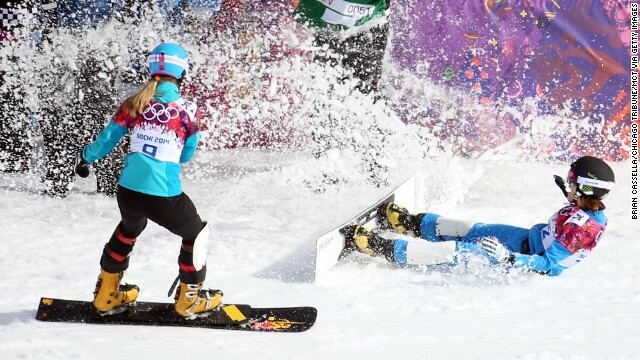 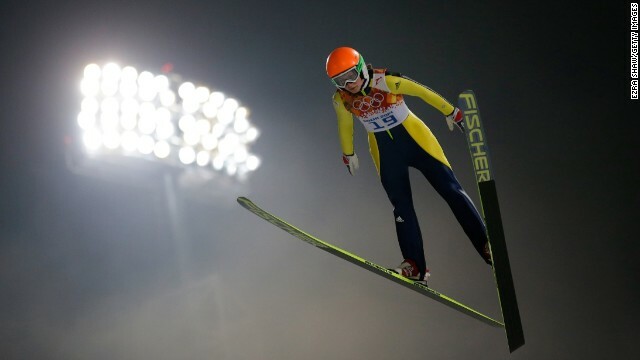 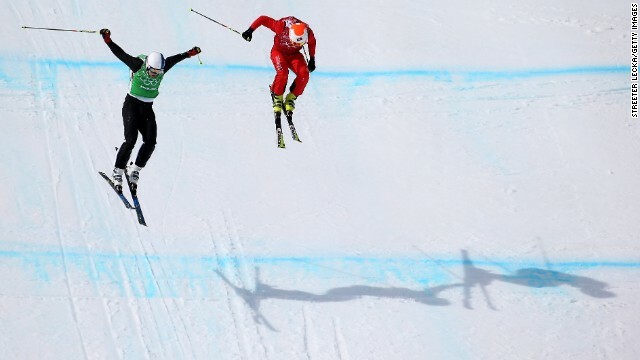 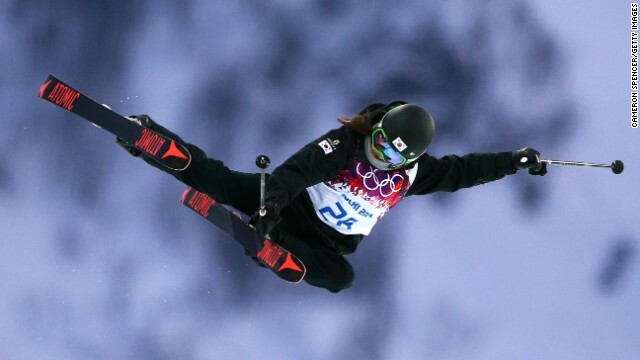 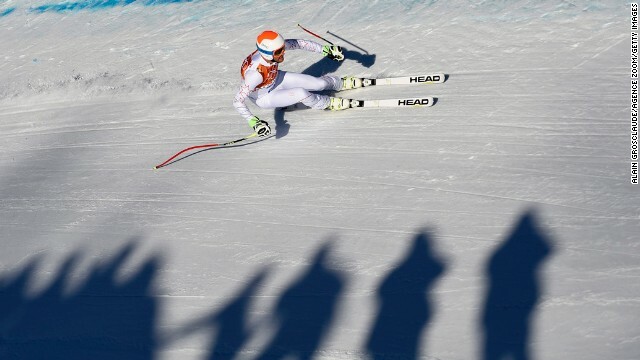 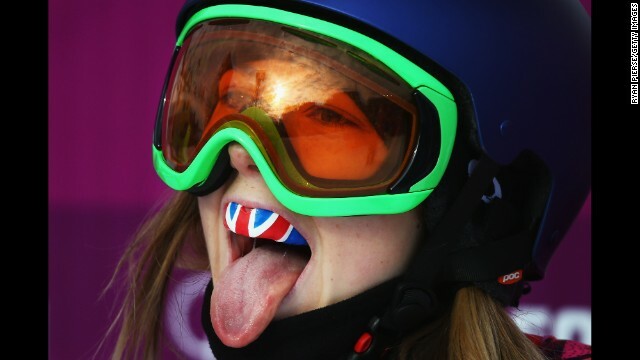 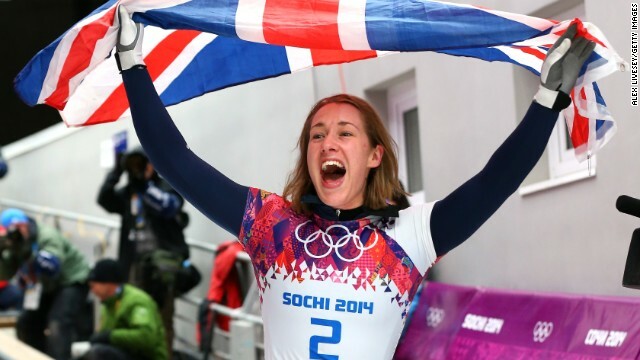 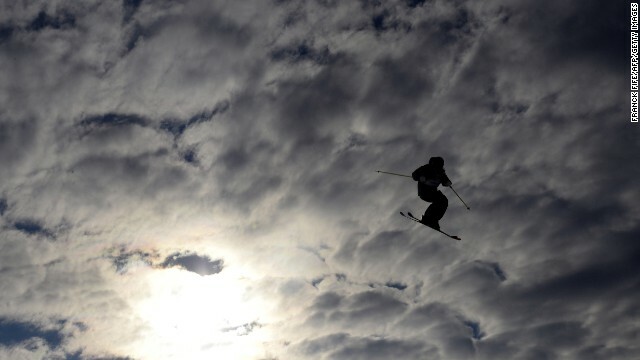 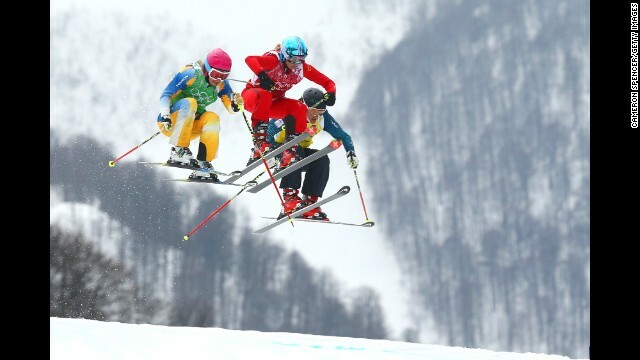 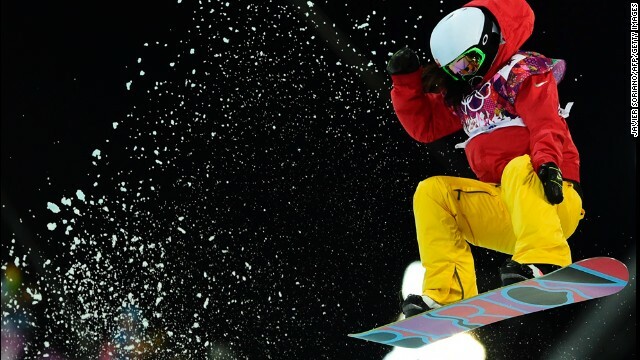 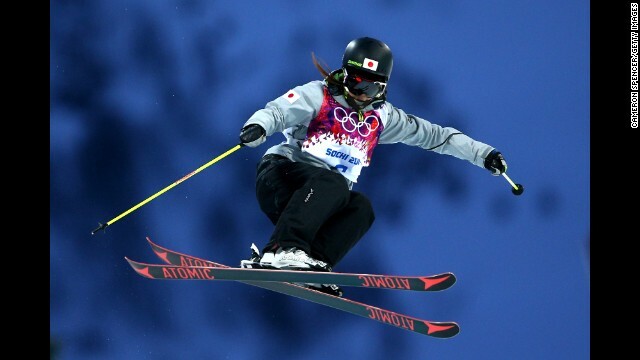 The 19-year-old took gold, pipping her older sister Chloe to the Olympic women's moguls title. 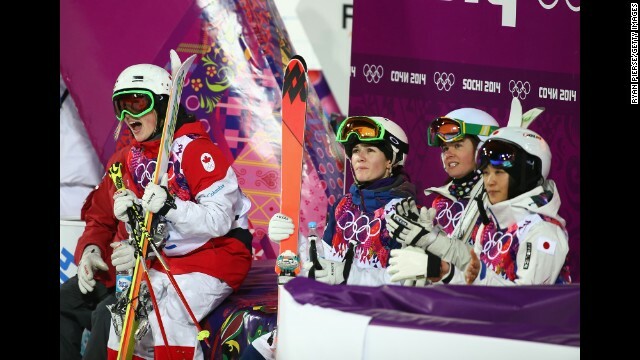 (From left to right) Silver medalist Chloe Dufour-Lapointe of Canada, gold medalist Justine Dufour-Lapointe of Canada and bronze medalist Hannah Kearney of the U.S. give a wave following the conclusion of the women's moguls event. 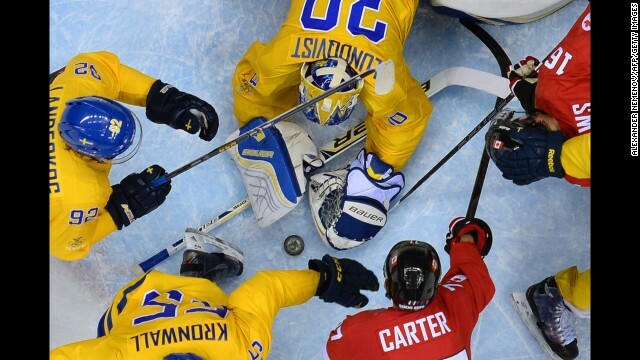 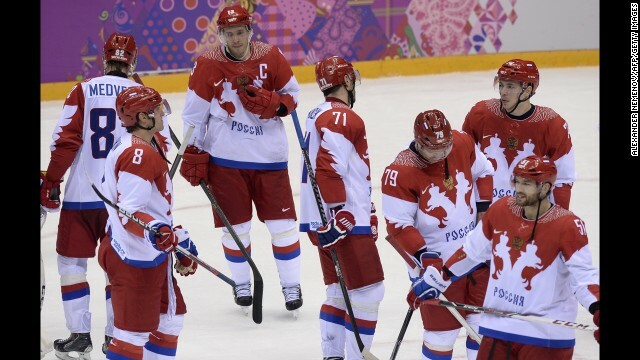 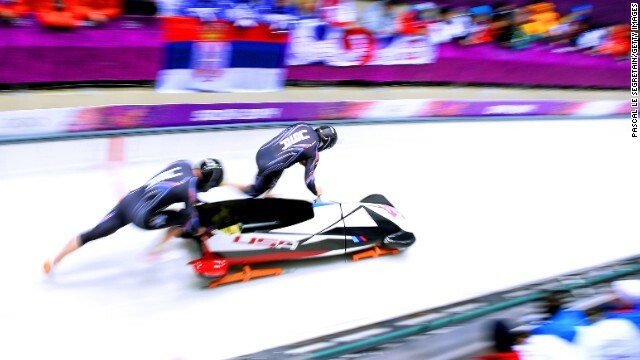 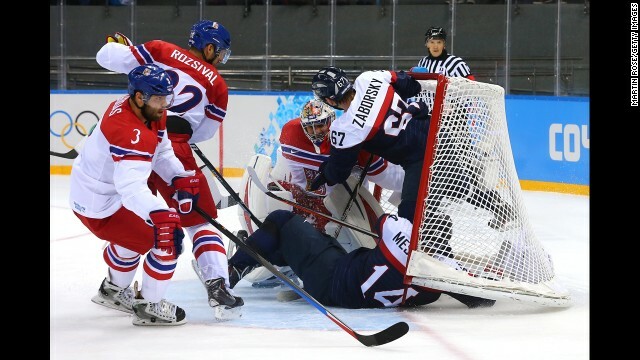 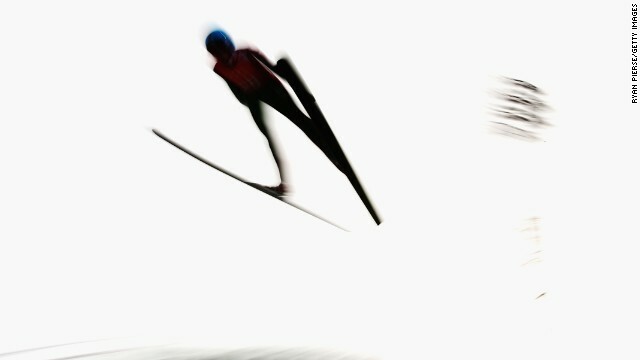 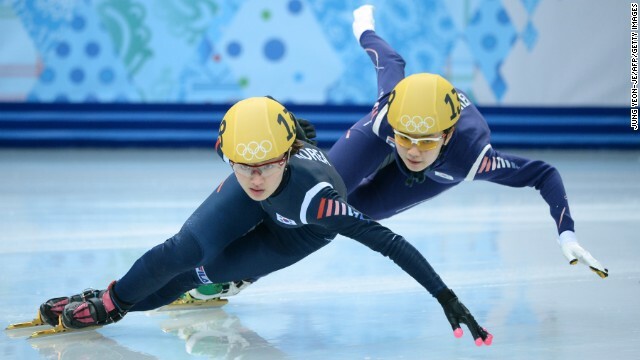 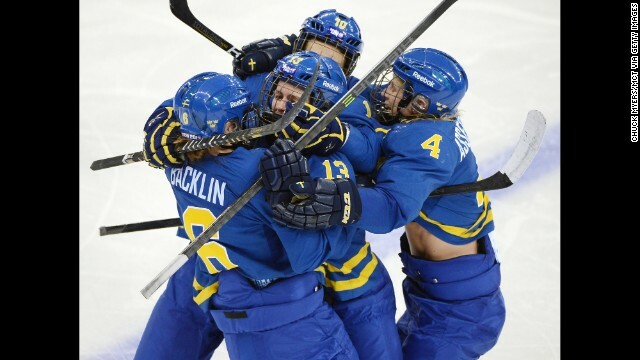 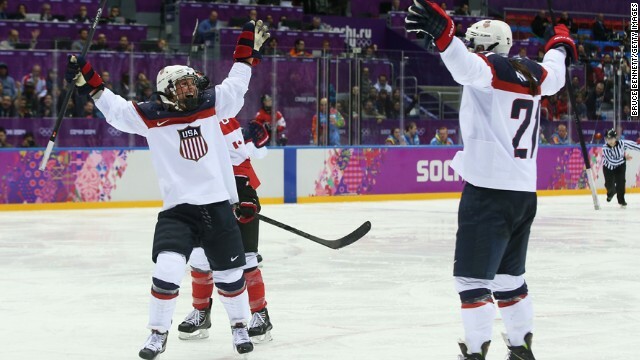 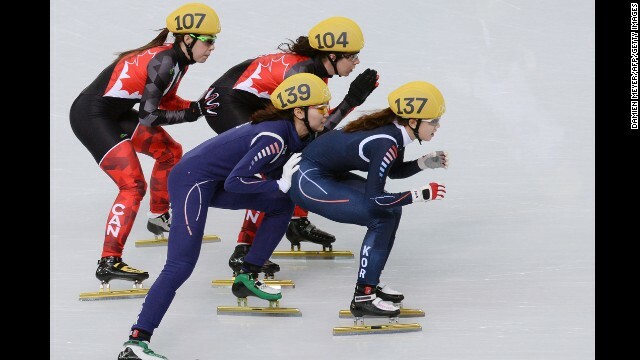 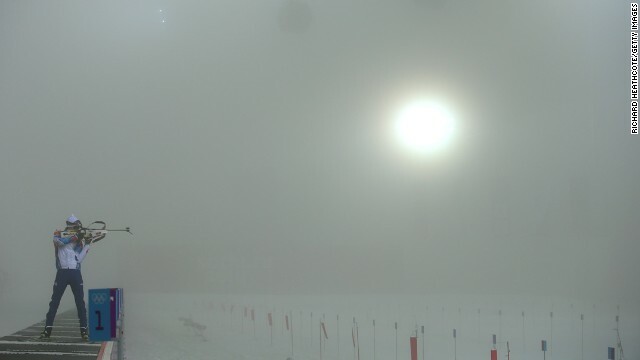 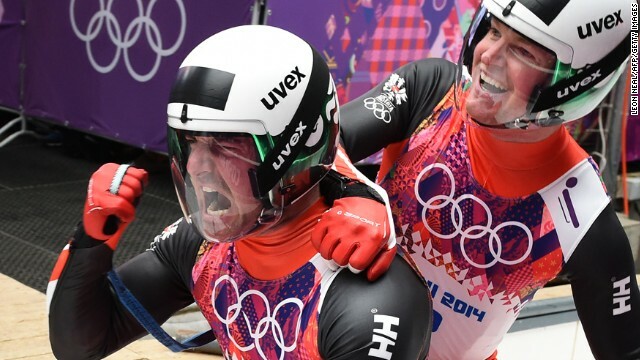 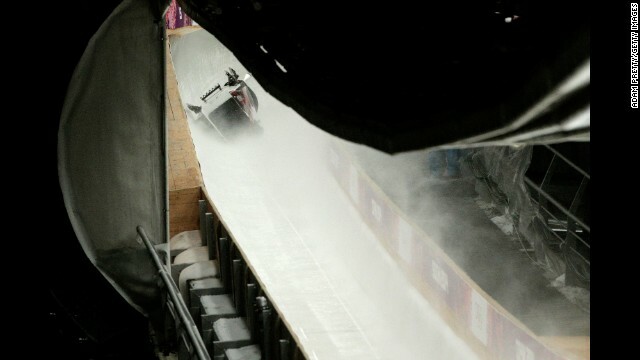 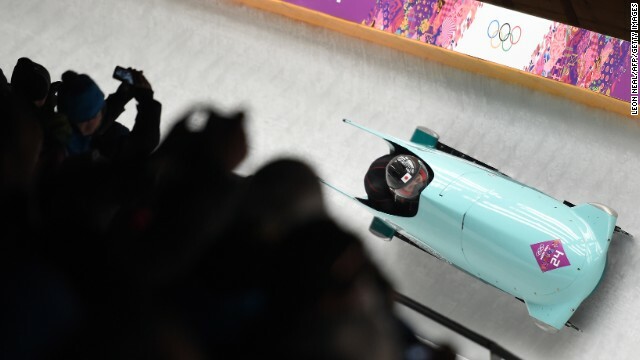 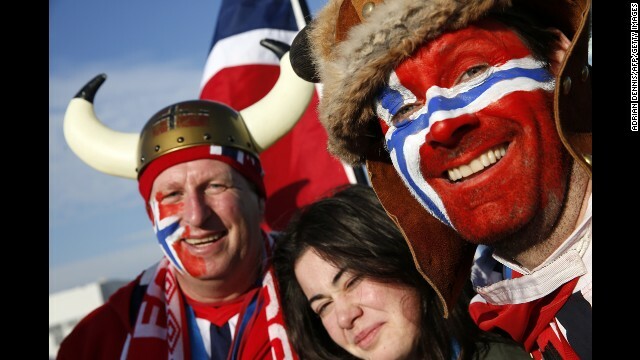 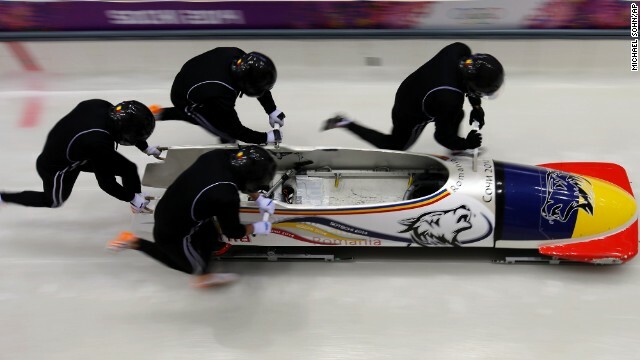 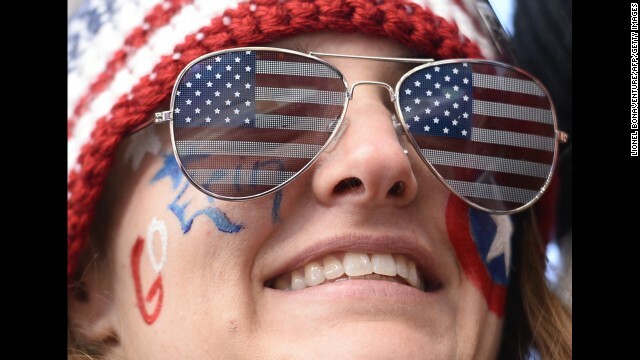 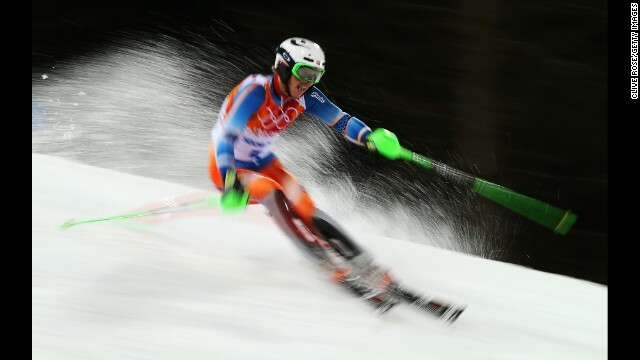 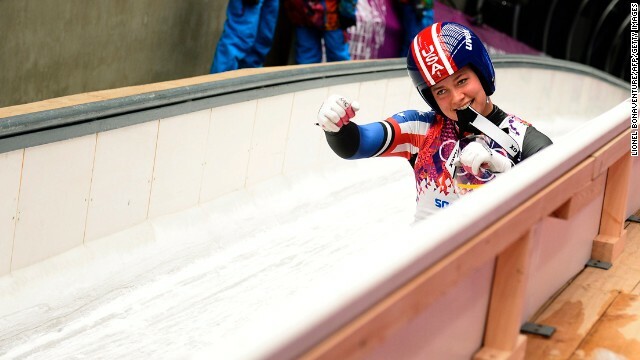 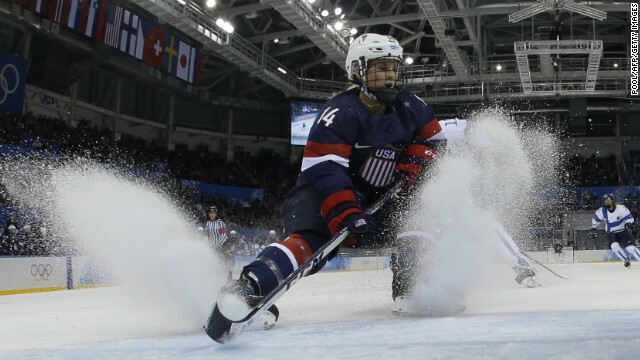 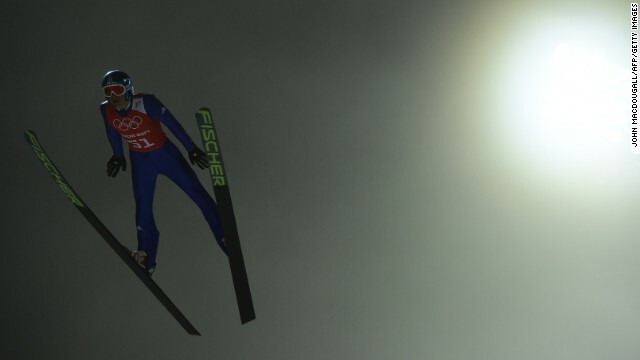 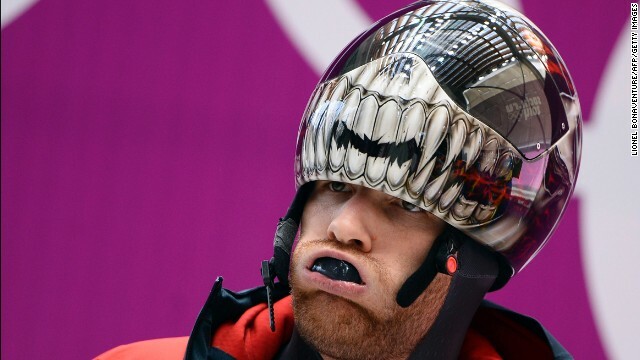 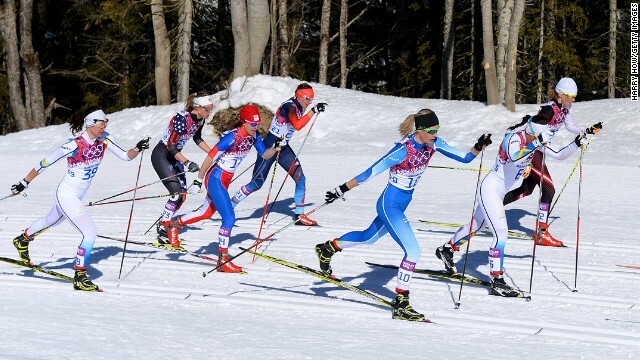 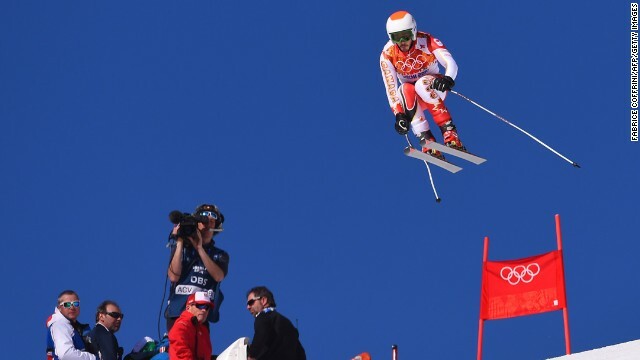 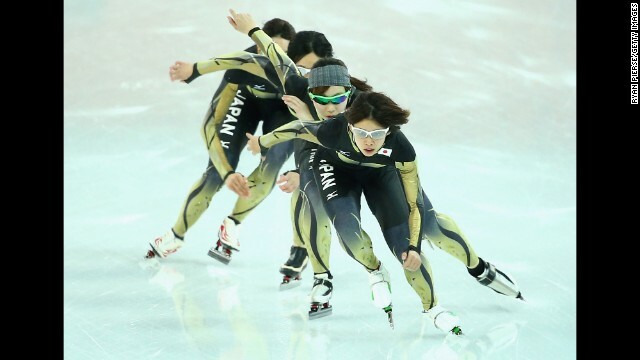 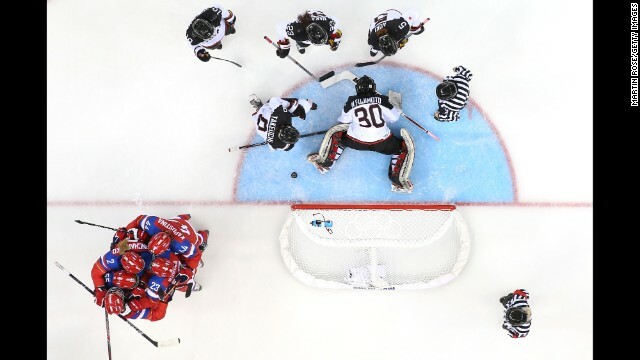 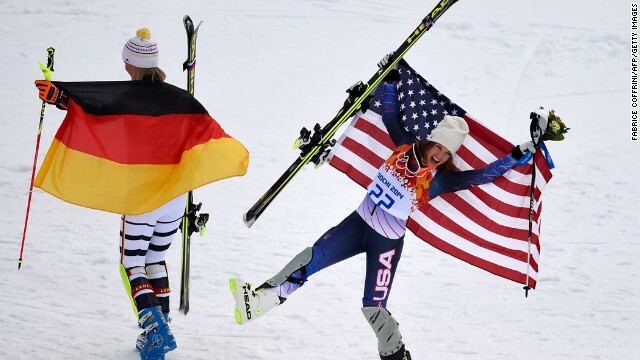 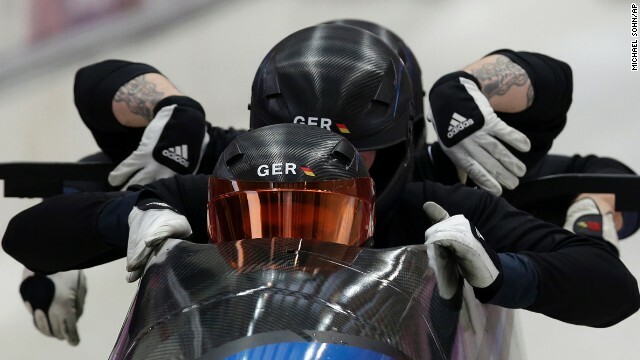 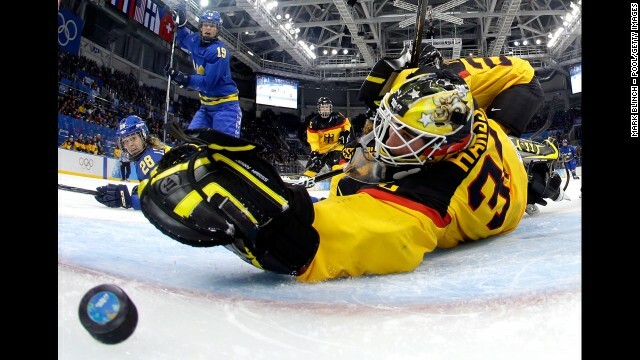 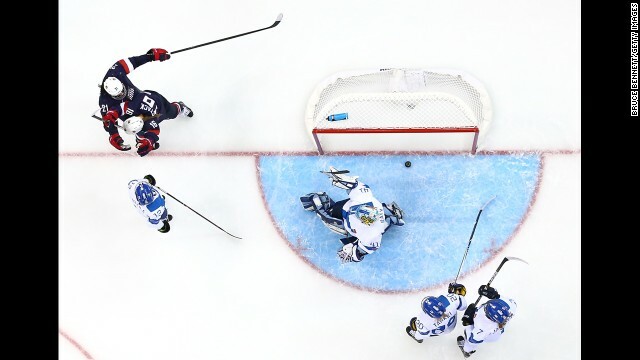 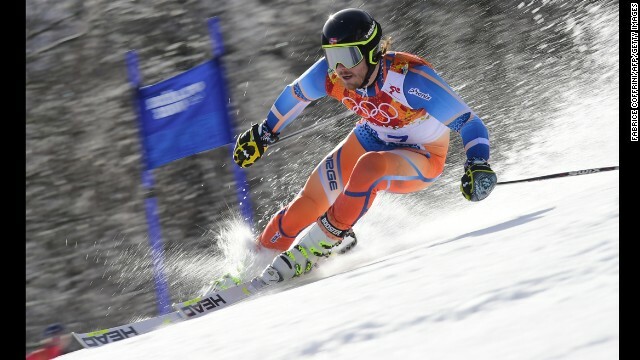 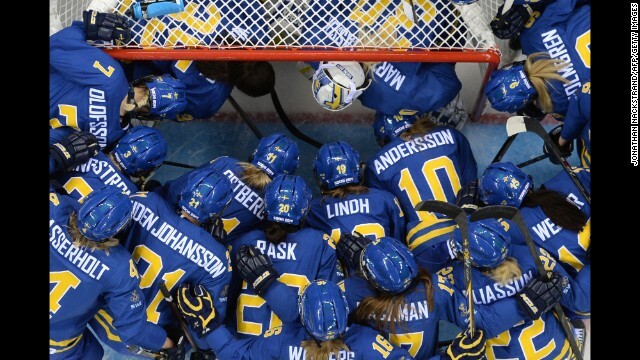 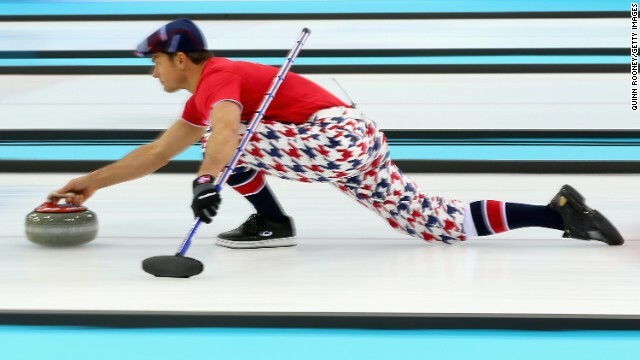 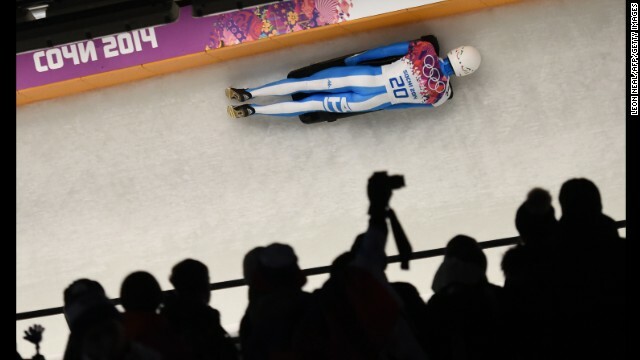 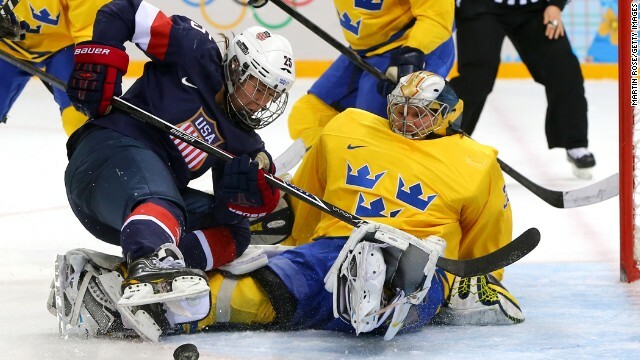 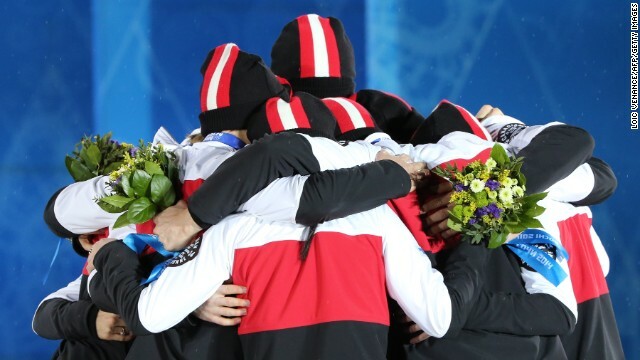 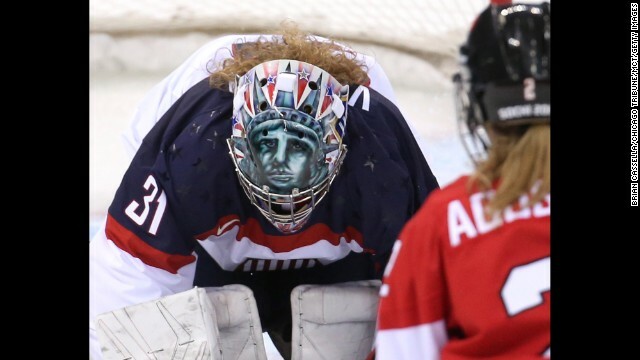 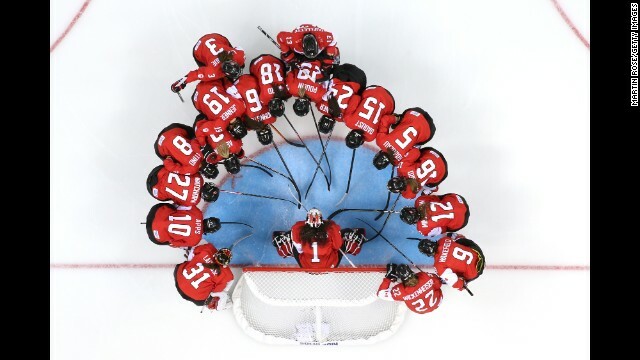 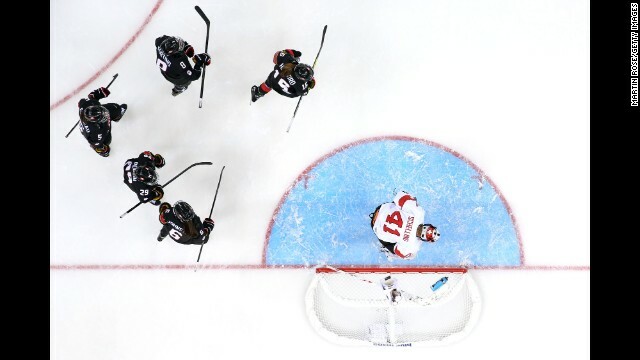 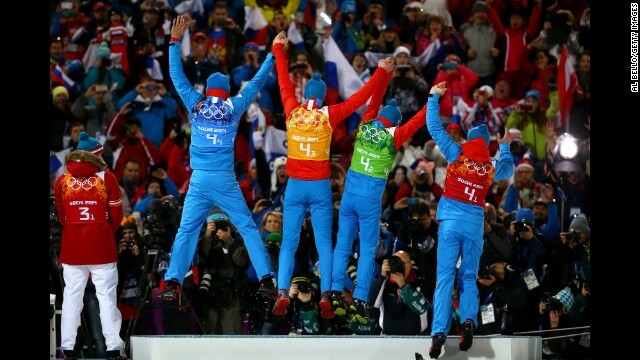 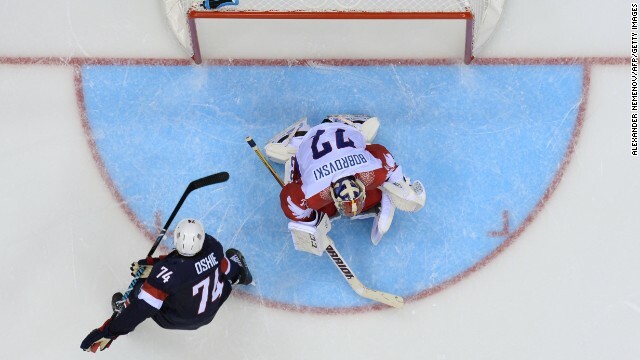 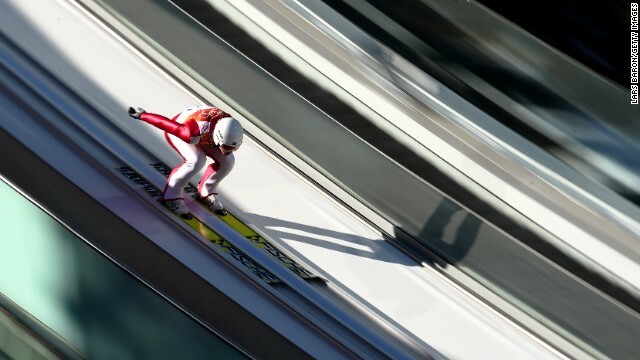 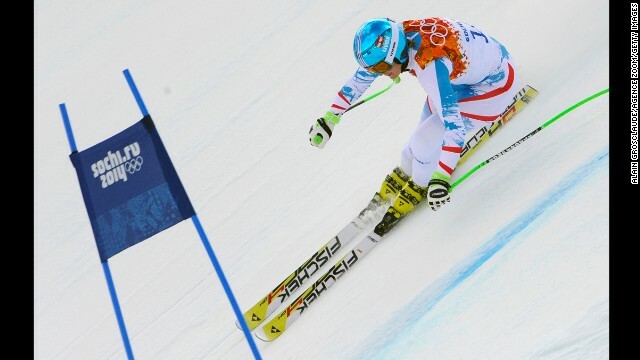 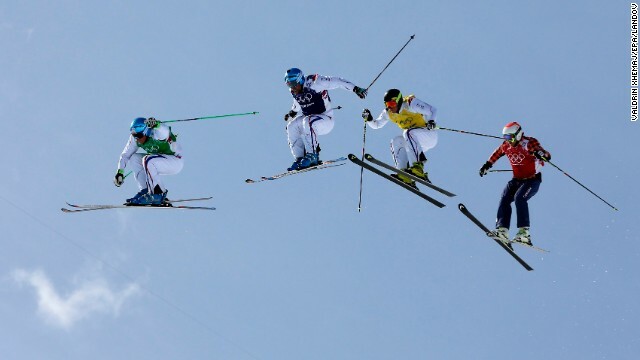 (CNN) -- The United States clinched the first gold medal of Sochi's Winter Olympics Saturday, but the Dutch dominated on ice and a joint record was claimed by Norway. 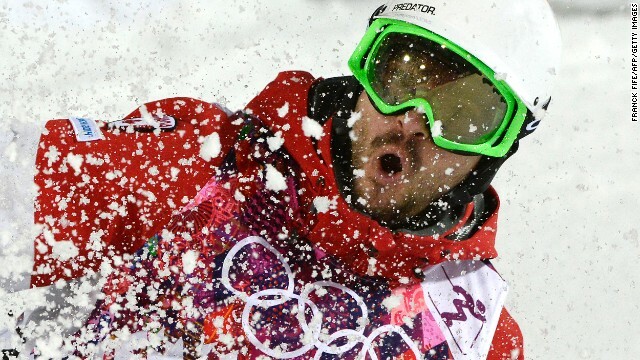 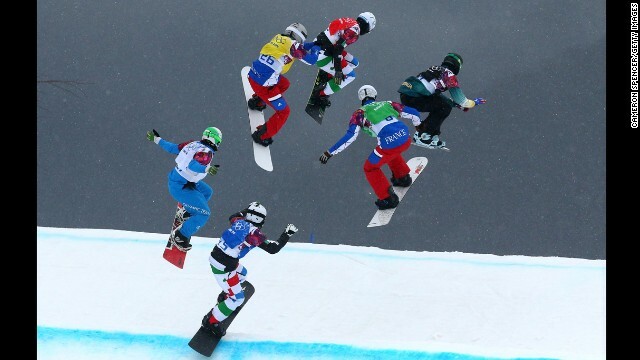 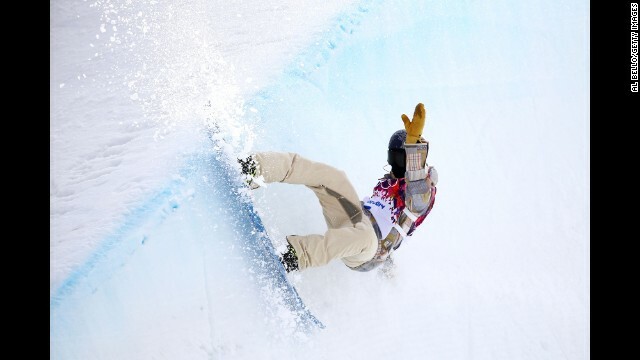 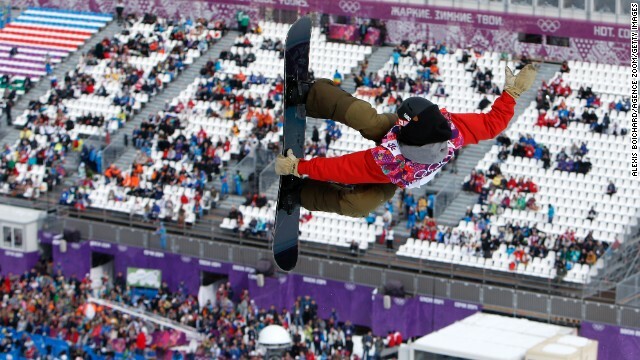 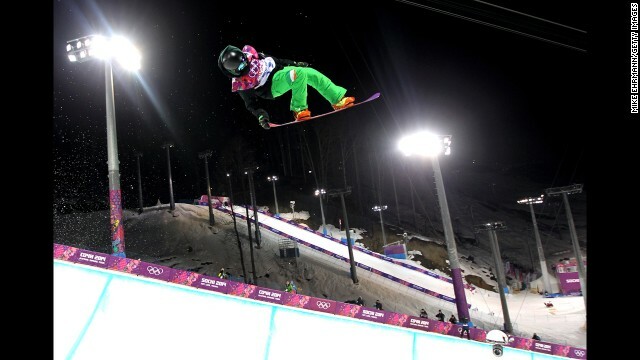 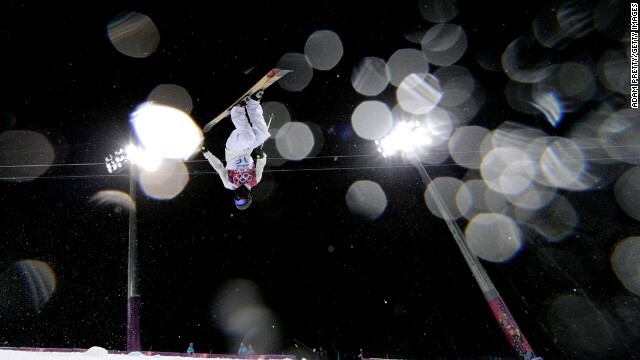 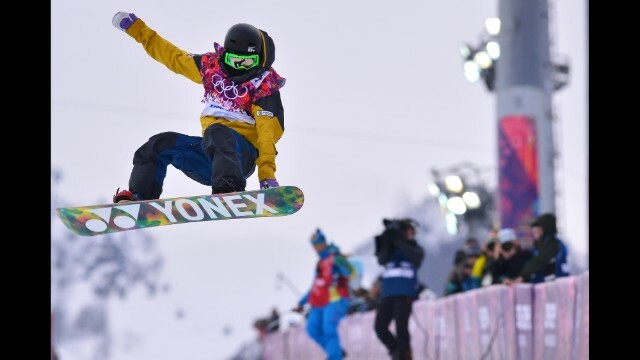 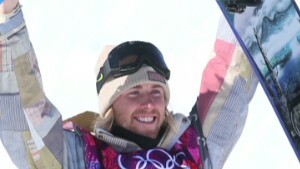 An upset opened the day's events in Russia when Team U.S.A's Sage Kotsenburg, 20, scooped the first gold in men's snowboard slopestyle. 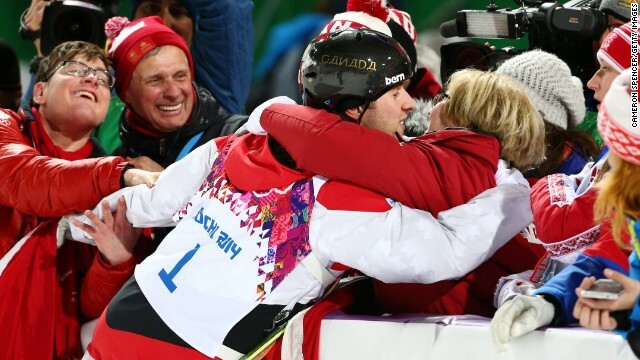 Kotsenburg tweeted his surprise at the win. 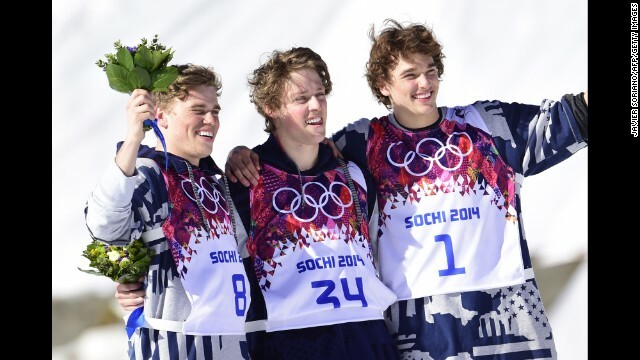 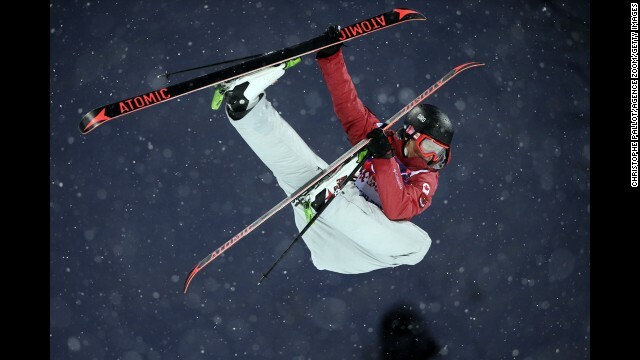 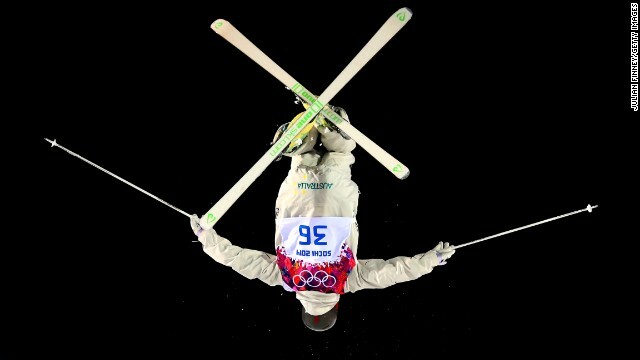 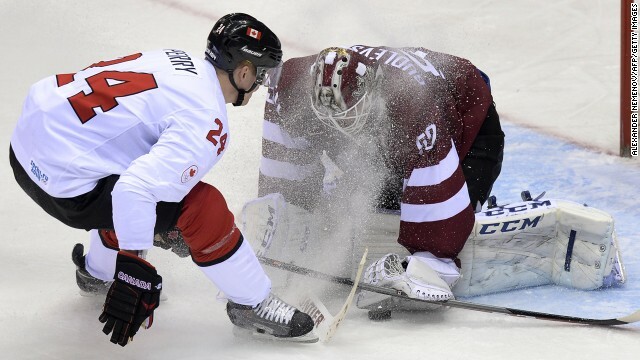 Kotsenburg's winning score of 93.5 edged out silver medal winner Staale Sandbech, 20, while Canadian Mark McMorris, also 20, took bronze. 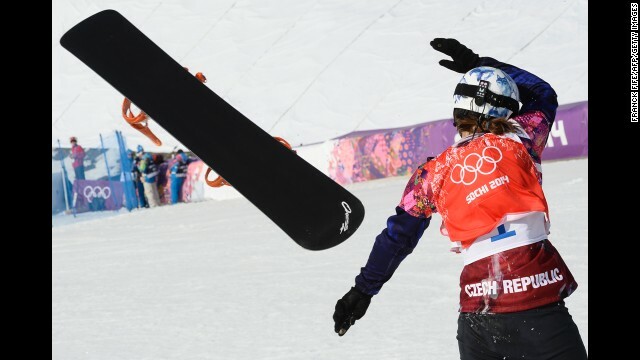 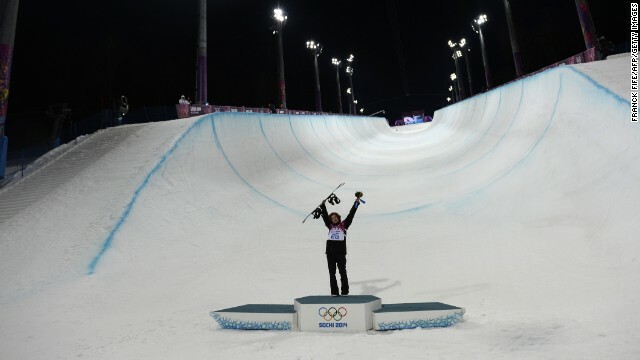 American Shaun White, the biggest name in snowboarding, withdrew from the competition before it began to focus on the men's halfpipe next week. 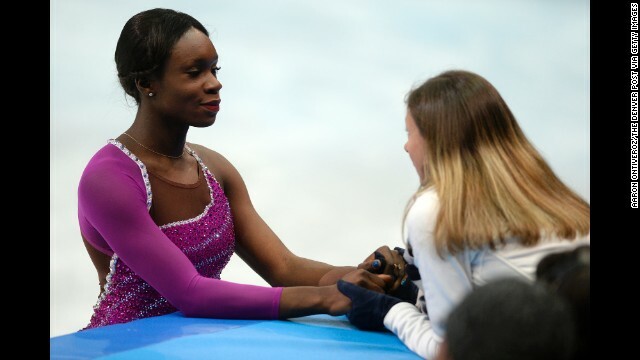 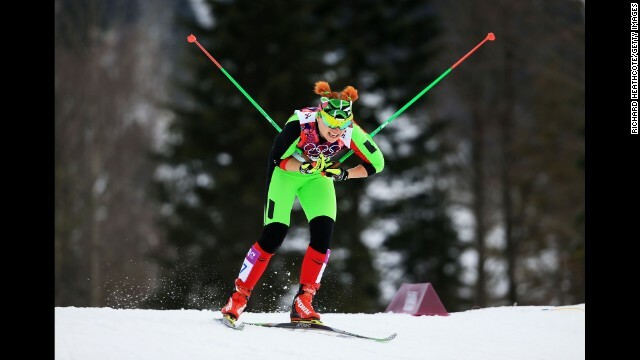 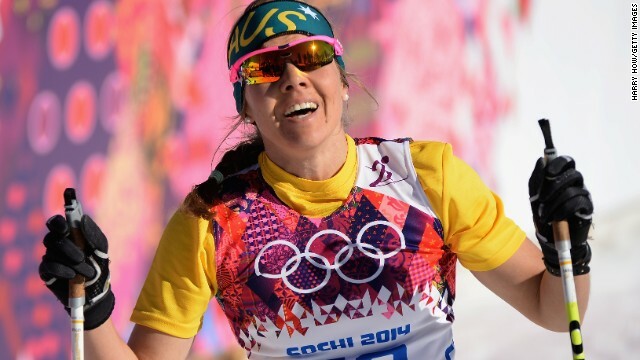 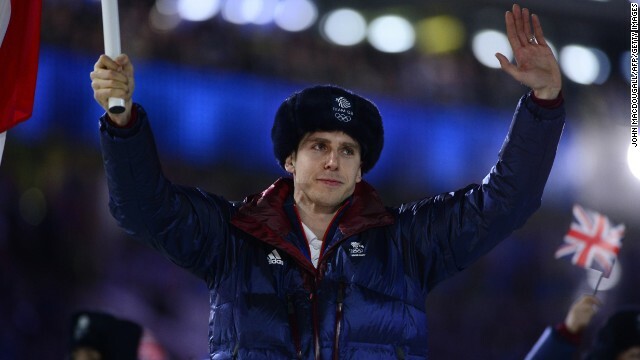 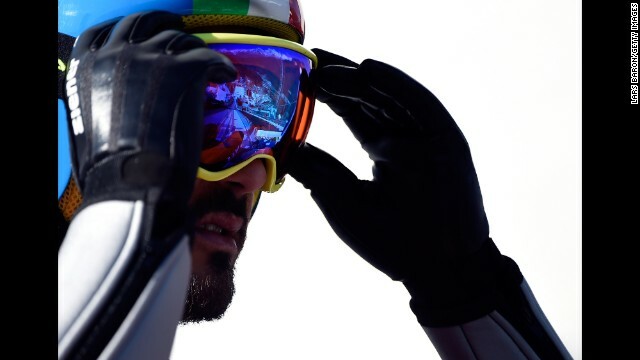 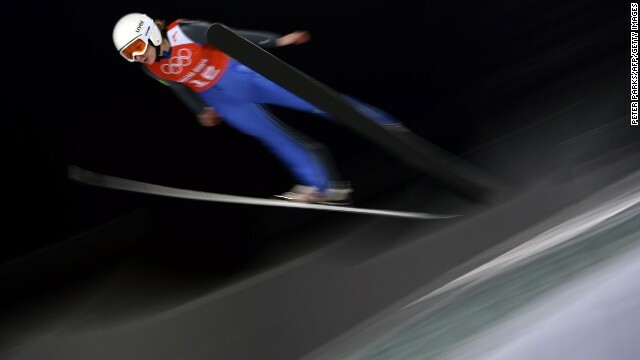 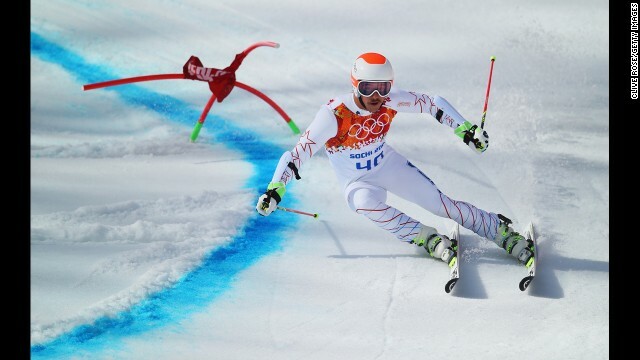 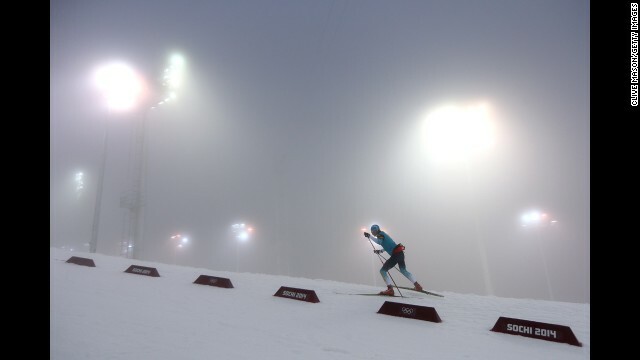 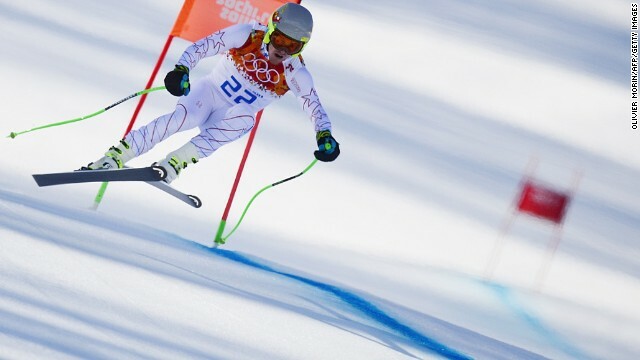 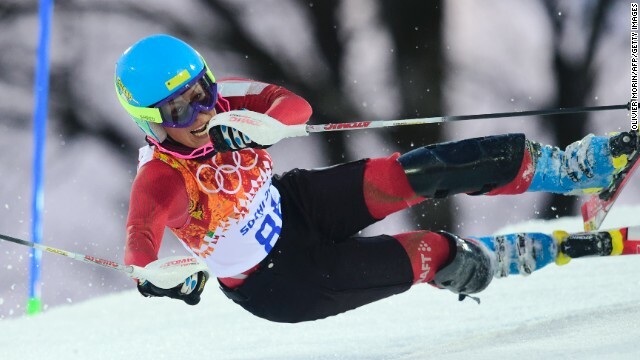 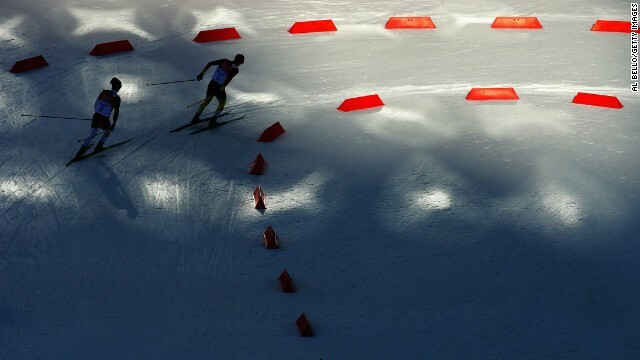 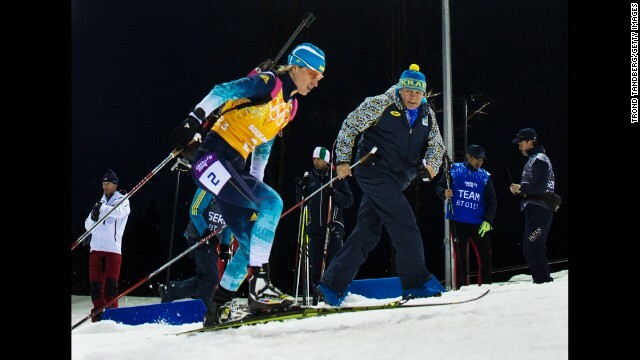 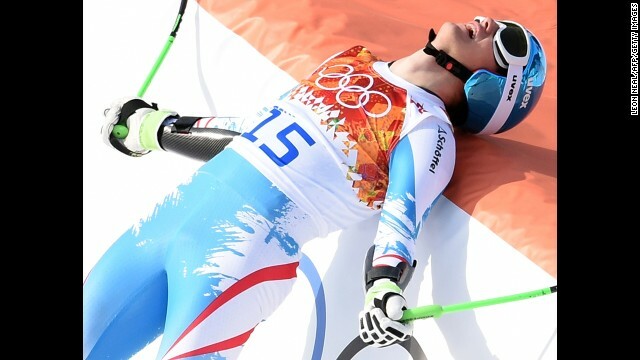 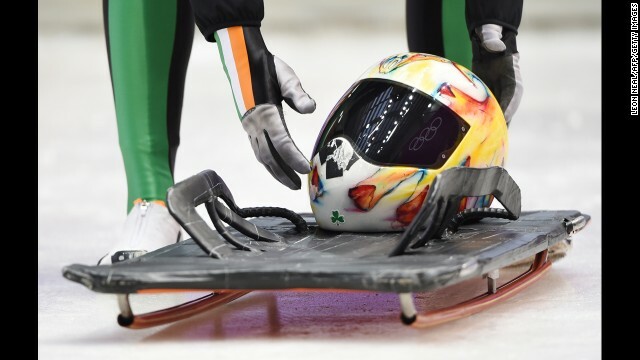 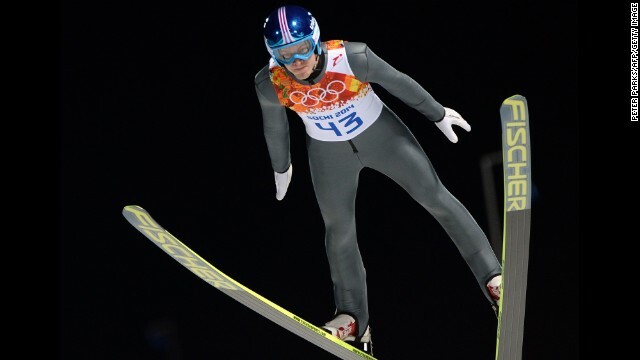 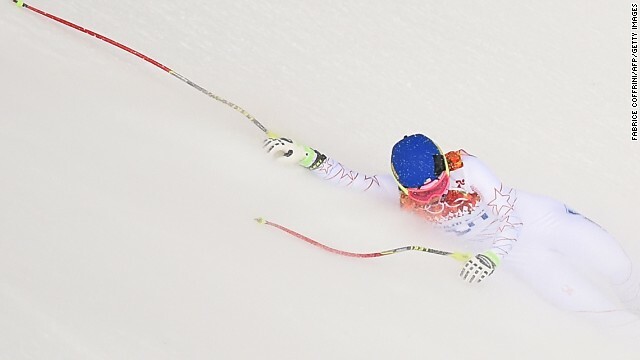 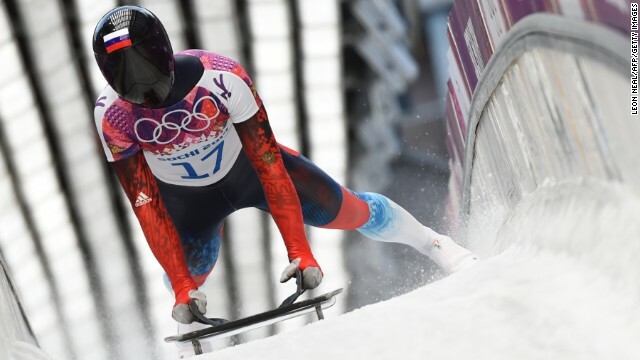 The double Olympic champion, who had been nursing a wrist injury, withdrew Wednesday just a day after admitting the course presented an "intimidating" challenge. 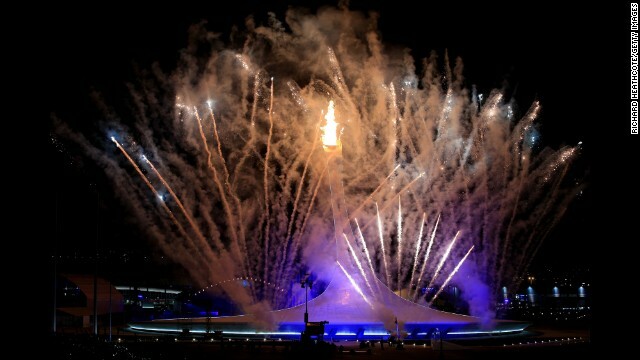 Fireworks explode over Fisht Olympic Stadium in Sochi, Russia, as the Olympic cauldron is lit during the opening ceremony of the 2014 Winter Games on Friday, February 7. 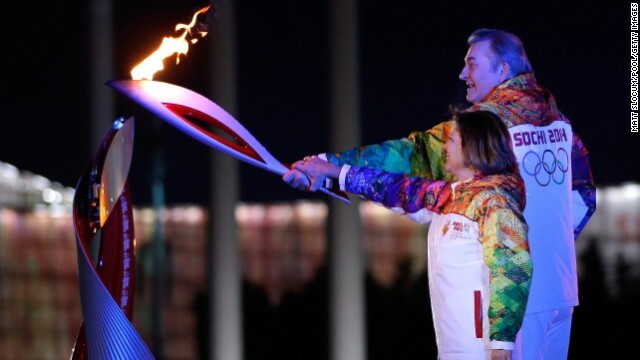 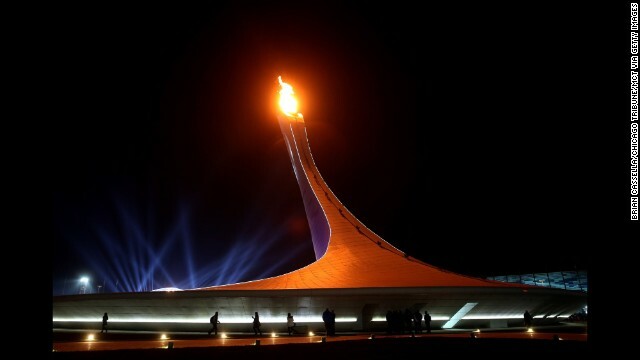 Two of Russia's greatest athletes, Irina Rodnina and Vladislav Tretiak, light the Olympic cauldron. 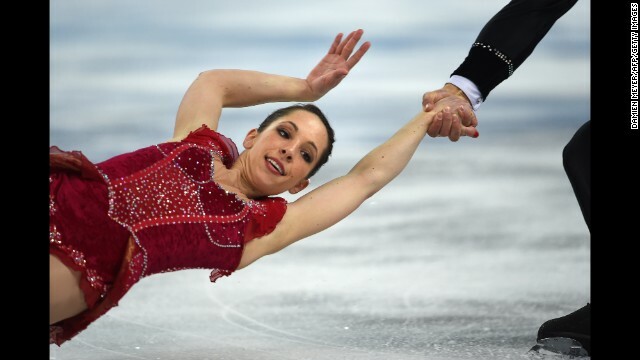 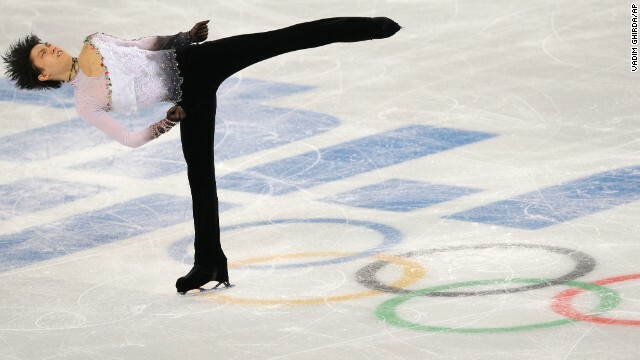 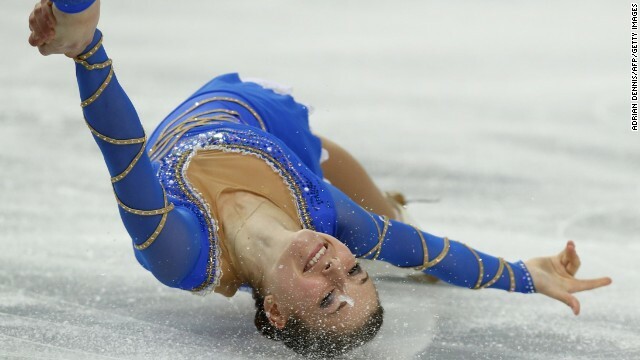 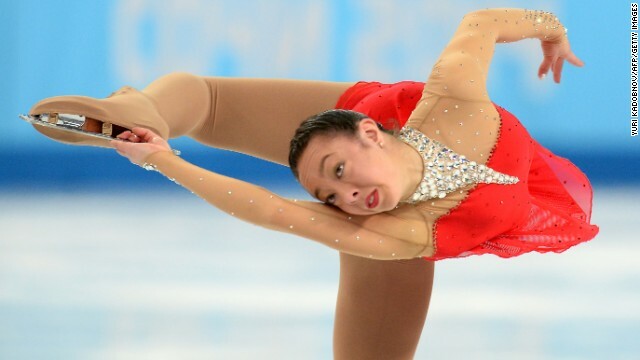 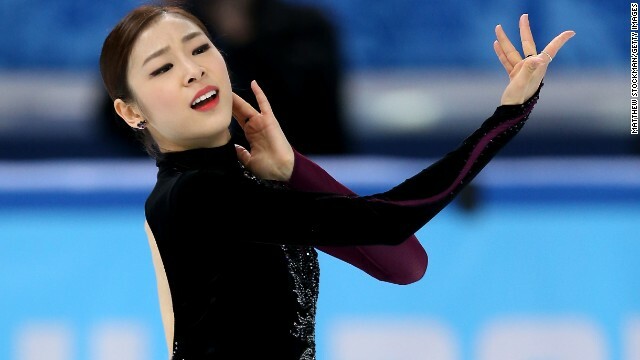 Rodnina was a three-time gold medalist in figure skating. 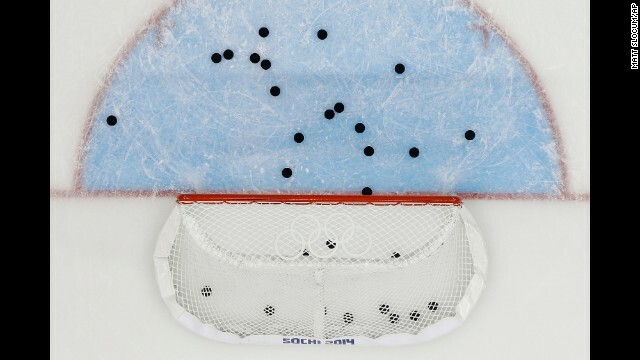 Tretiak won three golds as goalie of the Soviet hockey team. 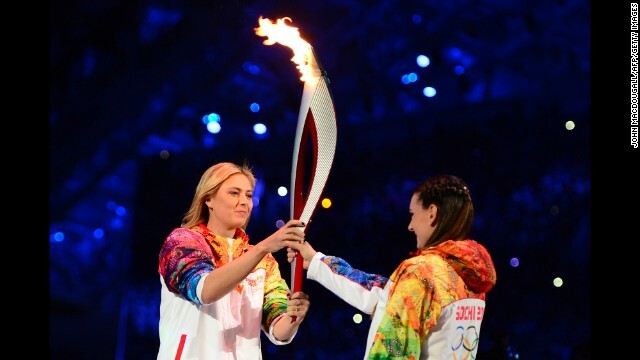 Russian tennis player and Olympic silver medalist Maria Sharapova, left, passes the Olympic torch to pole-vaulting legend Yelena Isinbayeva. 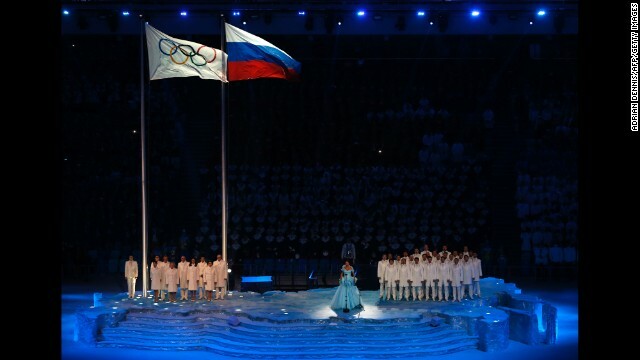 Russian soprano Anna Netrebko sings the Olympic Anthem. 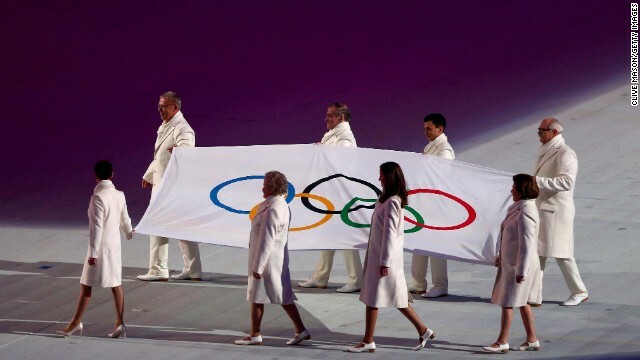 Olympic flag bearers carry the flag onto the floor during the opening ceremony. 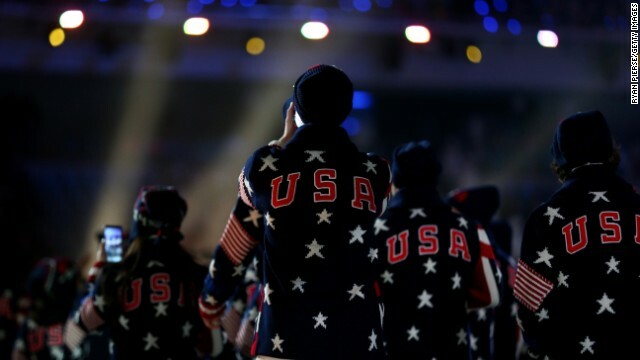 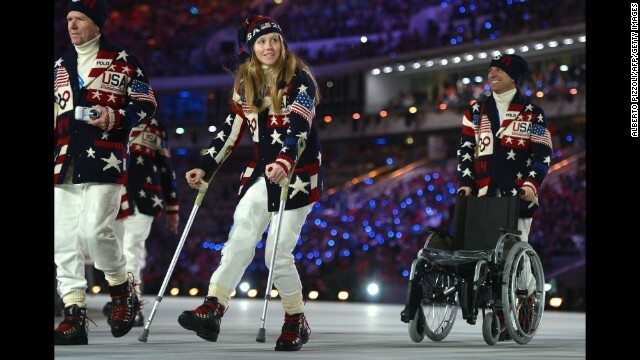 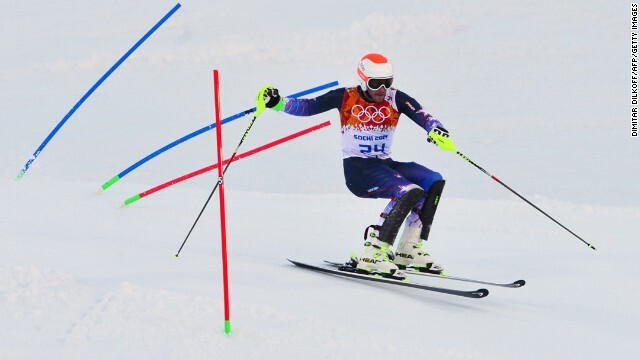 Skier Todd Lodwick carries the American flag during the opening ceremony. 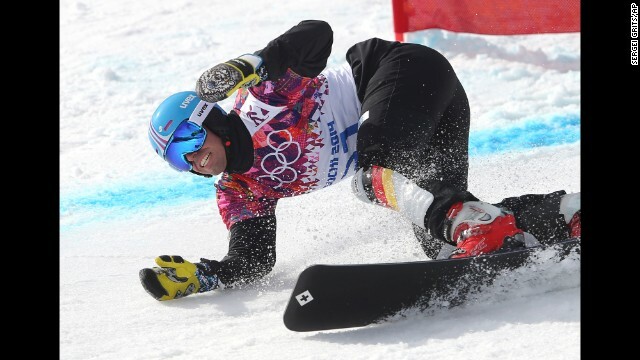 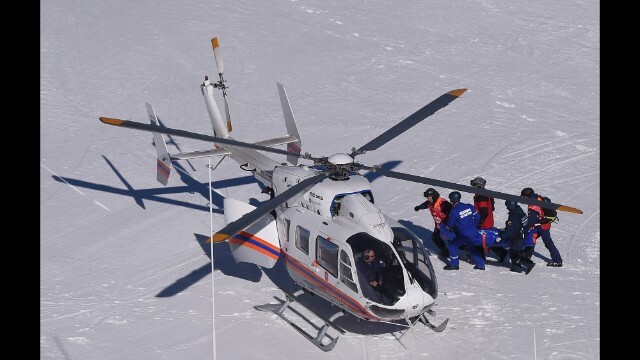 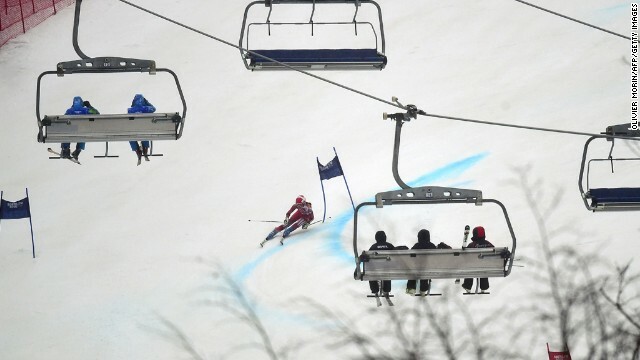 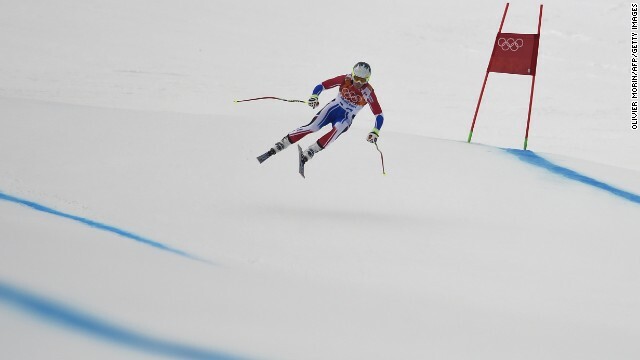 U.S. skier Heidi Kloser tore knee ligaments and broke her femur during a warm-up run earlier in the day. 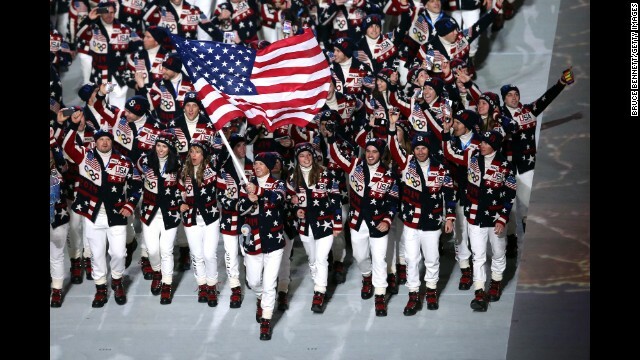 The U.S. Olympic team enters the stadium. 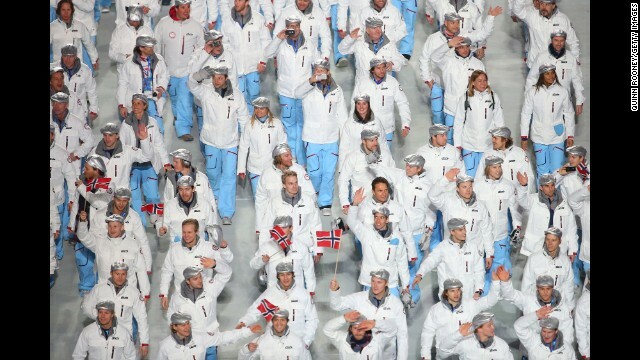 The Norwegian Olympic team enters. 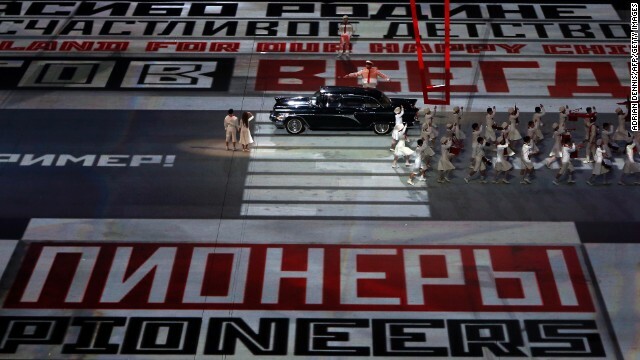 Russia's delegation parades through the stadium. 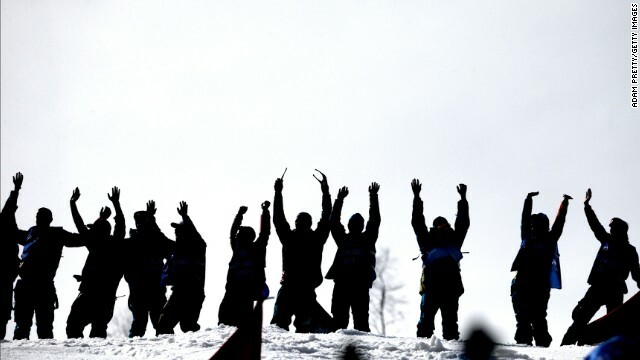 Members of Italy's delegation wave to the crowd. 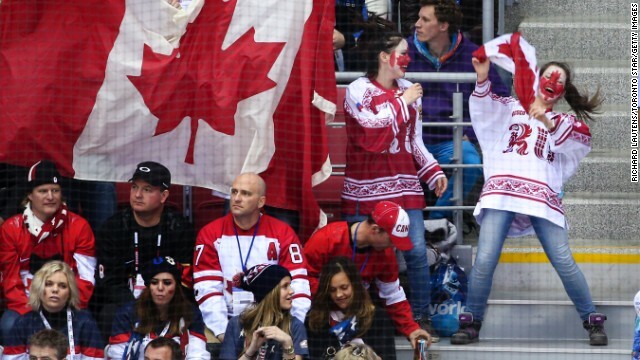 Prince Albert II and Princess Charlene of Monaco enjoy the atmosphere. 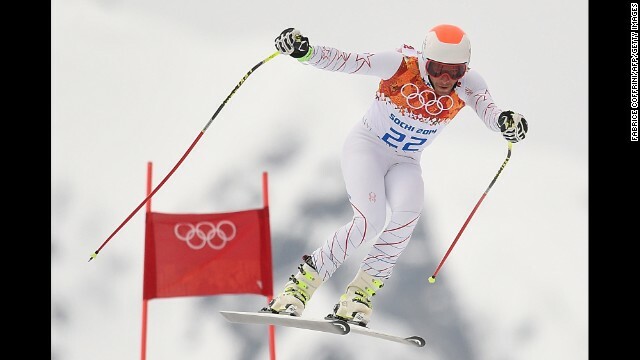 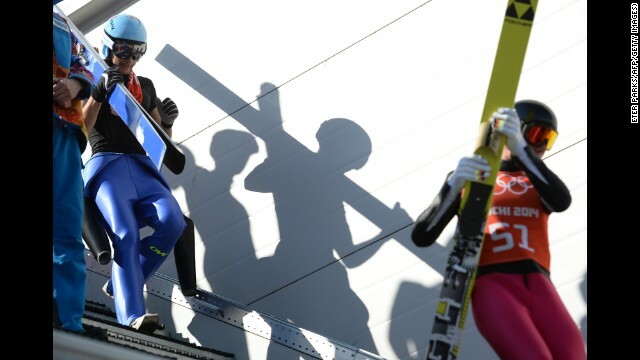 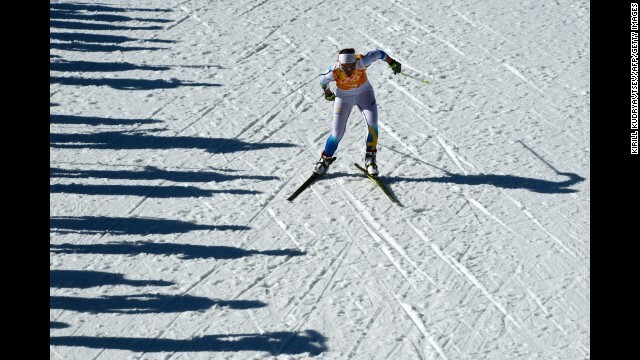 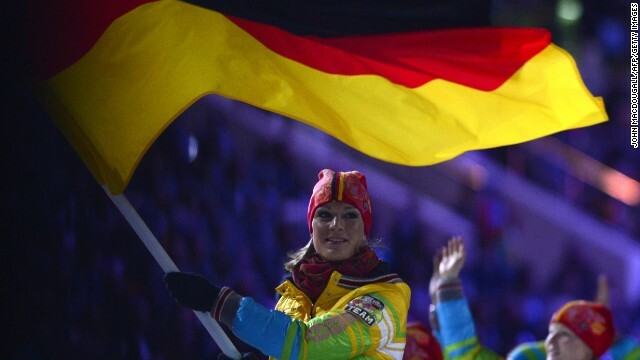 Germany's flag bearer, skier Maria Hoefl-Riesch, leads the German delegation. 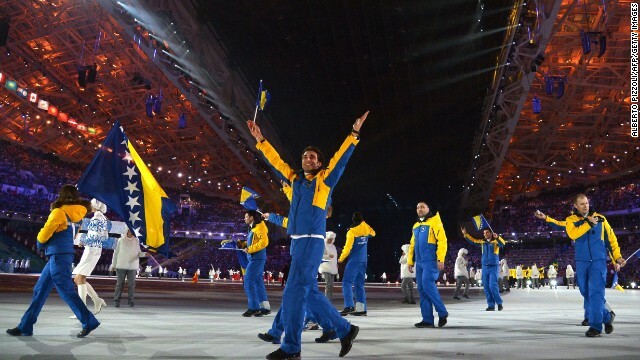 Members of the Bosnia and Herzegovina delegation enter the stadium. 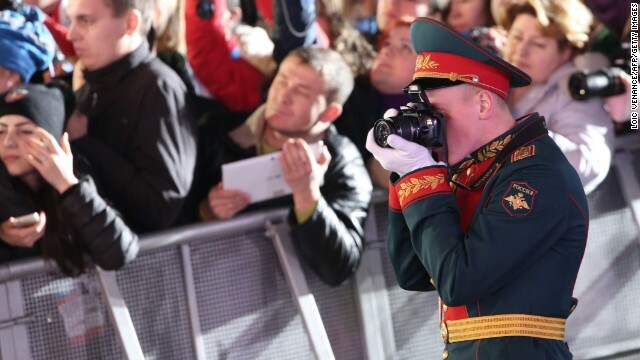 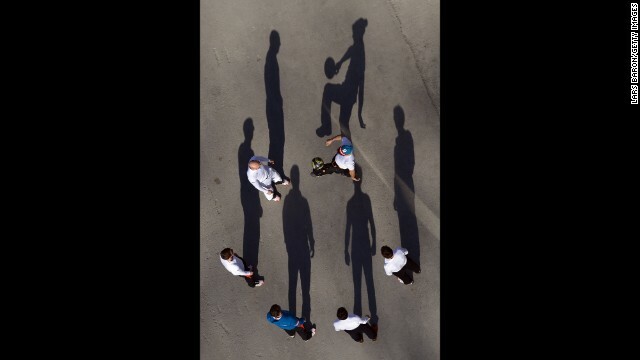 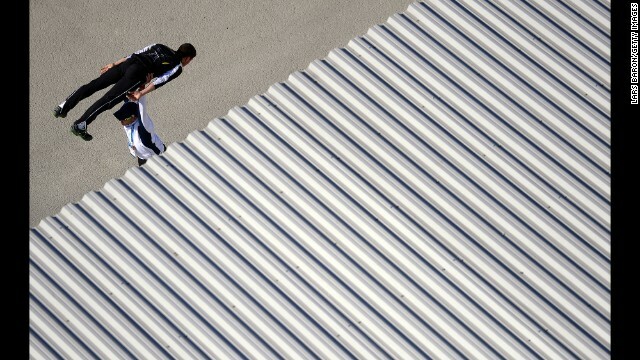 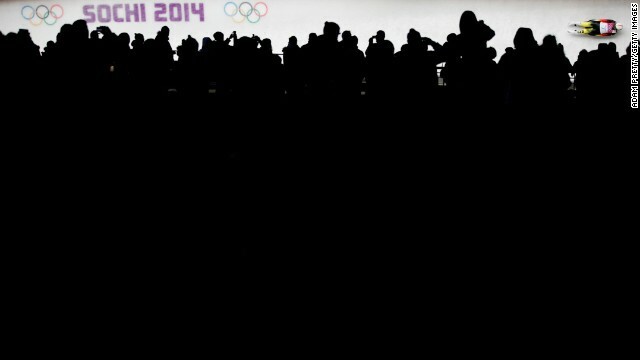 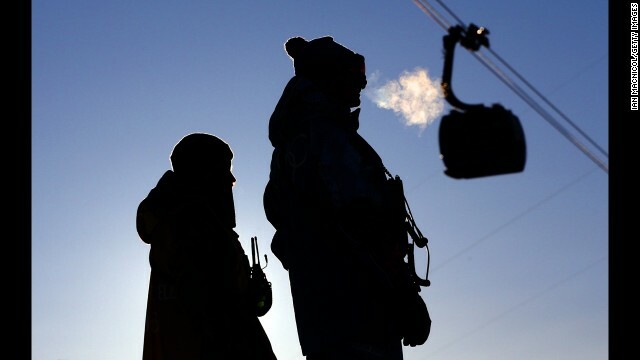 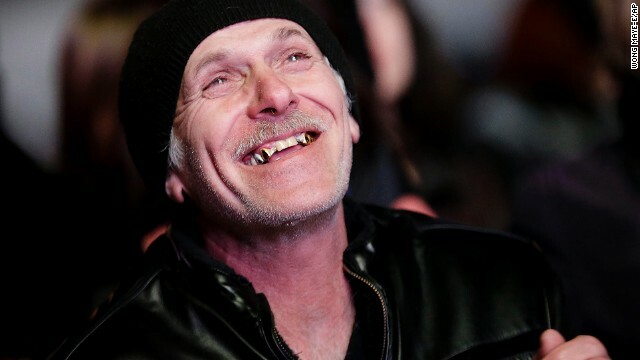 A man watches the live telecast of the opening ceremony in downtown Sochi. 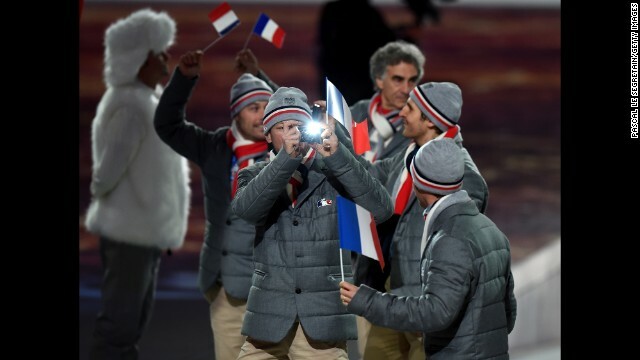 The French delegation enters the stadium. 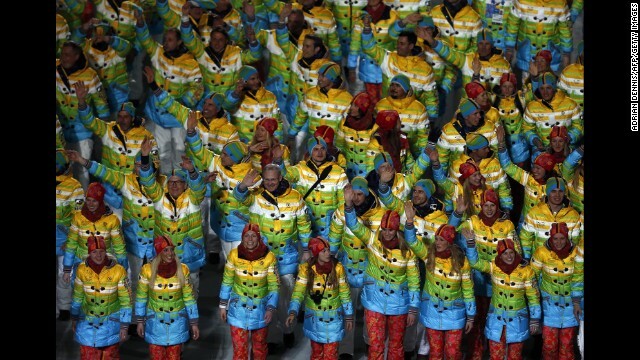 Members of the German delegation wave during the opening ceremony. 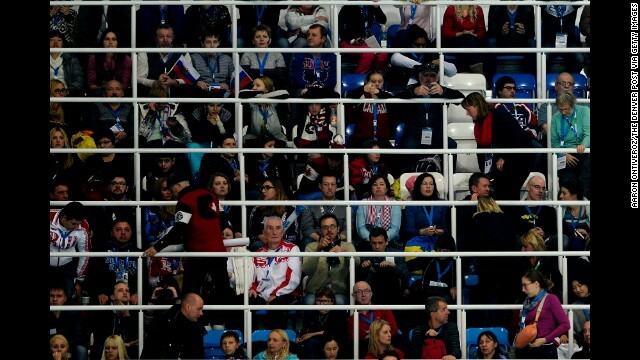 Great Britain's flag bearer, short-track speed skater Jon Eley, waves as he leads the British delegation. 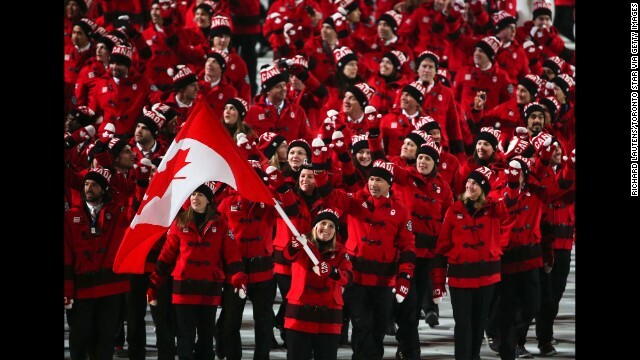 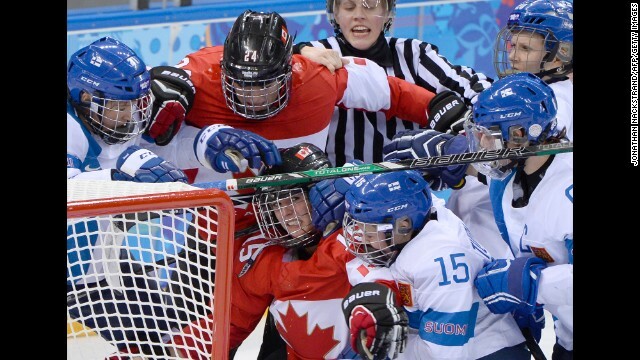 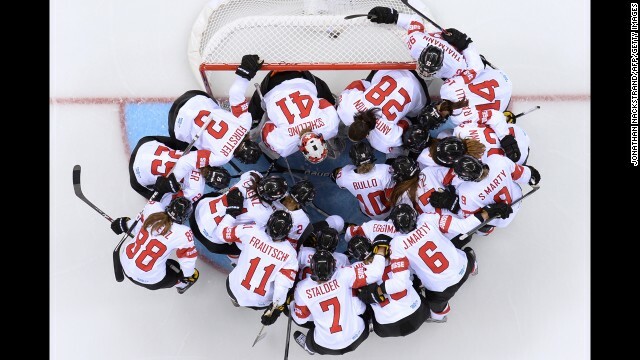 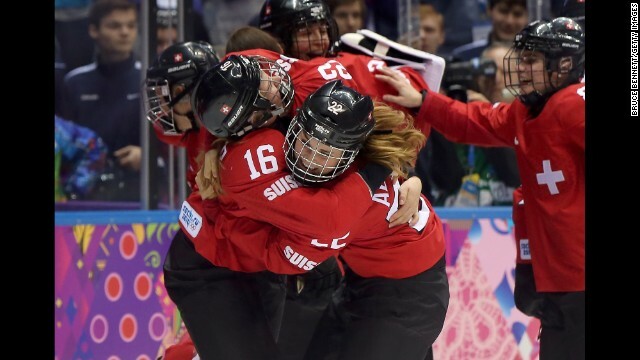 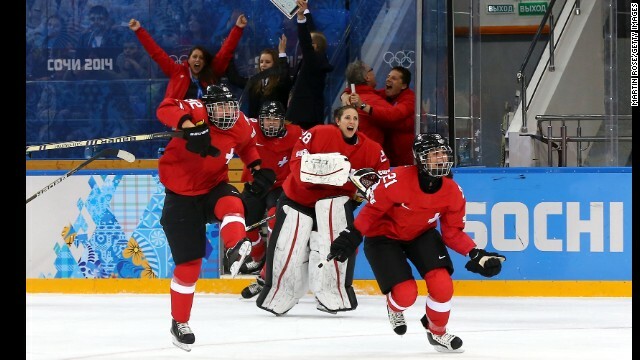 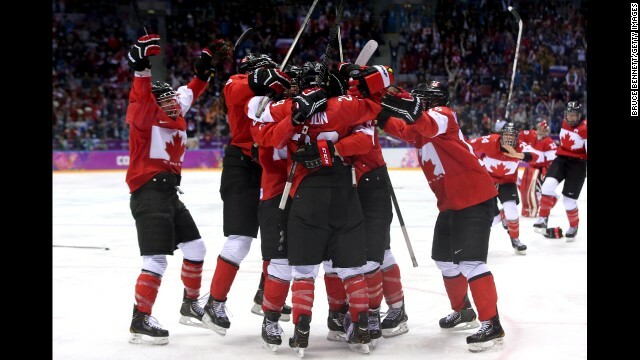 The Canadians, led by hockey player Hayley Wickenheiser, enter the stadium. 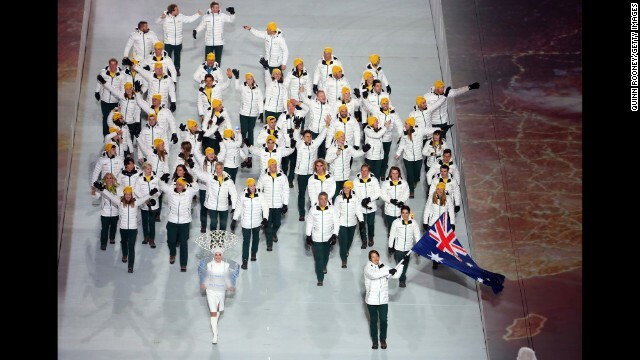 Snowboarder Alex Pullin of the Australian Olympic team carries his country's flag during the opening ceremony. 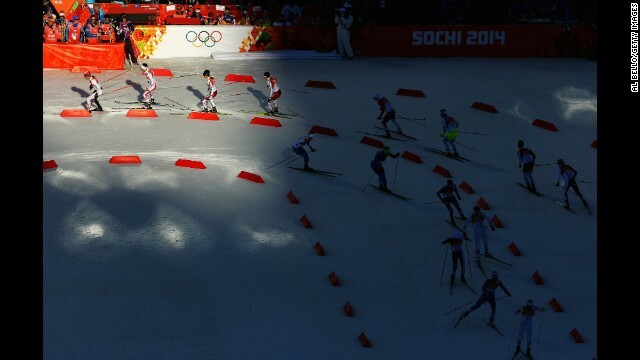 The sun follows horses during the opening ceremony. 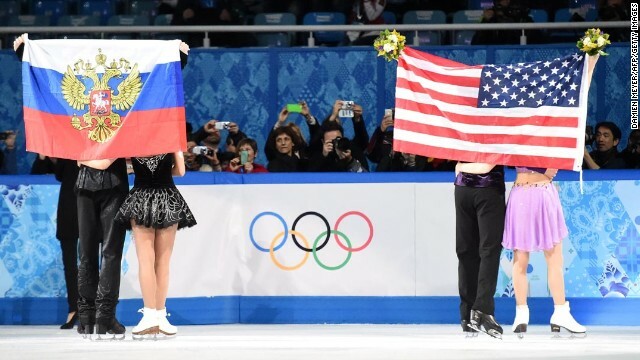 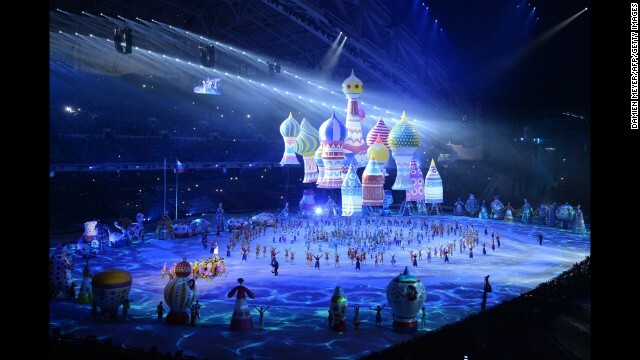 The theme of the ceremony was "Dreams of Russia." 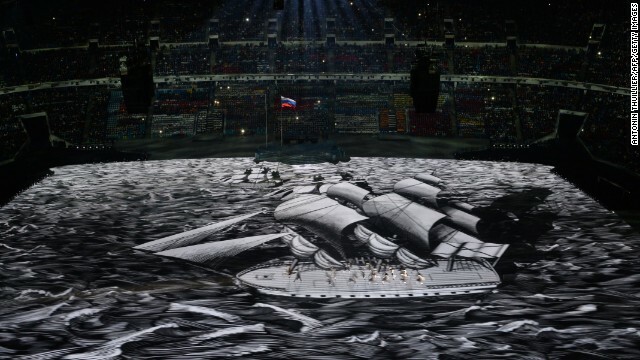 People move as a boat is projected across the floor of the stadium. 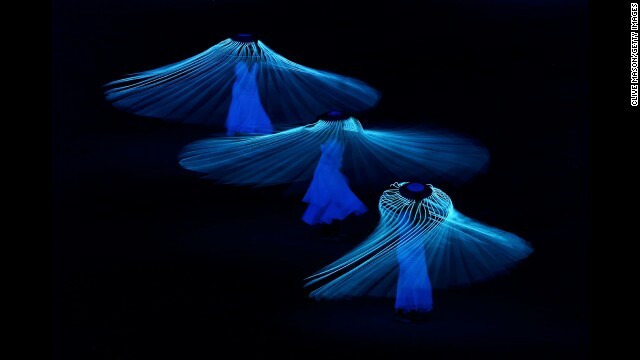 Performers dance during the ceremony. 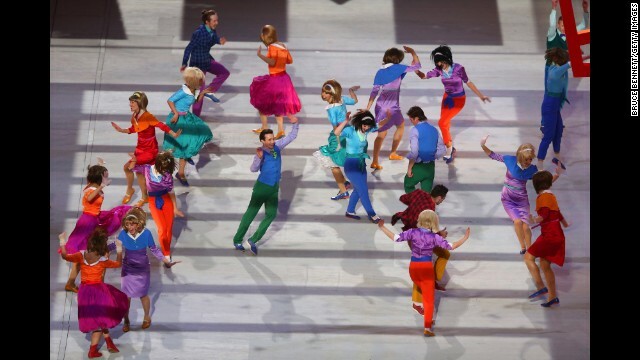 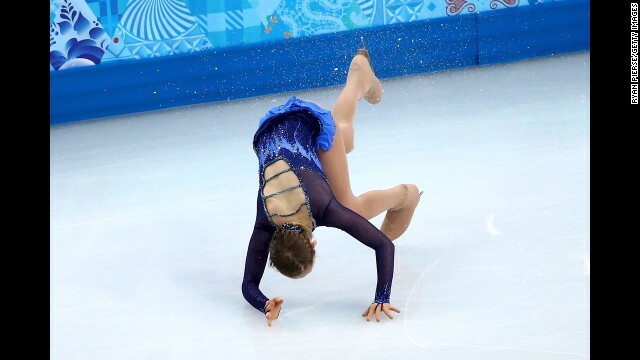 Performers skate around the stadium floor during the ceremony. 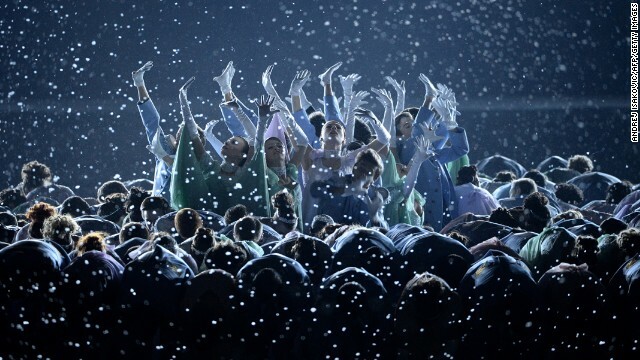 Artists perform during the ceremony. 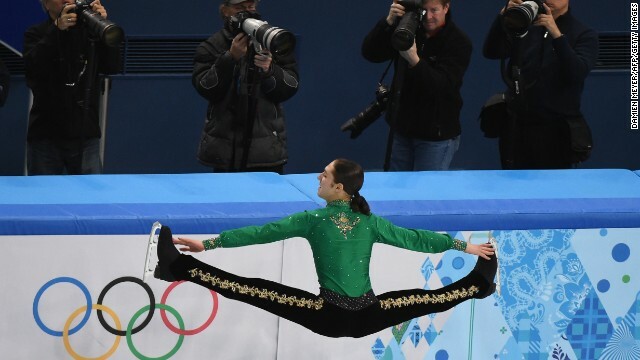 Ballet dancer Diana Vishneva performs during the ceremony. 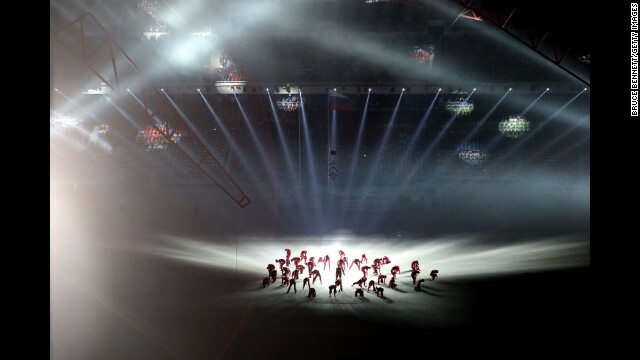 Dancers are seen during the ceremony. 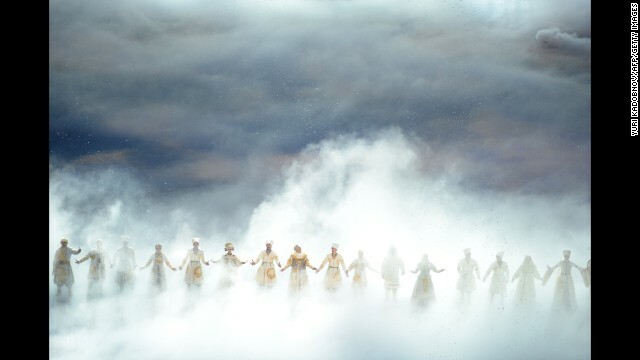 Dancers perform a scene portraying the Russian Revolution of 1917. 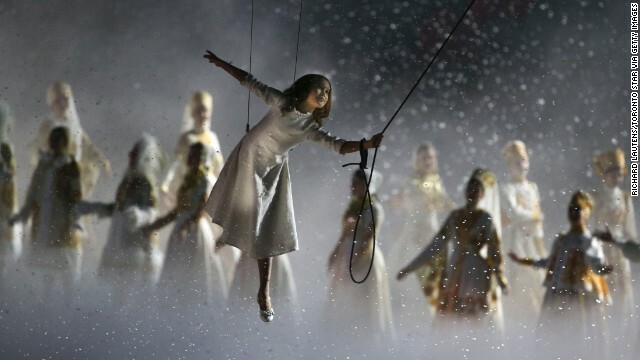 A girl performs during the event. 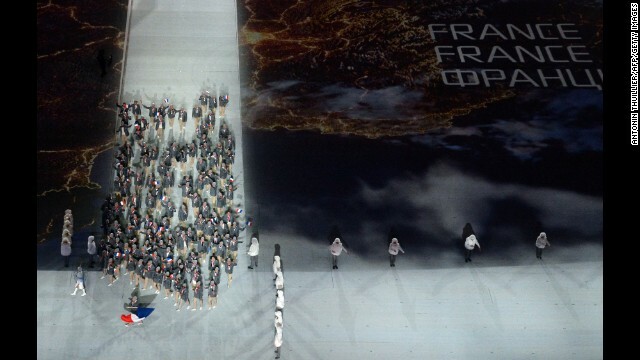 Text is projected on the floor of the stadium. 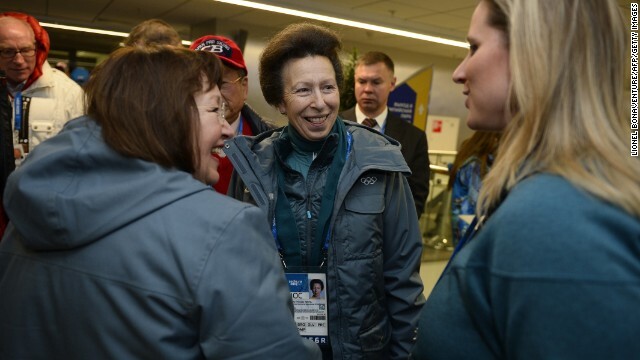 Britain's Princess Anne, center, talks with people upon arriving for the opening ceremony. 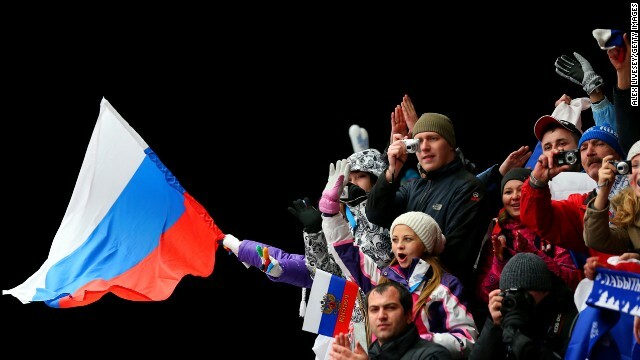 Performers in illuminated red, white and blue outfits prepare to form the Russian national flag. 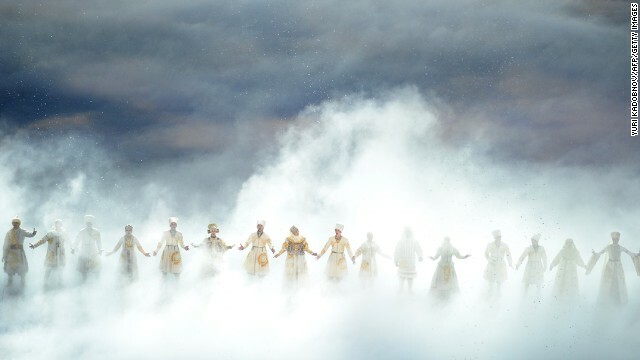 A scene from the dancers' performance. 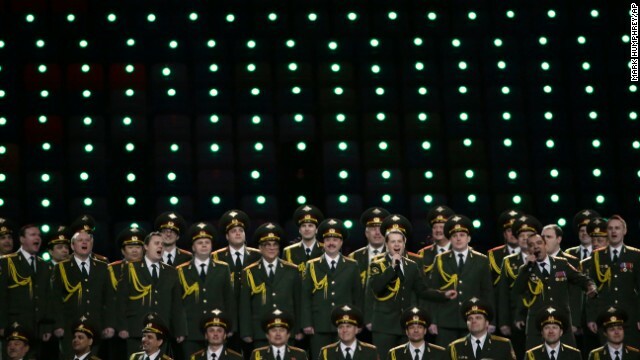 Performers sing during the event. 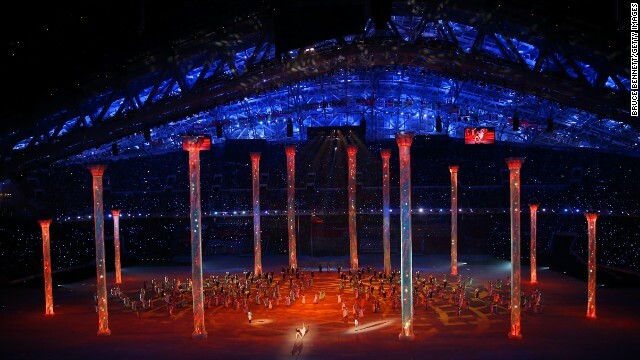 Performers take their places inside the packed stadium. 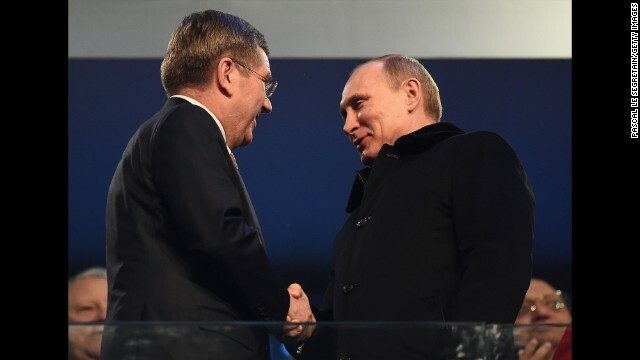 Thomas Bach, president of the International Olympic Committee, shakes hands with Russian President Vladimir Putin, right. 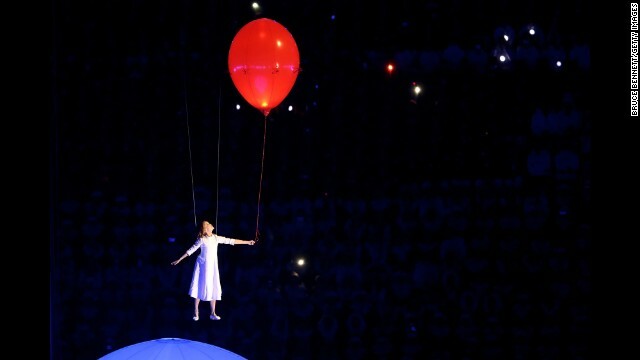 A girl takes a "magical kite ride through history" during the opening ceremony. 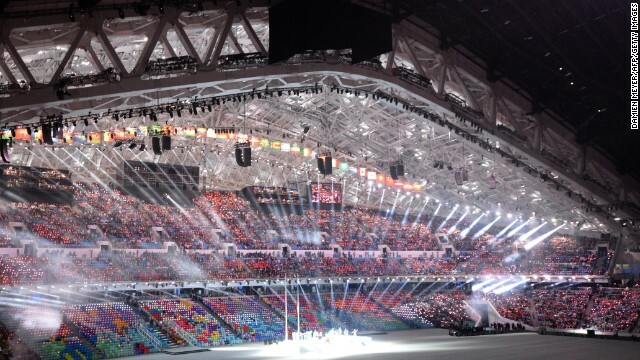 A general view of the stadium during the opening ceremony. 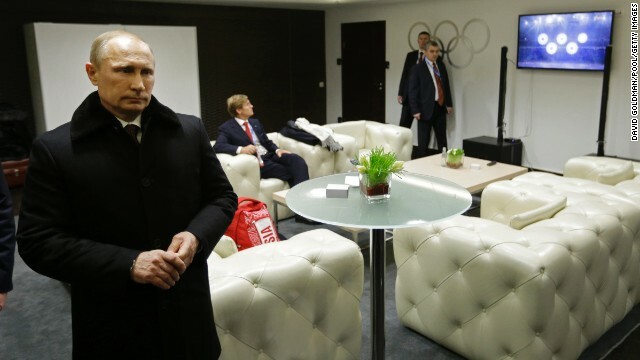 Putin waits to be introduced at the ceremony. 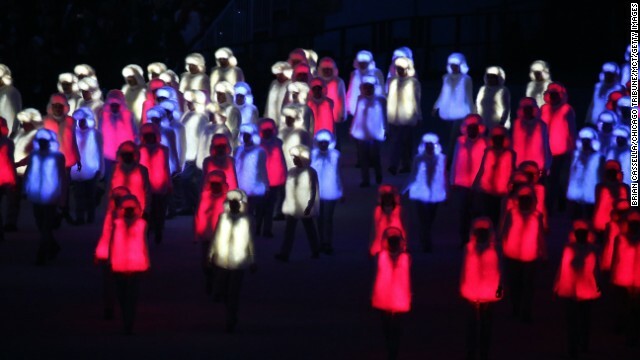 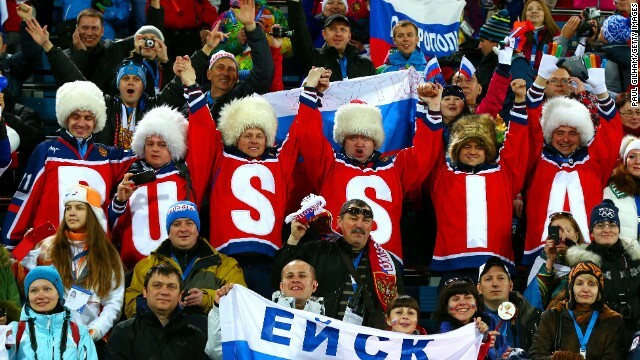 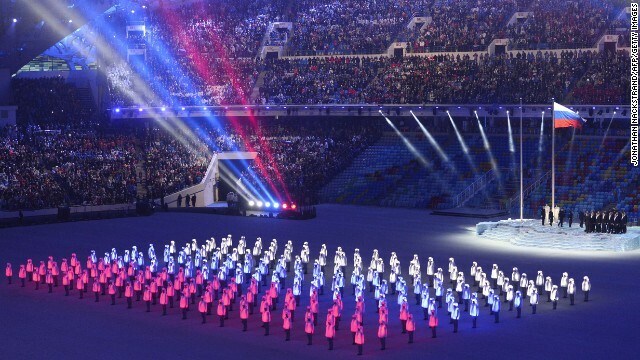 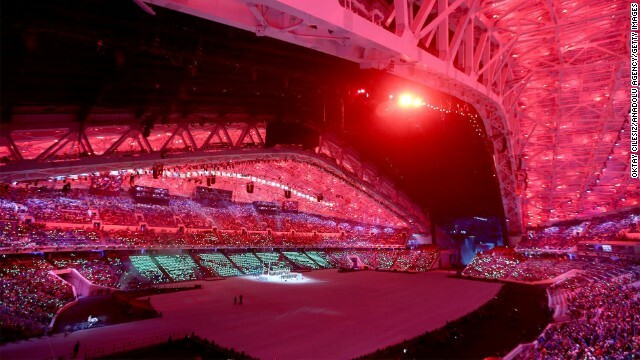 Performers' jackets light up to form the Russian flag. 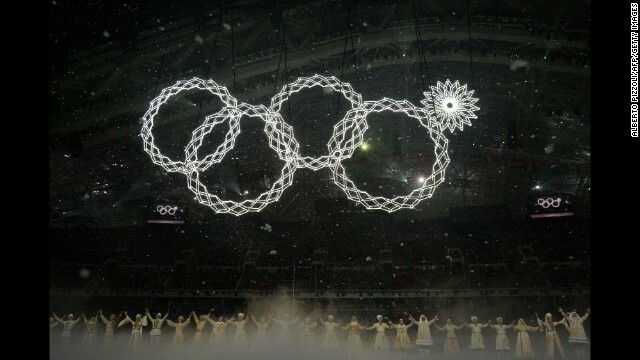 The Olympic rings are presented during the opening ceremony -- but there seemed to be a malfunction on the top right ring. 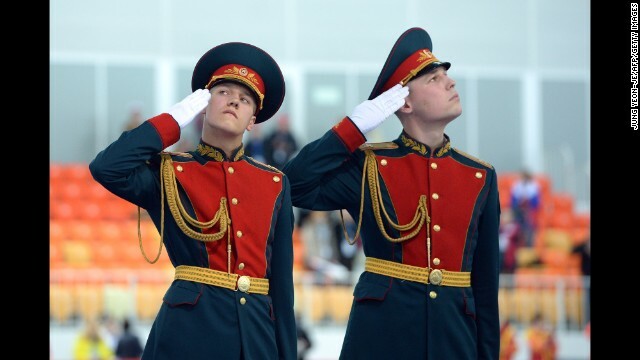 The Russian Interior Ministry choir performs before the opening ceremony. 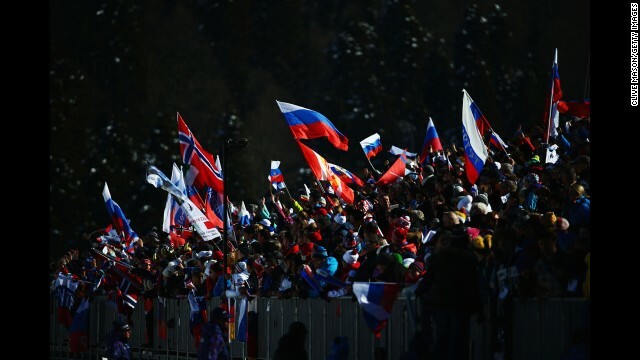 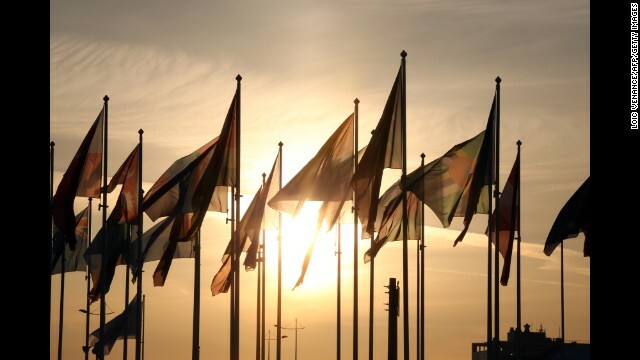 Before the start of the ceremony, the sun sets behind delegation flags. 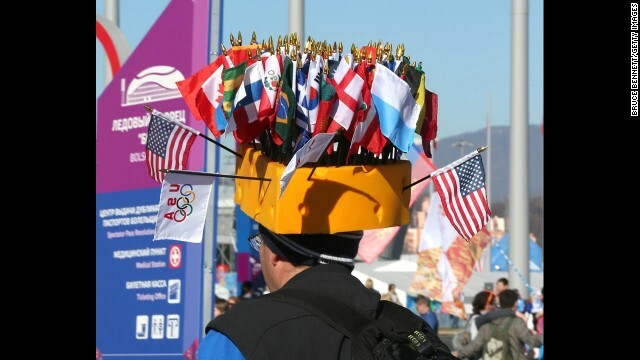 A spectator poses for a photo as she arrives for the opening ceremony. 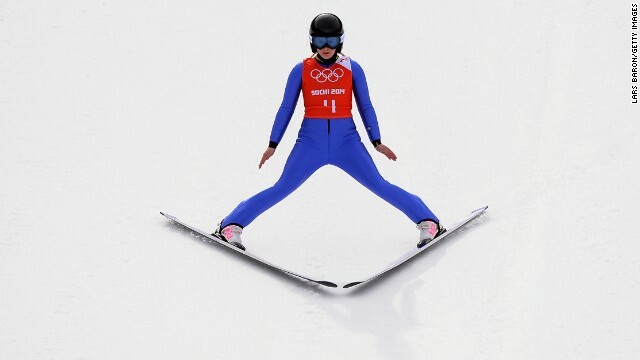 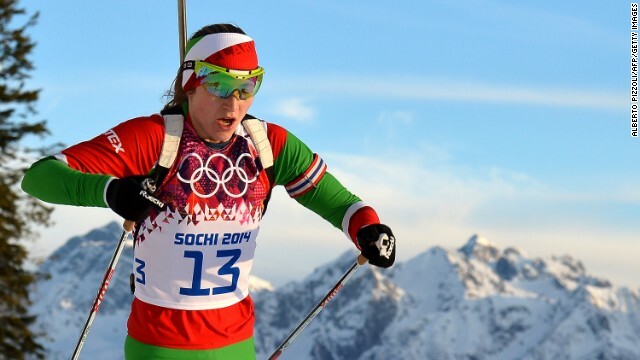 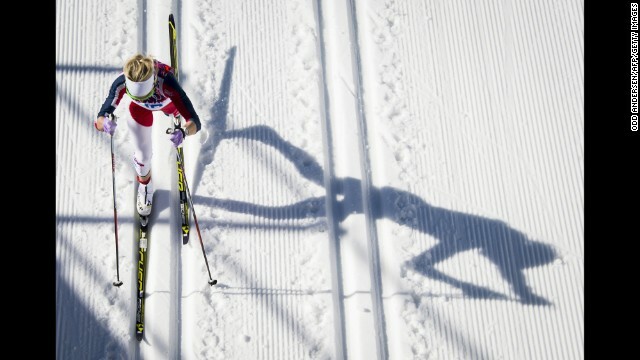 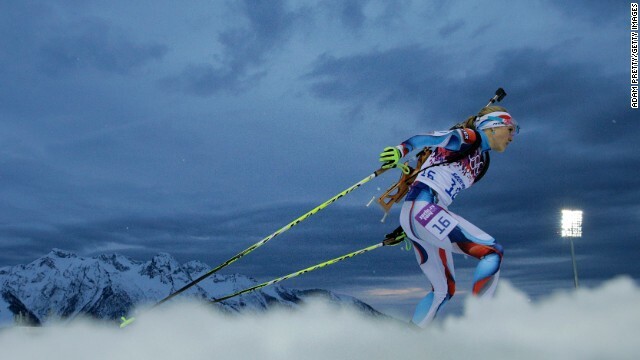 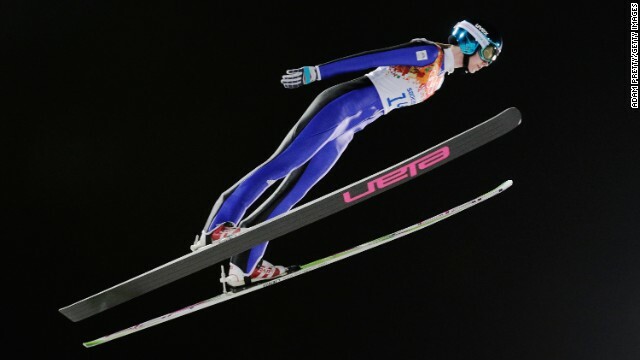 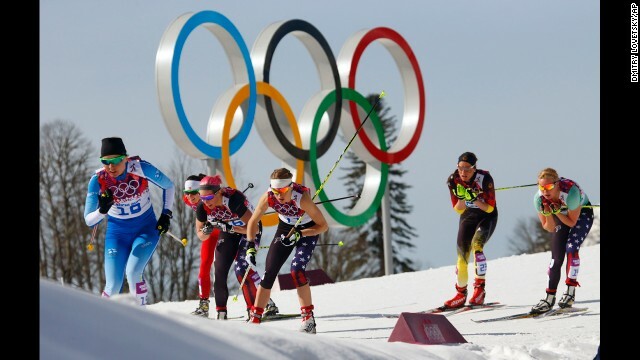 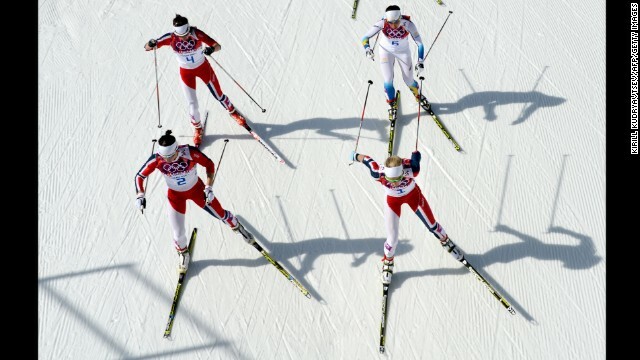 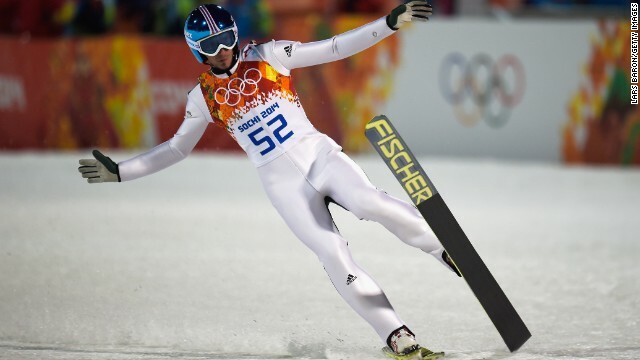 Saturday's second gold was taken by Norway's Marit Bjoergen in the women's skiathlon. 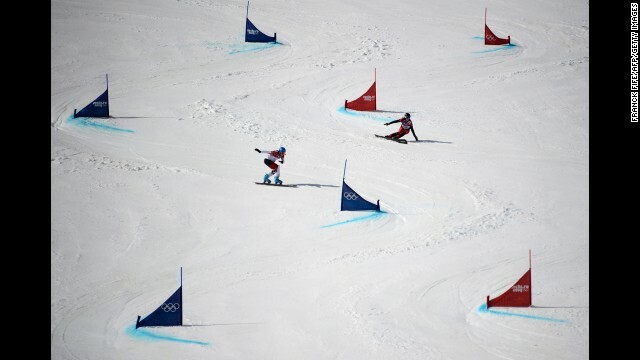 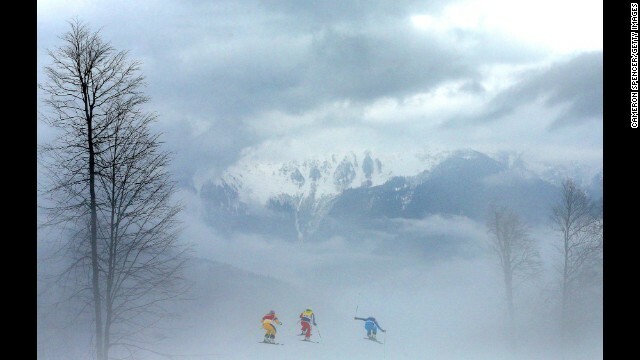 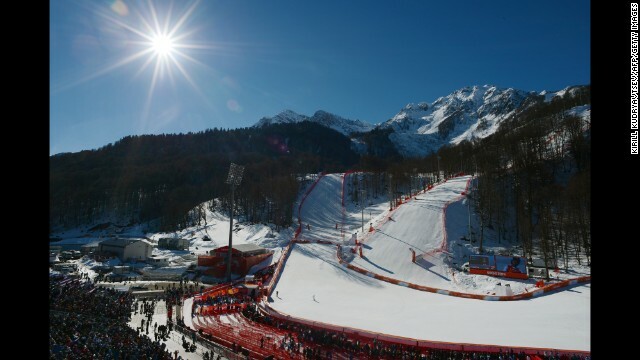 The 15km course is split between a classic style for the first 7.5 km, then a final leg in freestyle. 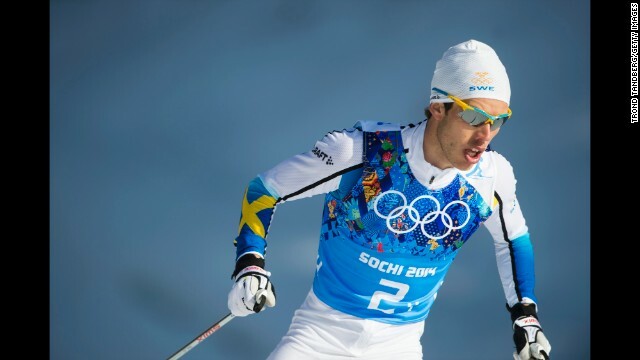 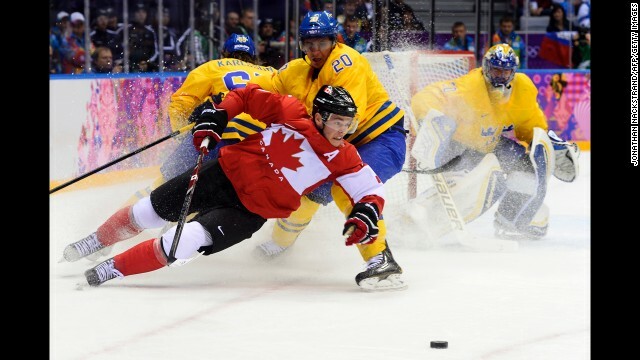 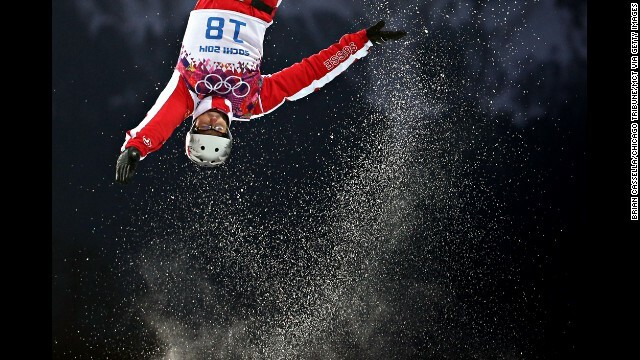 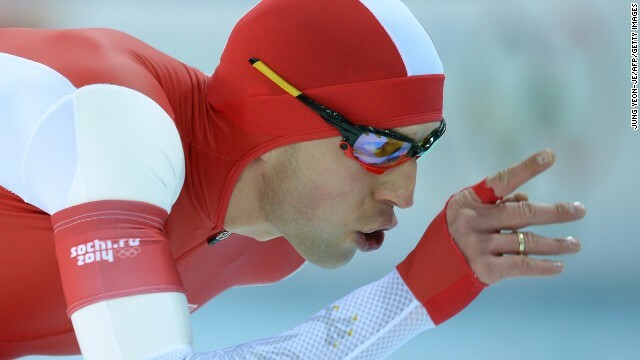 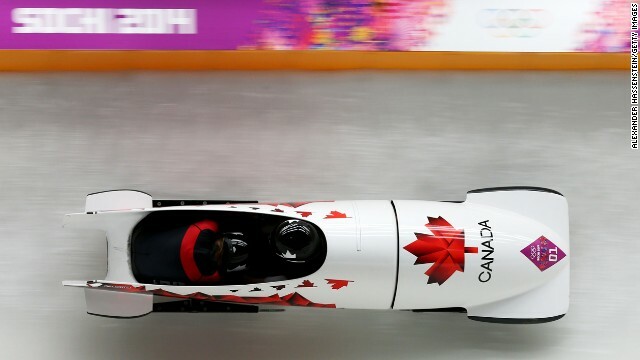 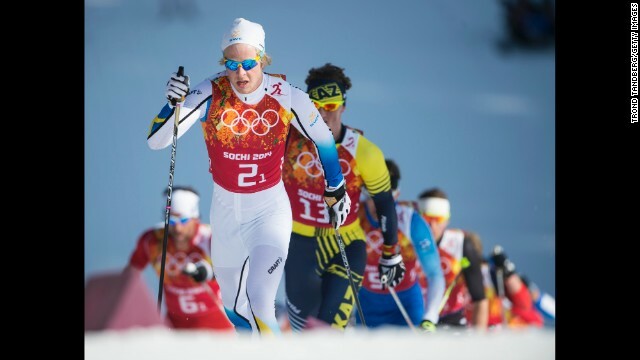 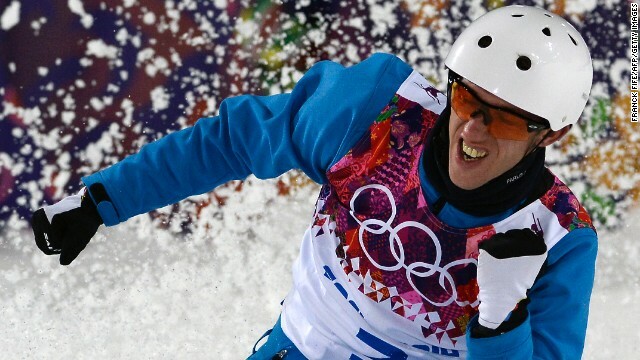 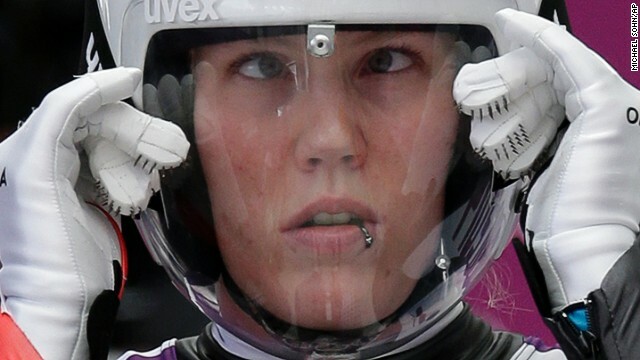 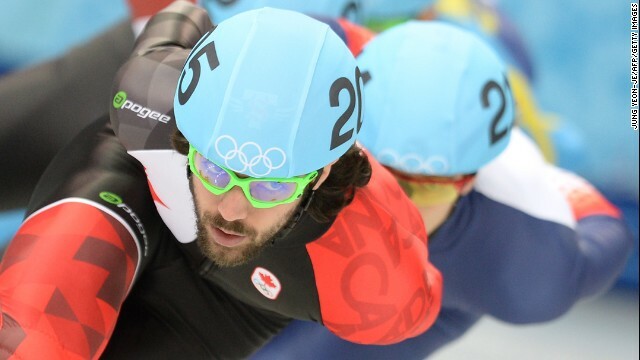 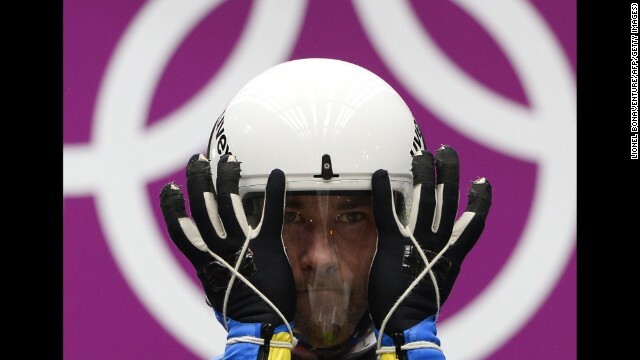 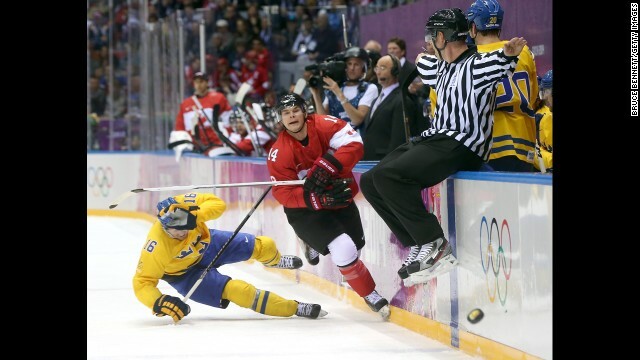 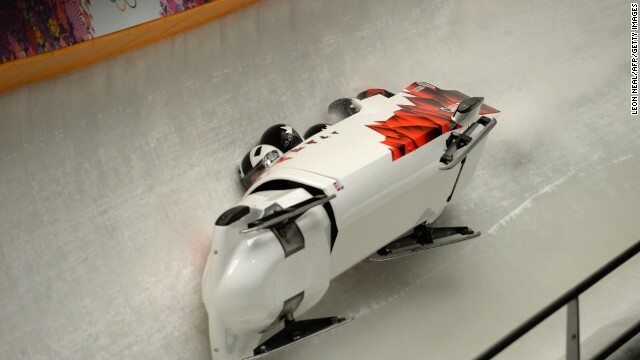 Bjoergen, a star of the 2010 Vancouver games, is expected to be a dominant force in the Sochi Winter Olympics. 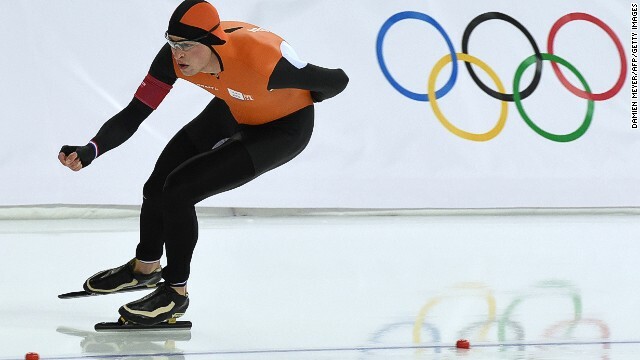 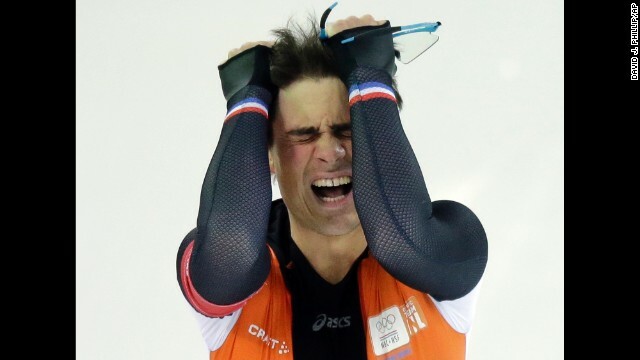 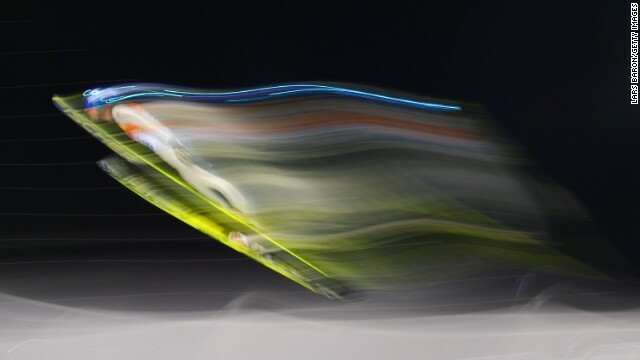 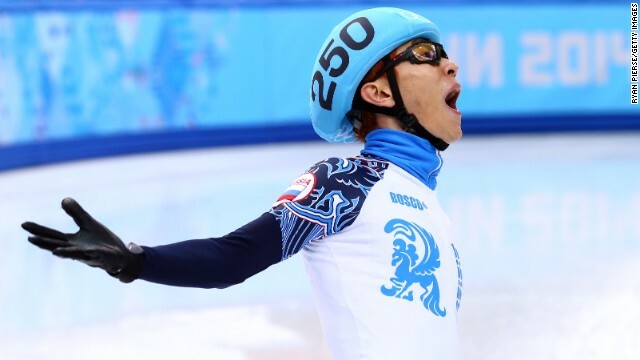 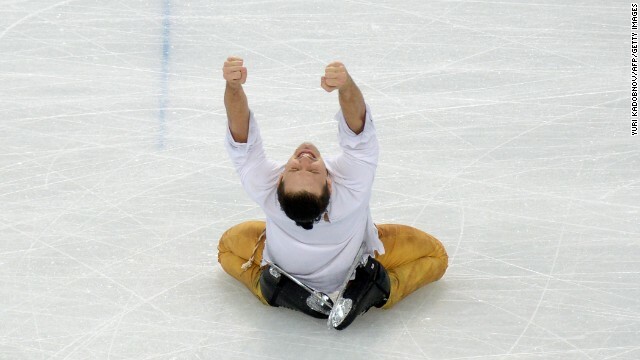 Defending Olympic champion Sven Kramer of Netherlands then took gold in 5,000 meter speed skating, smashing the previous record. 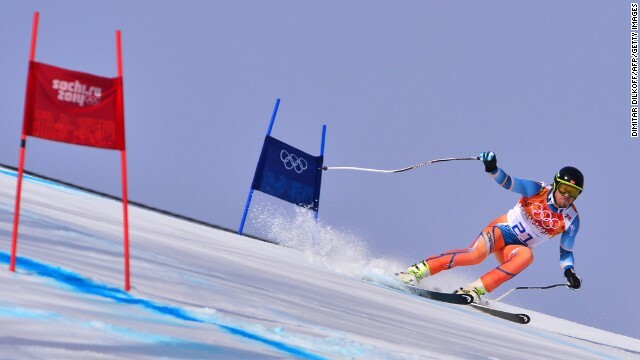 Compatriots Jan Blokhuijsen and Jorrit Bergsma came second and third. 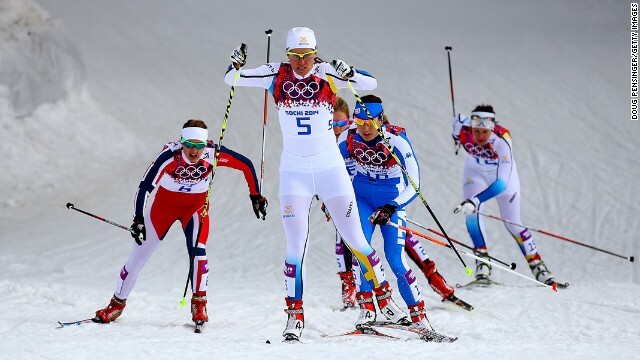 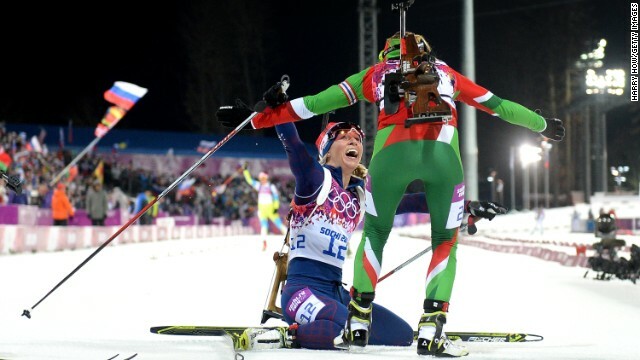 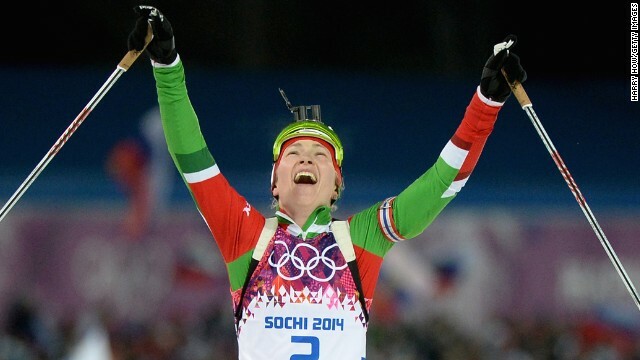 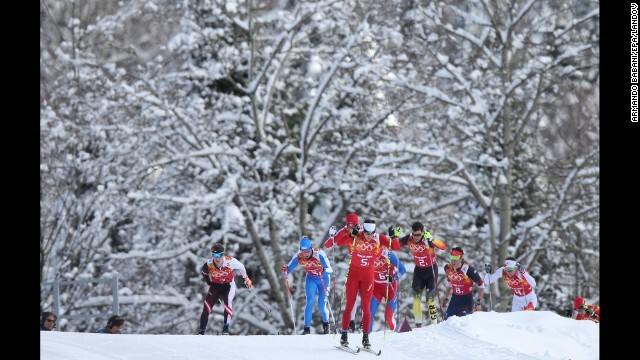 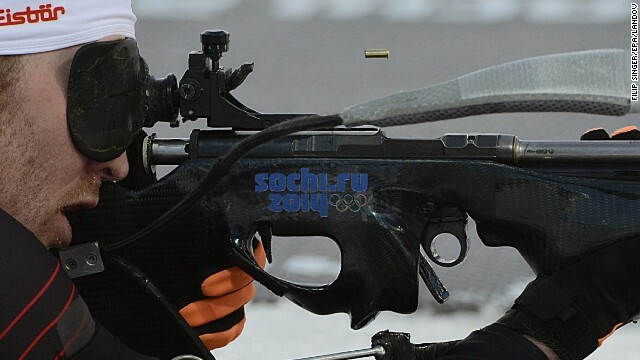 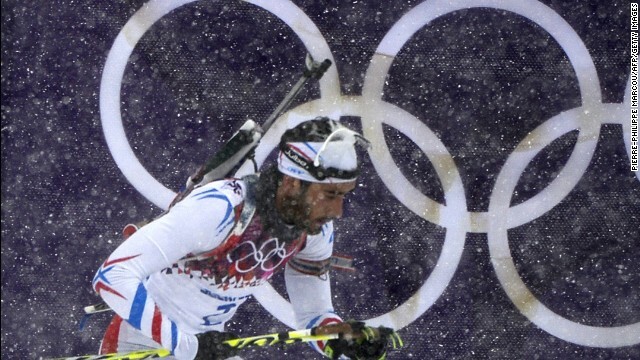 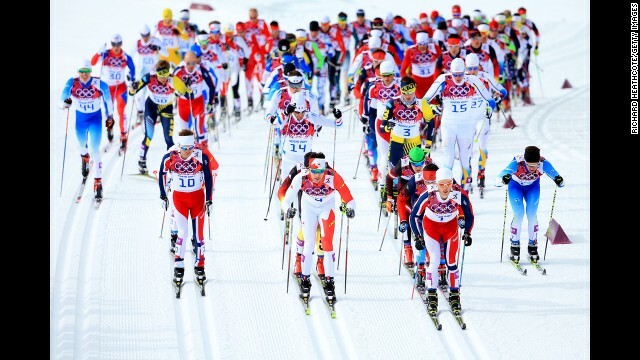 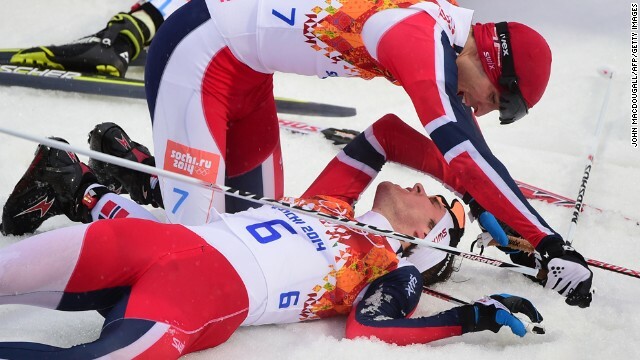 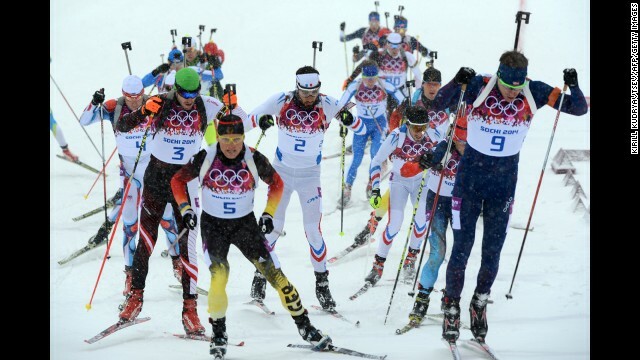 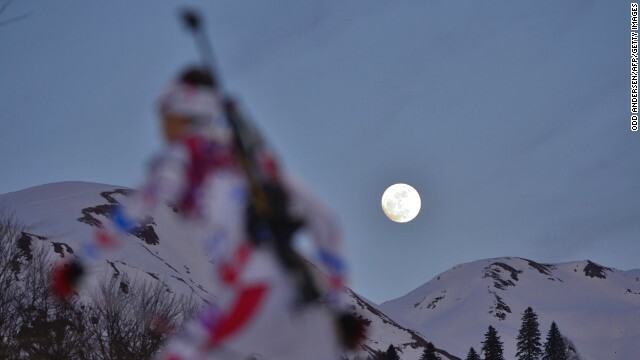 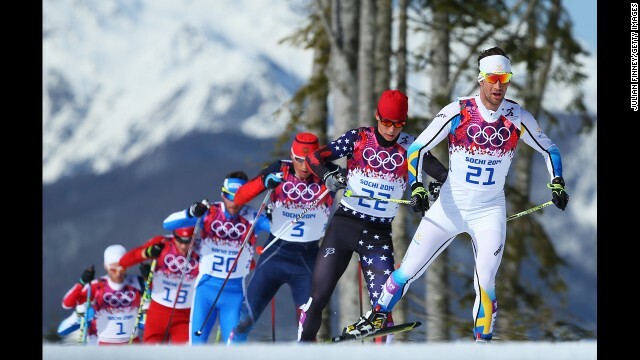 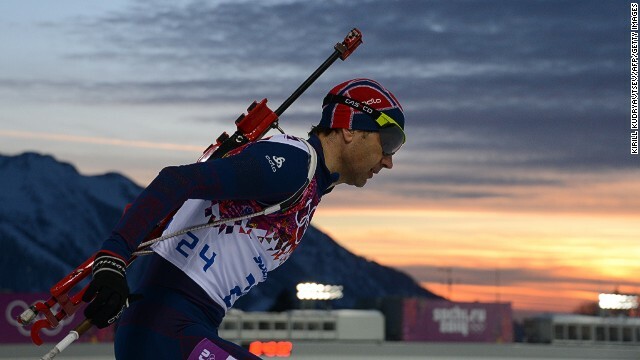 The day's fourth gold went to Ole Einar Bjoerndalen of Norway, in the biathlon men's 10km sprint. 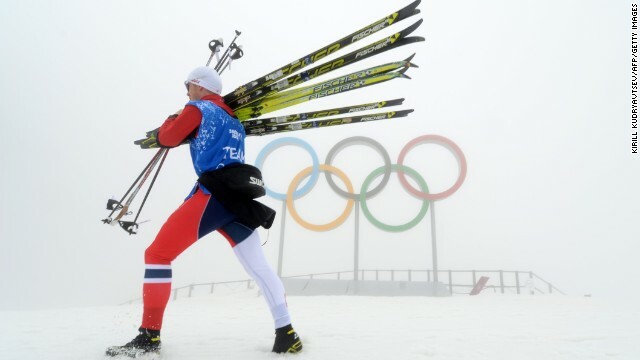 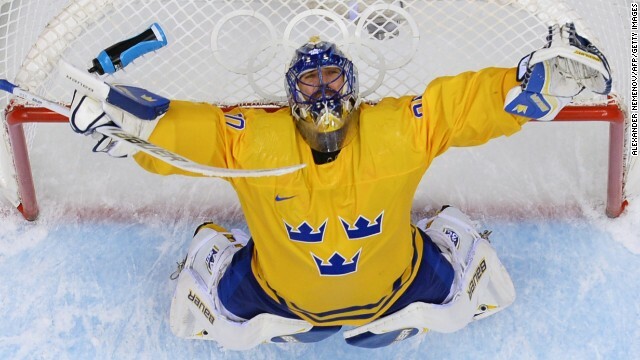 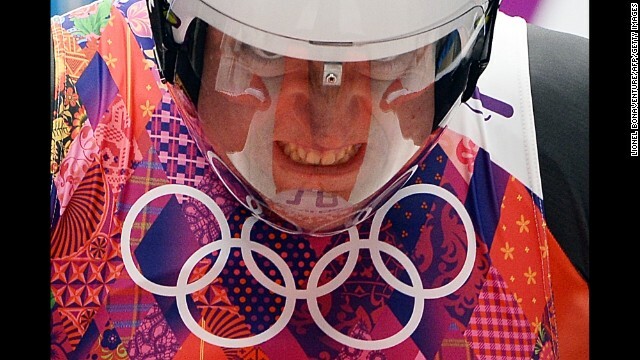 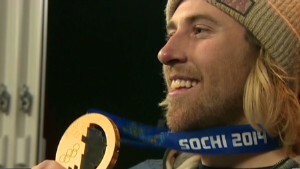 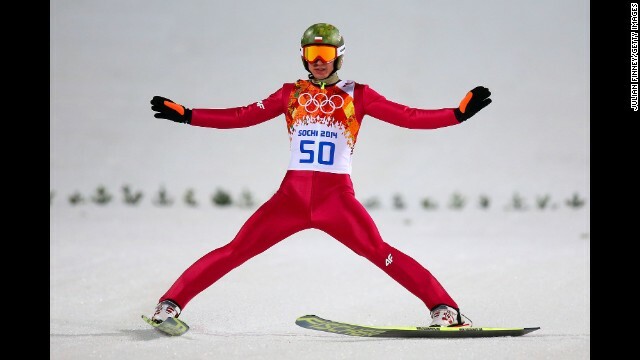 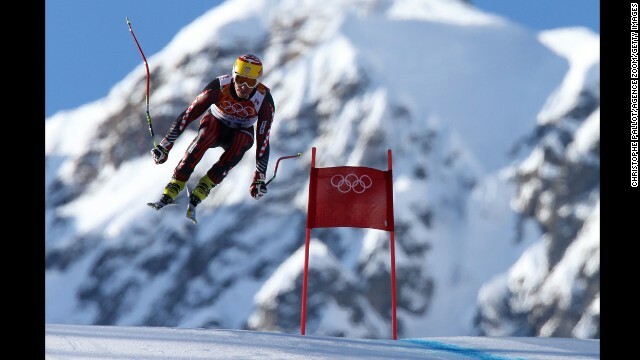 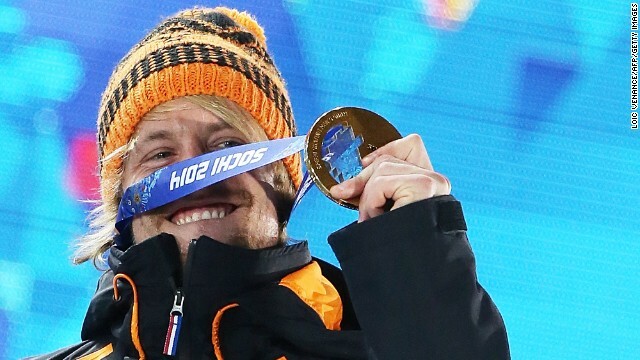 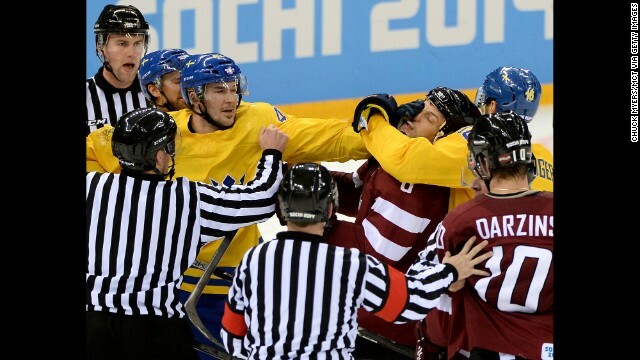 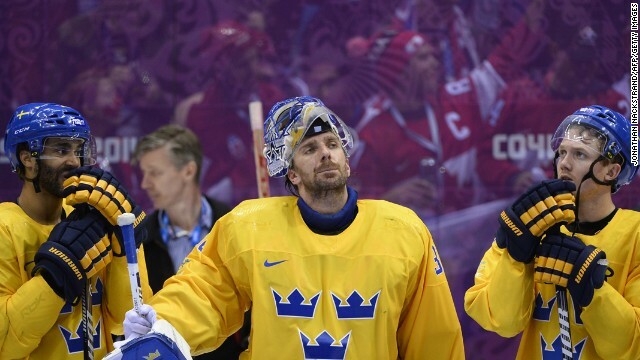 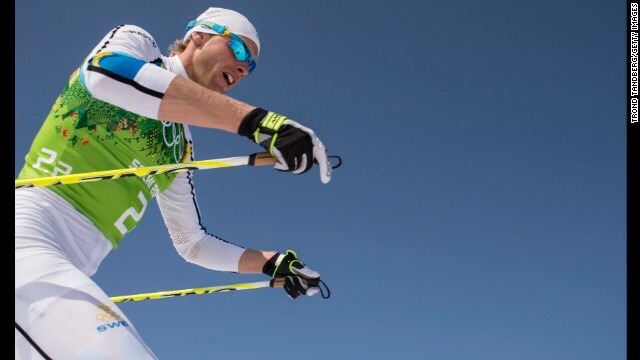 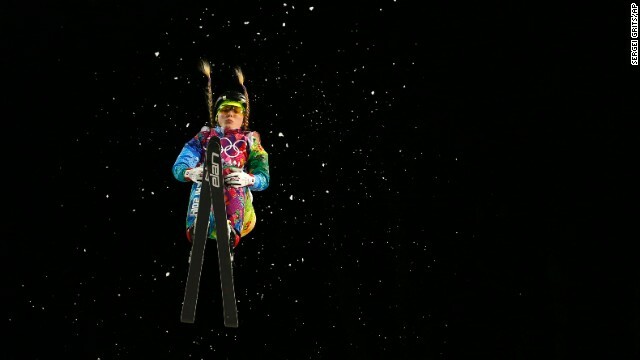 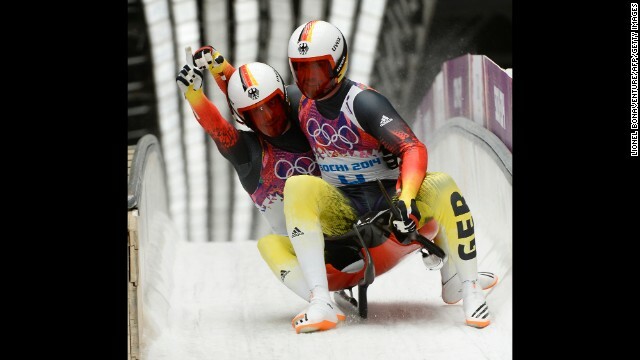 His efforts made him the joint most decorated Winter Olympian of all time, with compatriot Bjorn Dahlie. 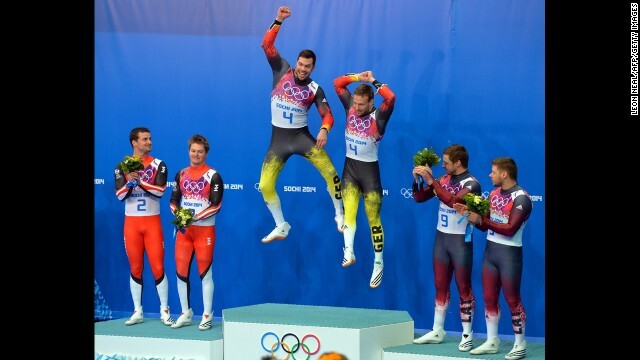 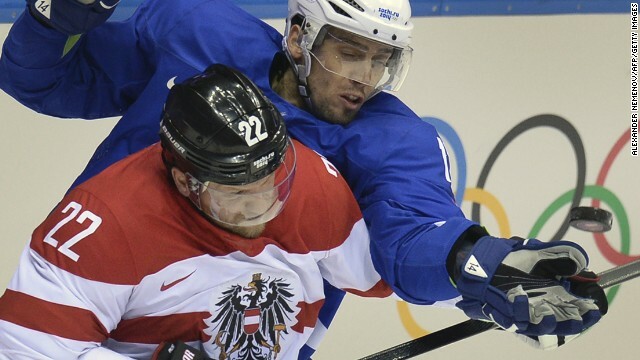 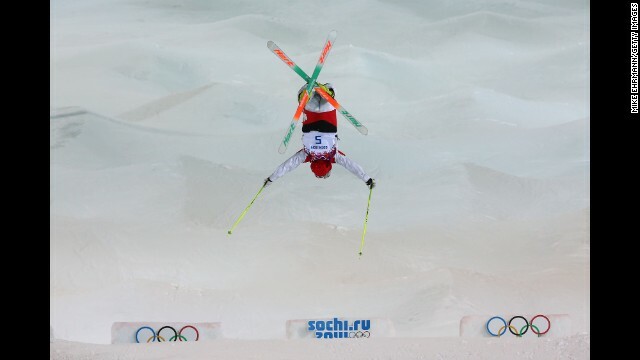 Dominik Landertinger of Austria took silver while Jaroslav Soukup from the Czech Republic got the bronze. 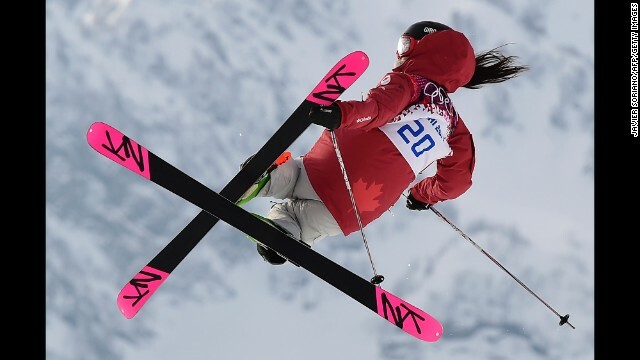 In the final event of the first day, Canadian sisters Justine Dufour-Lapointe and Chloe Dufour-Lapointe claimed the gold and silver in the women's moguls. 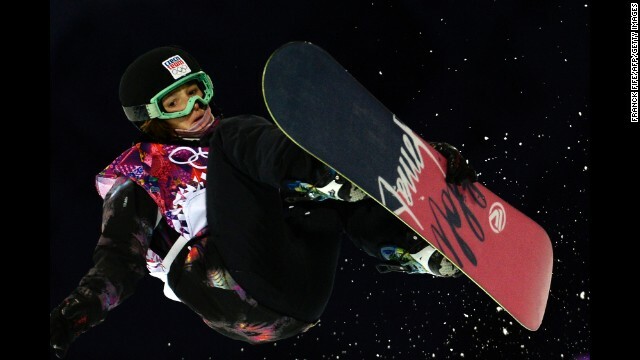 Defending champion Hannah Kearney from the U.S. had to settle for the bronze. 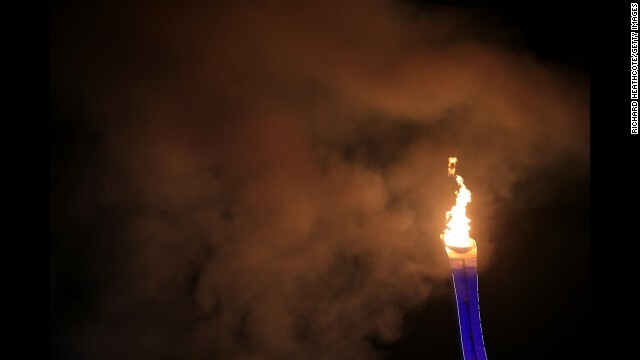 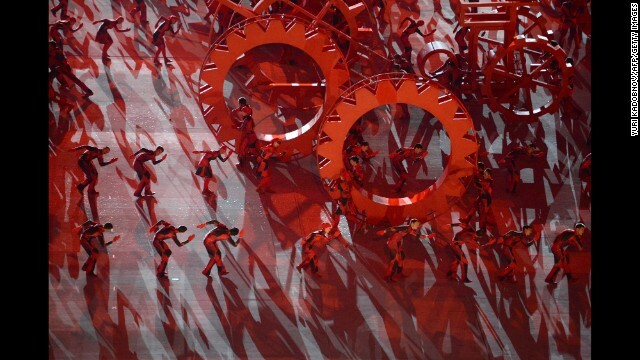 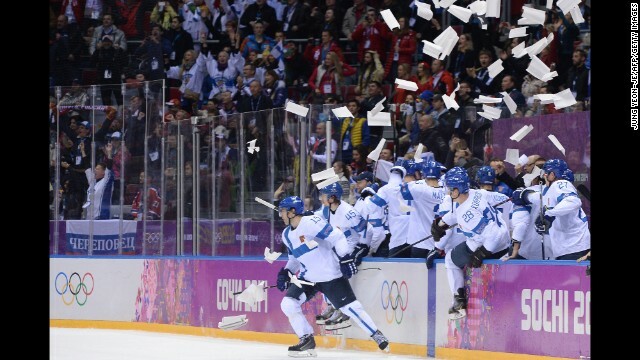 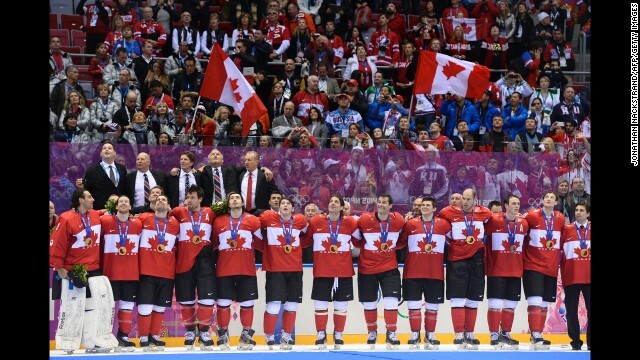 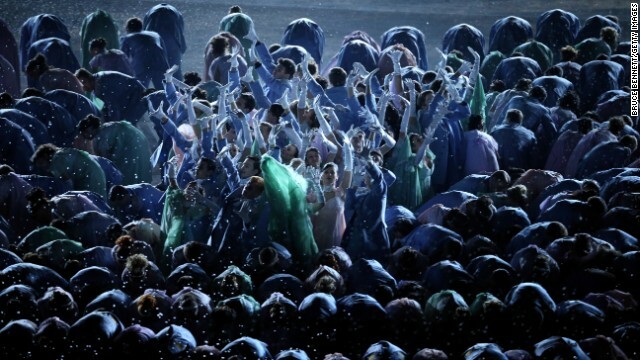 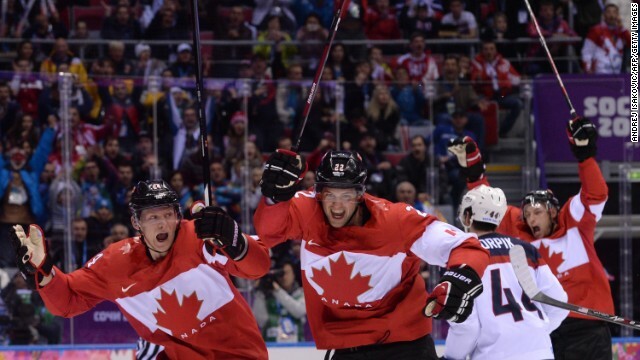 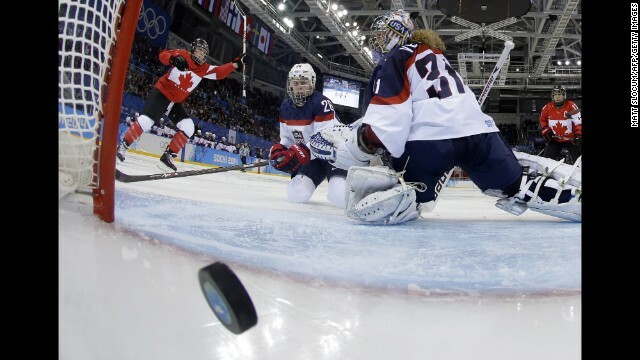 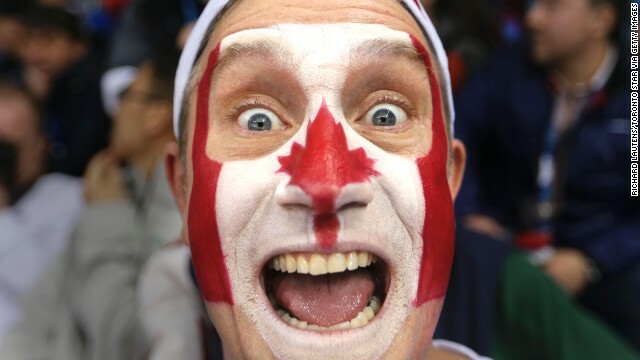 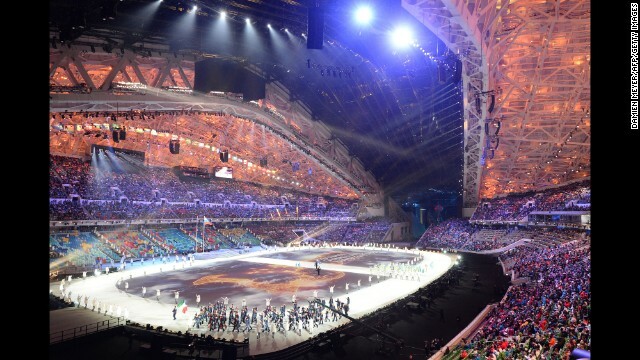 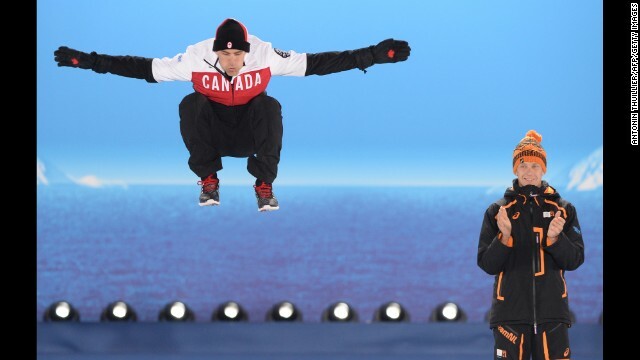 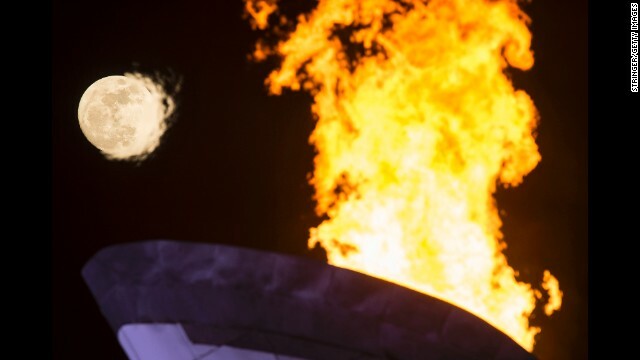 The Olympics kicked off with much fanfare at the opening ceremony Friday. 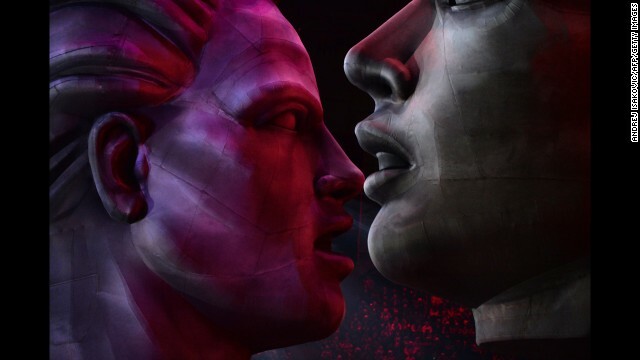 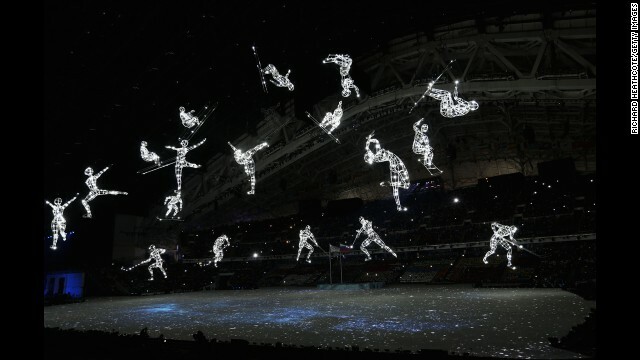 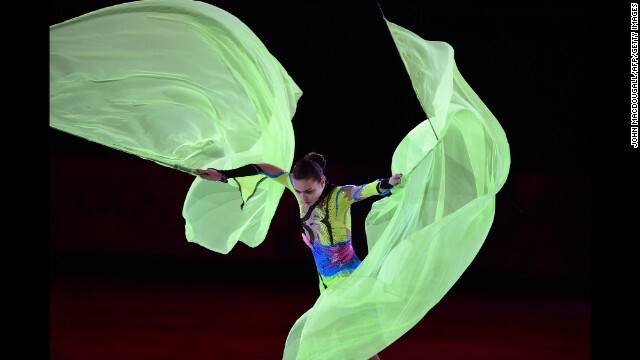 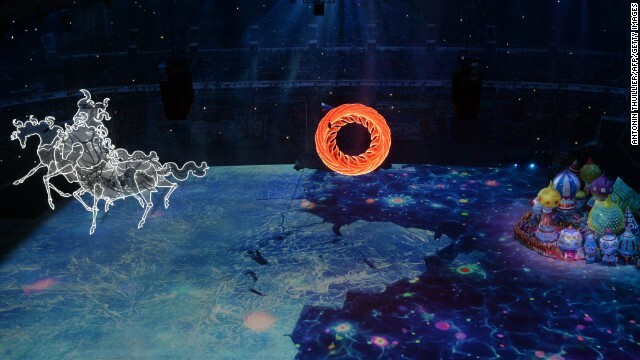 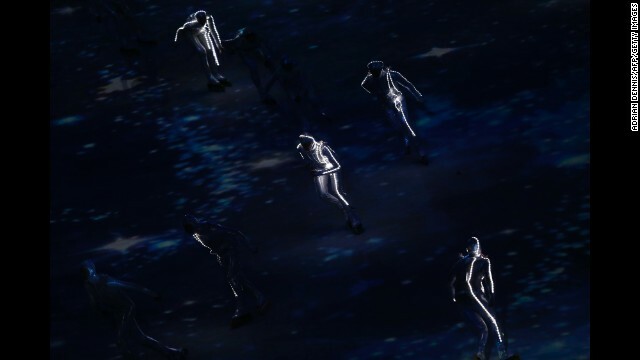 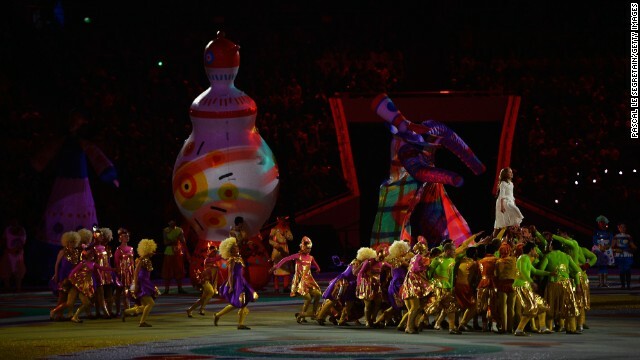 Billed as the most expensive Olympic Games in history, the opening ceremony kicked off with lights, floats and flying performers as the world turned its attention to Russia. 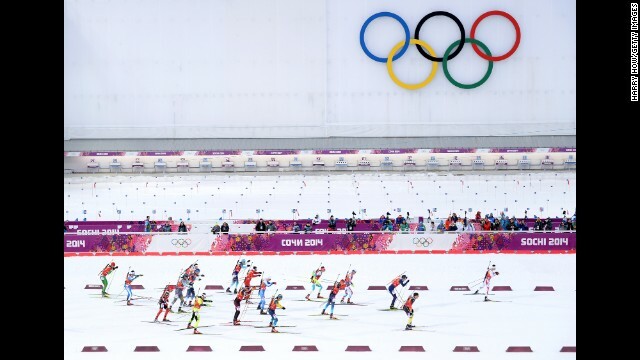 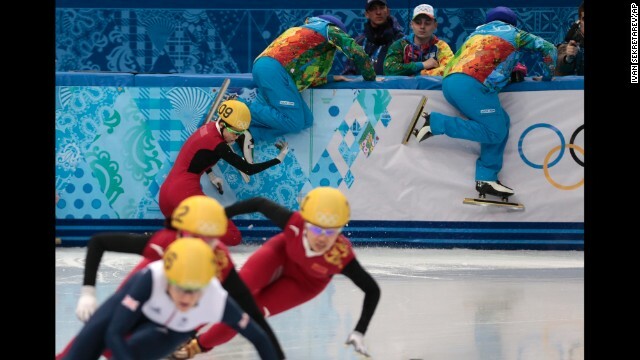 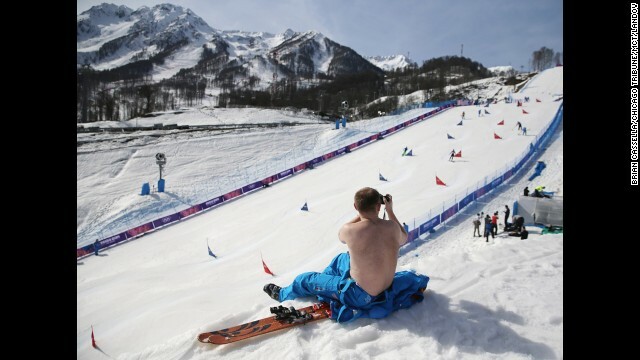 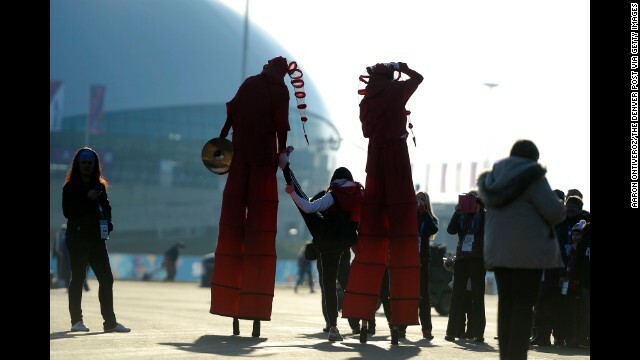 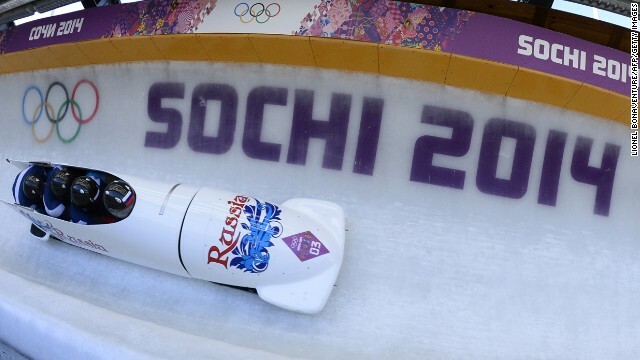 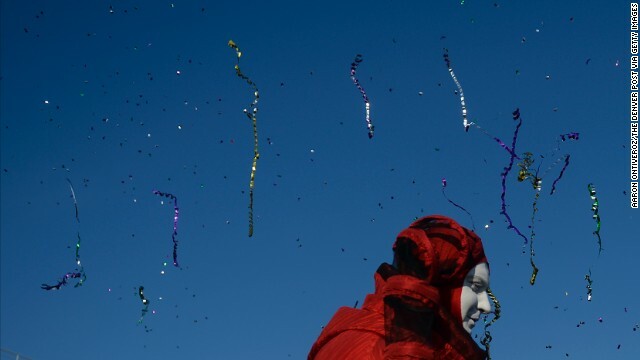 Despite anxiety about terror strikes, controversy over gay rights and ridicule for poor preparations, the nation's officials have maintained that the sites in Sochi are secure. 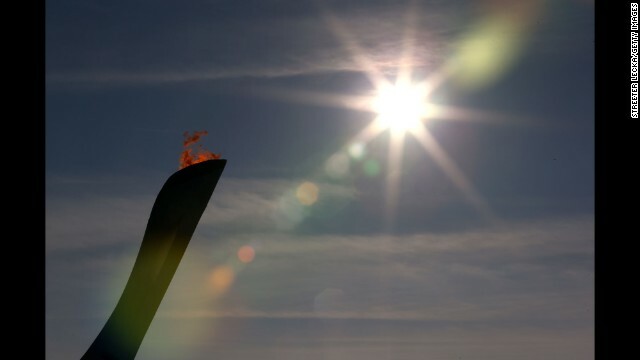 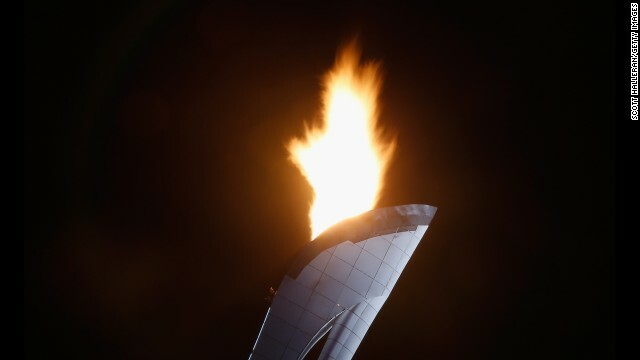 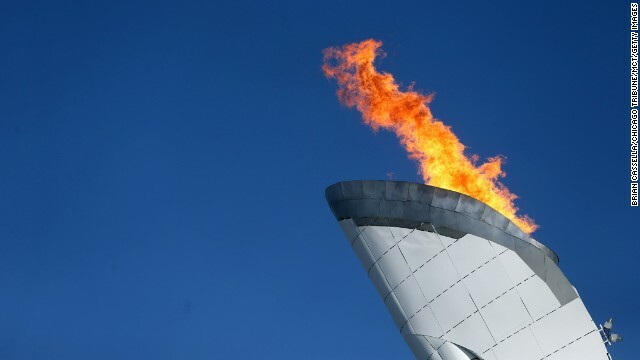 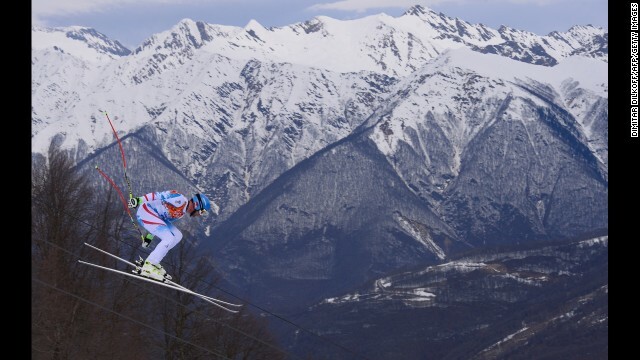 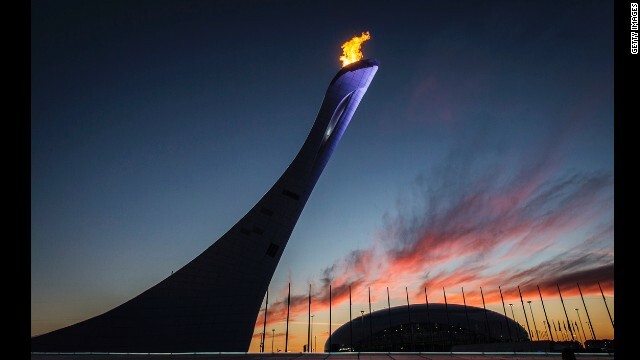 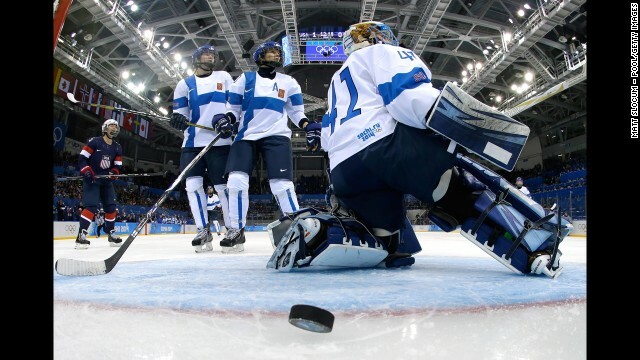 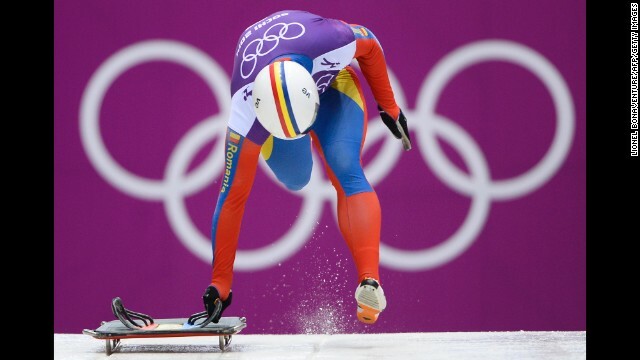 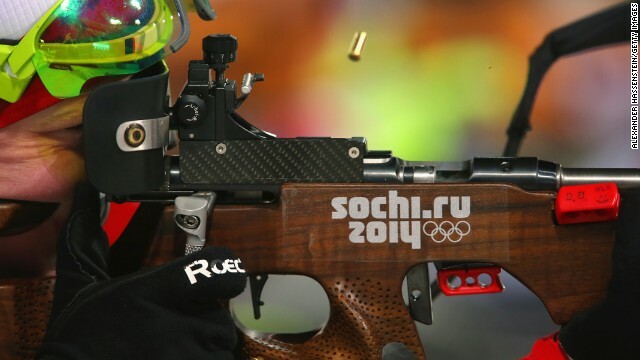 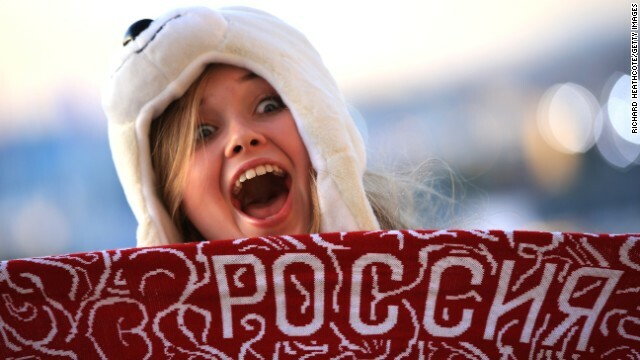 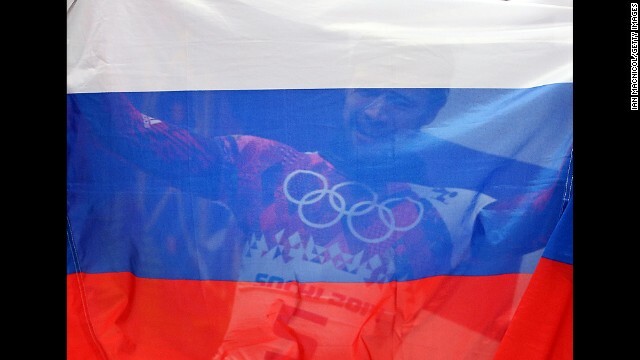 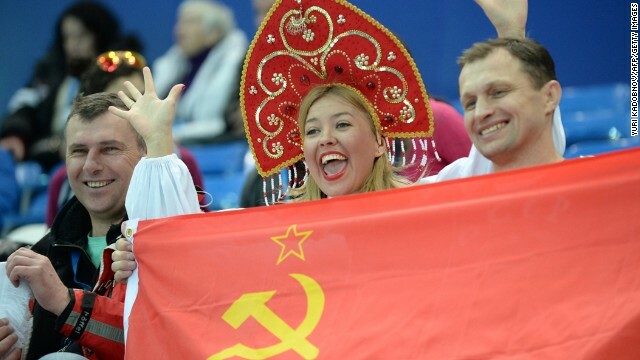 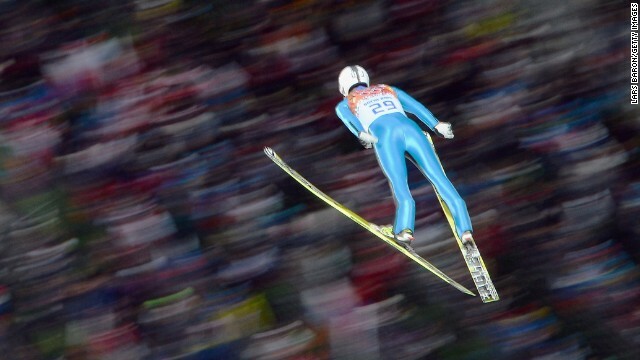 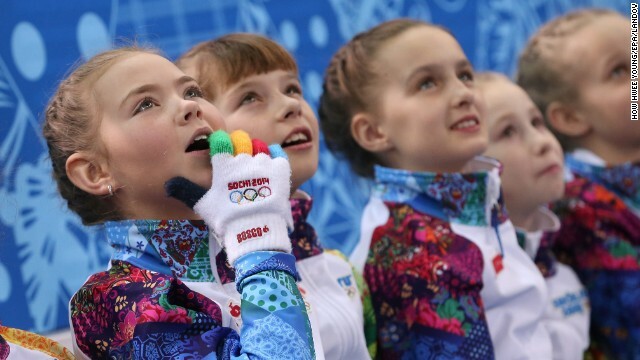 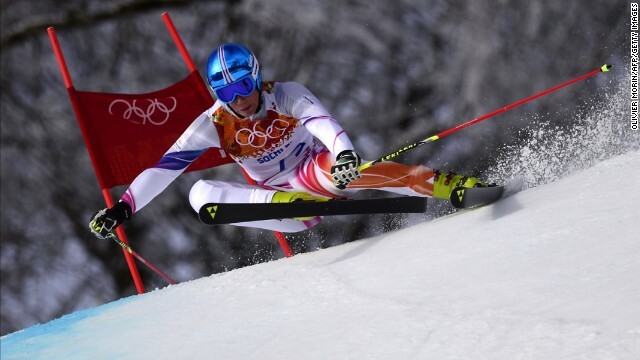 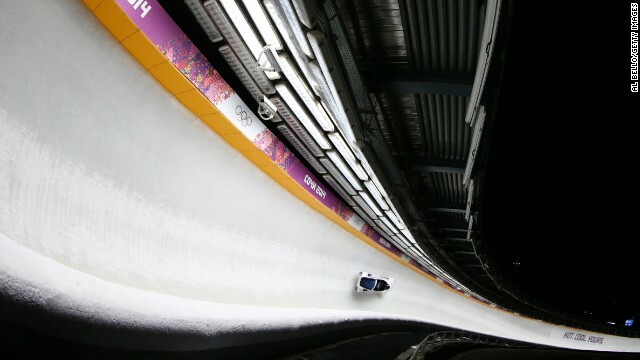 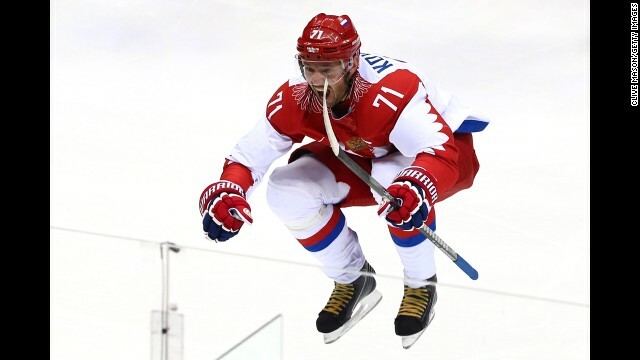 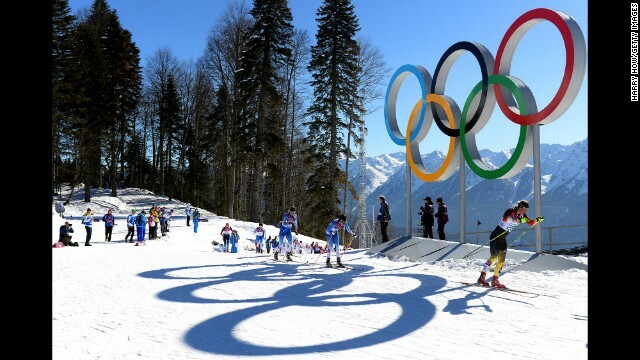 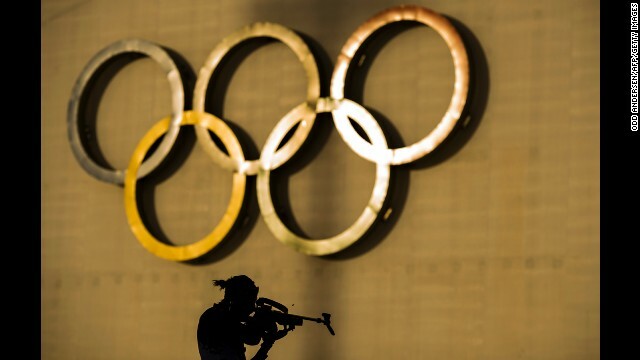 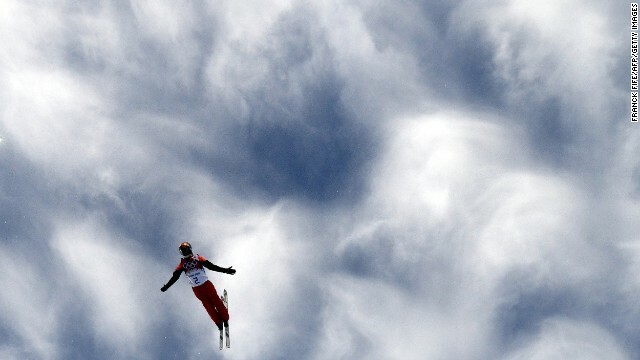 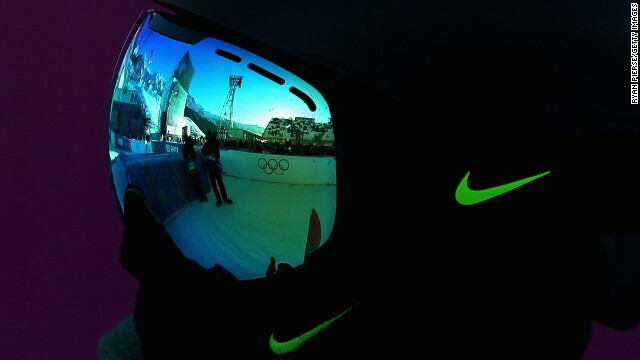 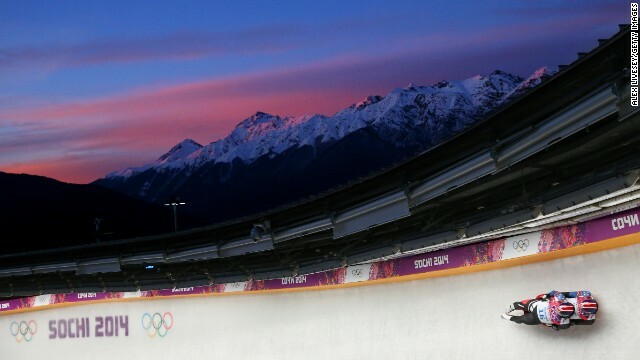 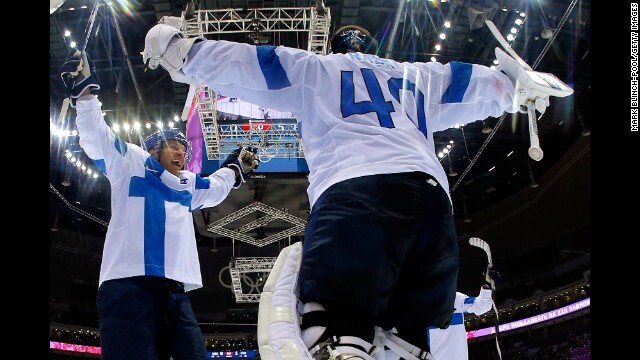 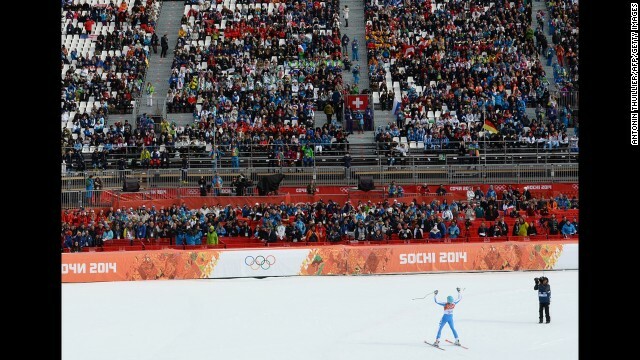 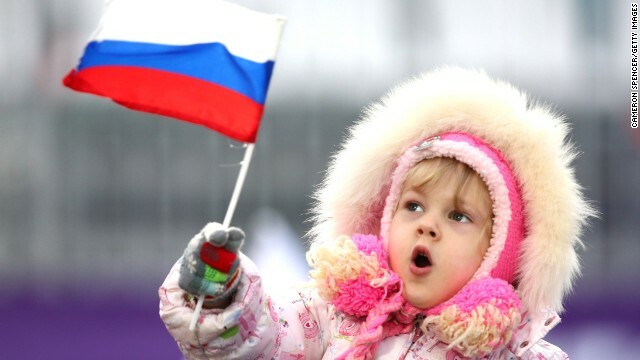 It will be "the safest place on Earth during the Olympics," said Dmitry Chernyshenko, head of the Games.